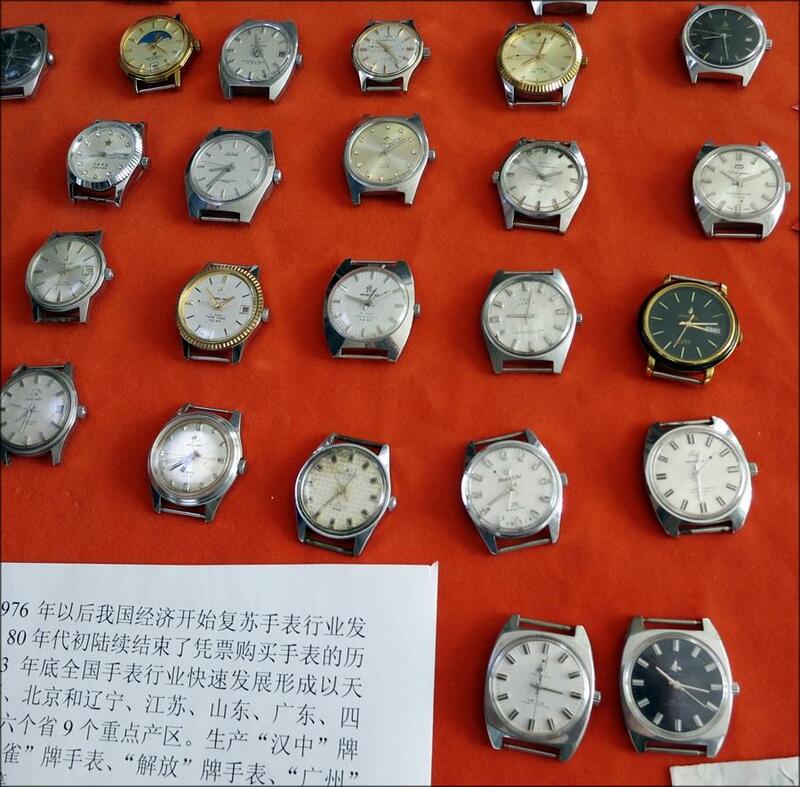 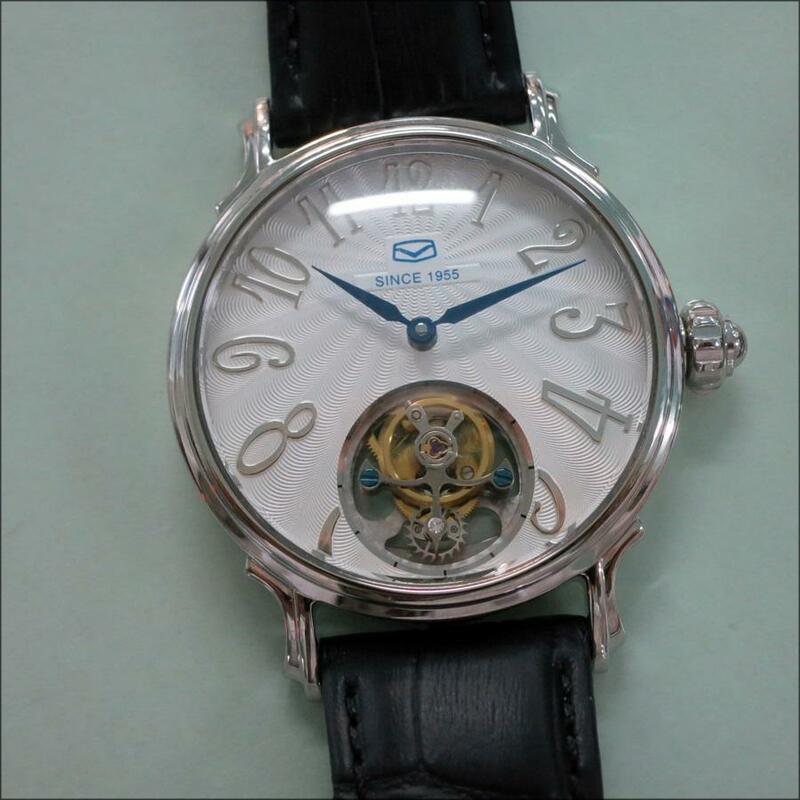 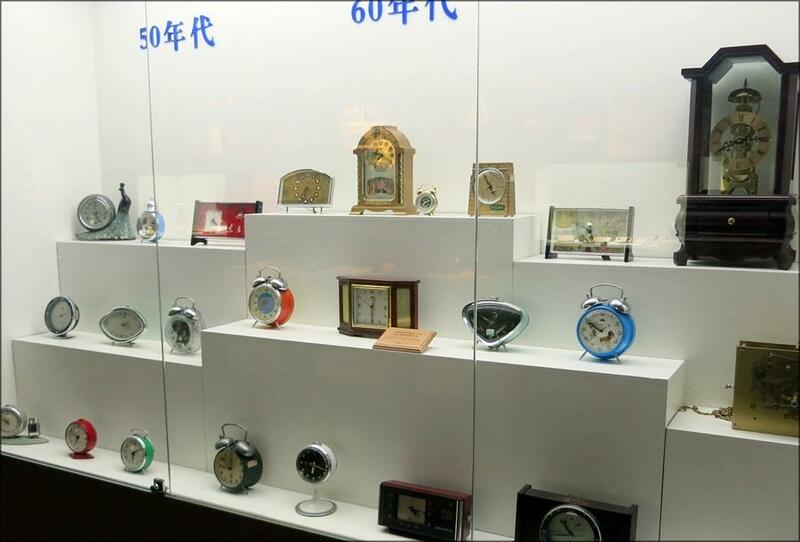 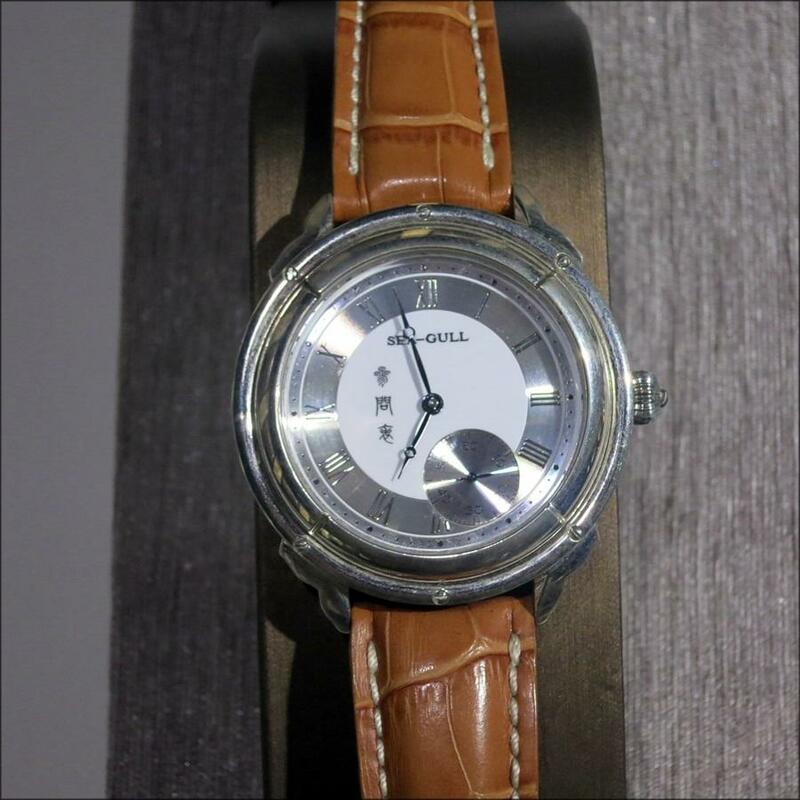 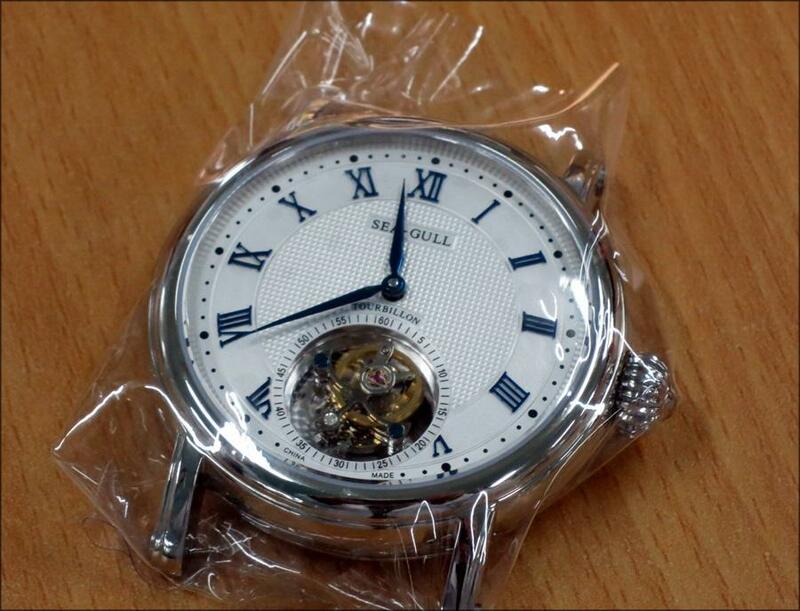 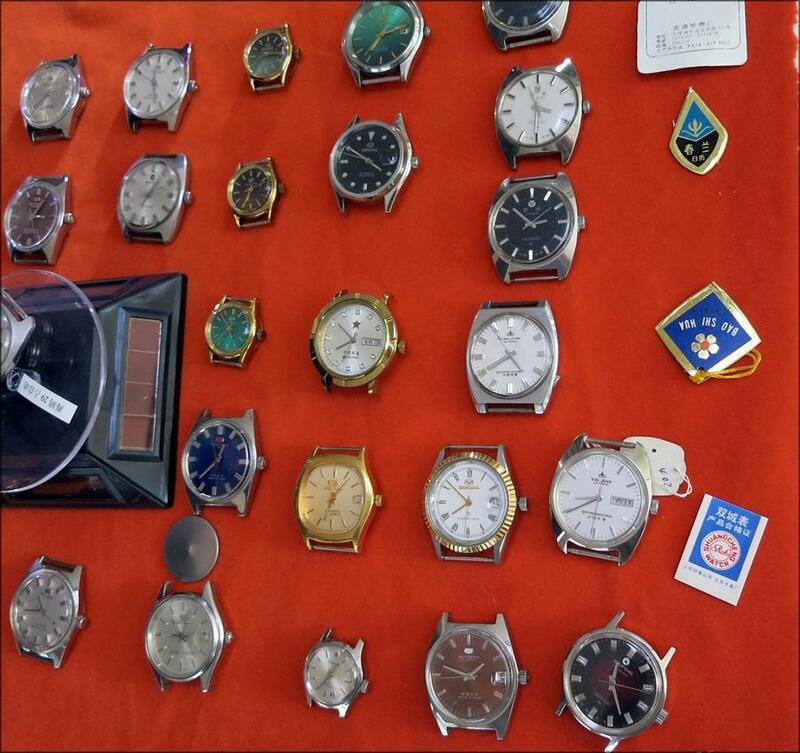 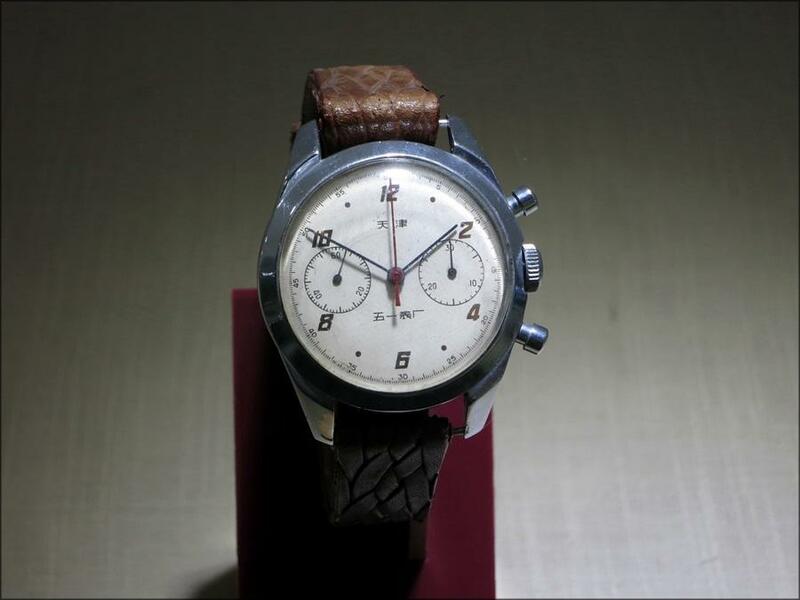 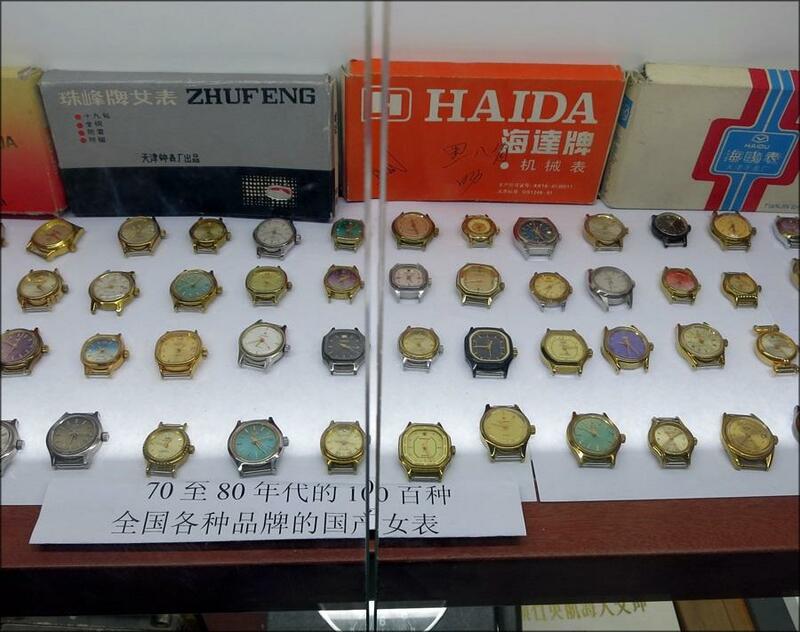 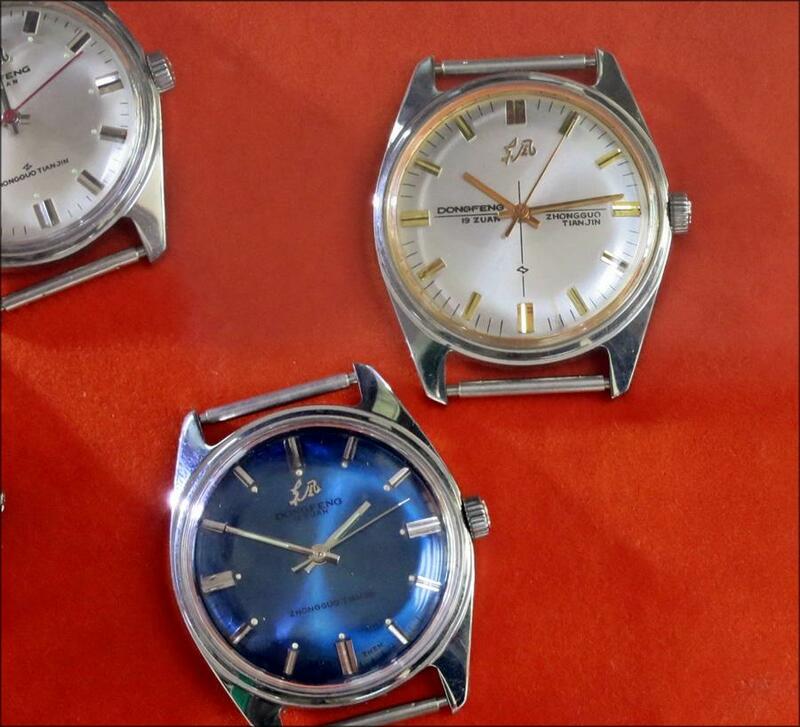 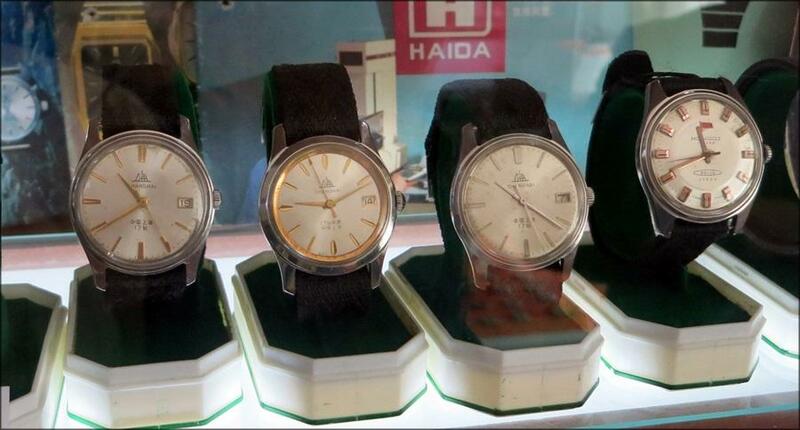 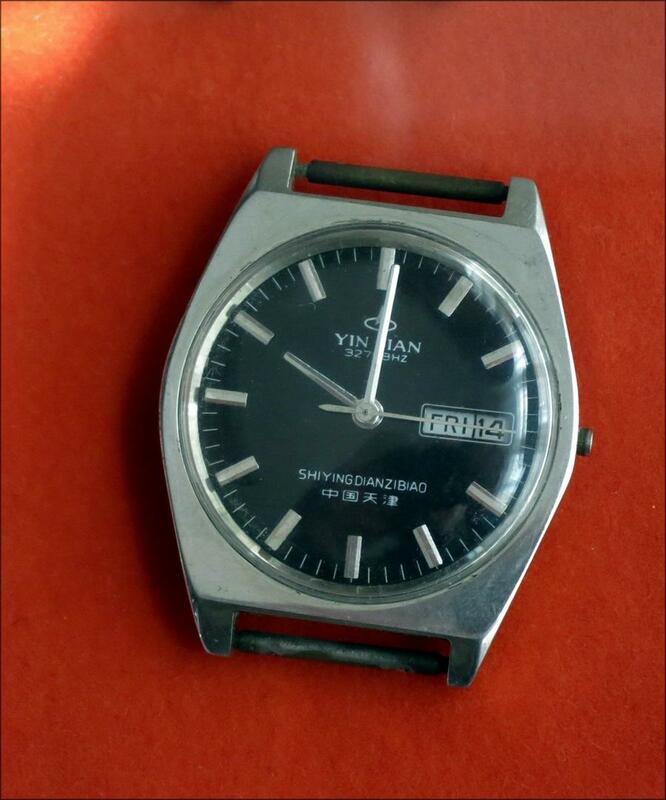 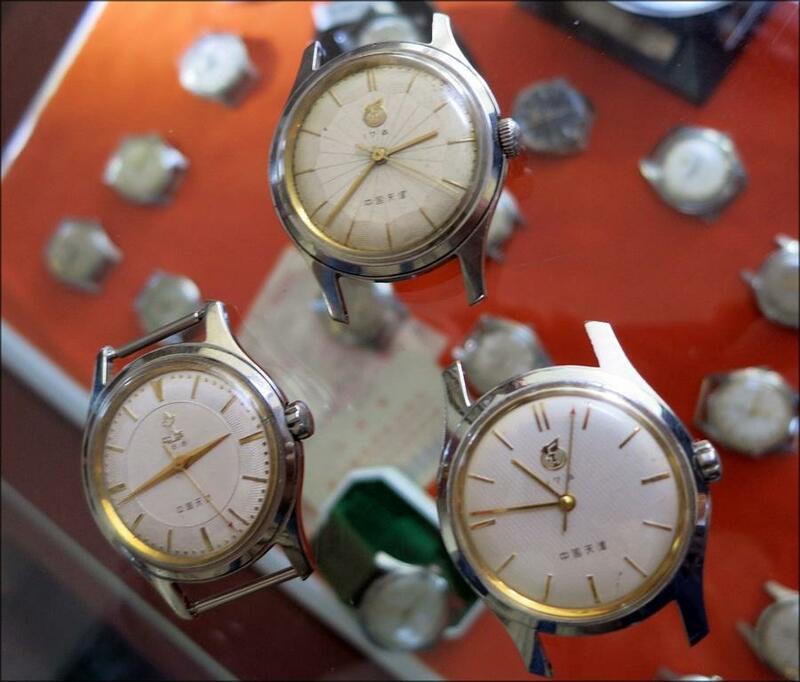 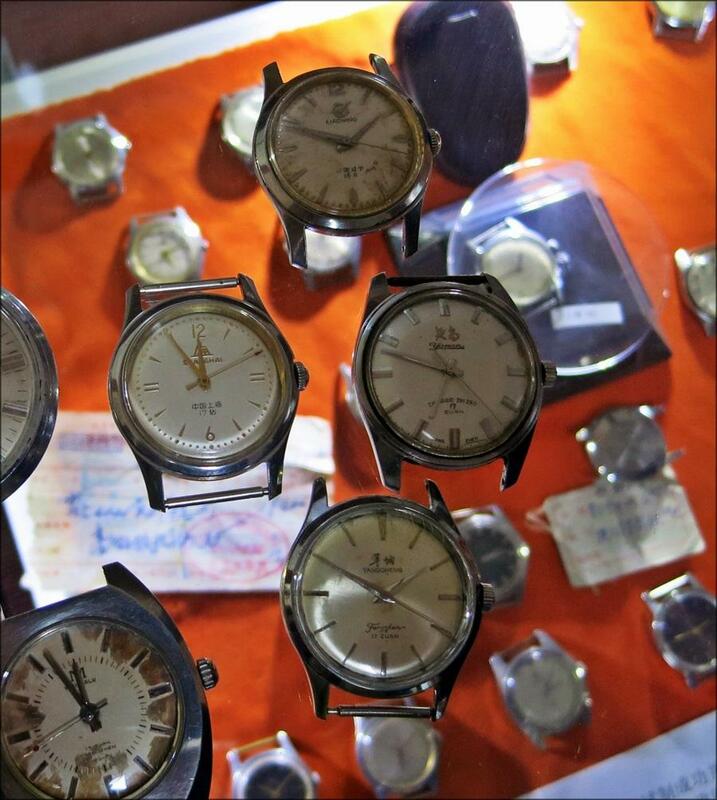 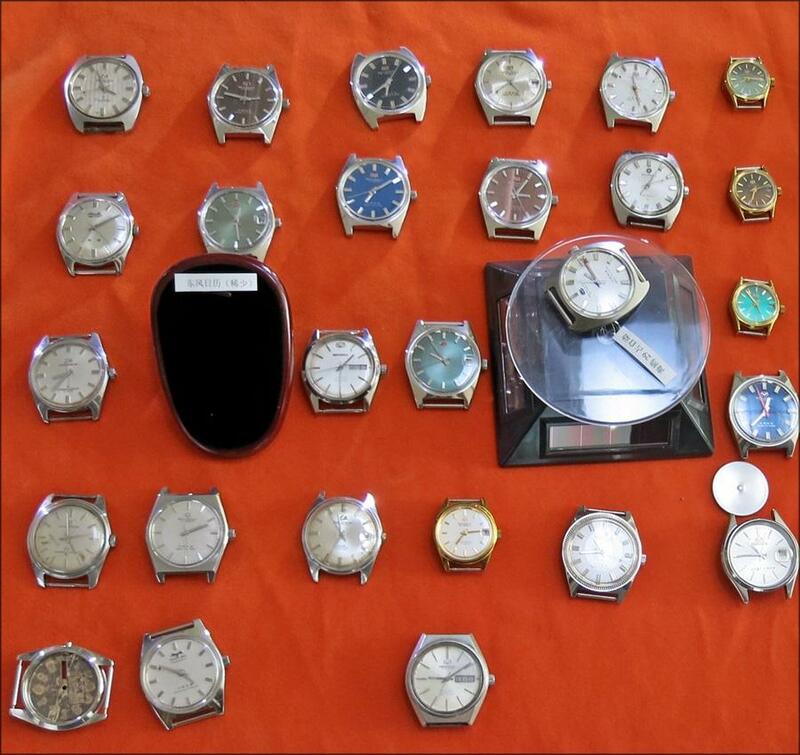 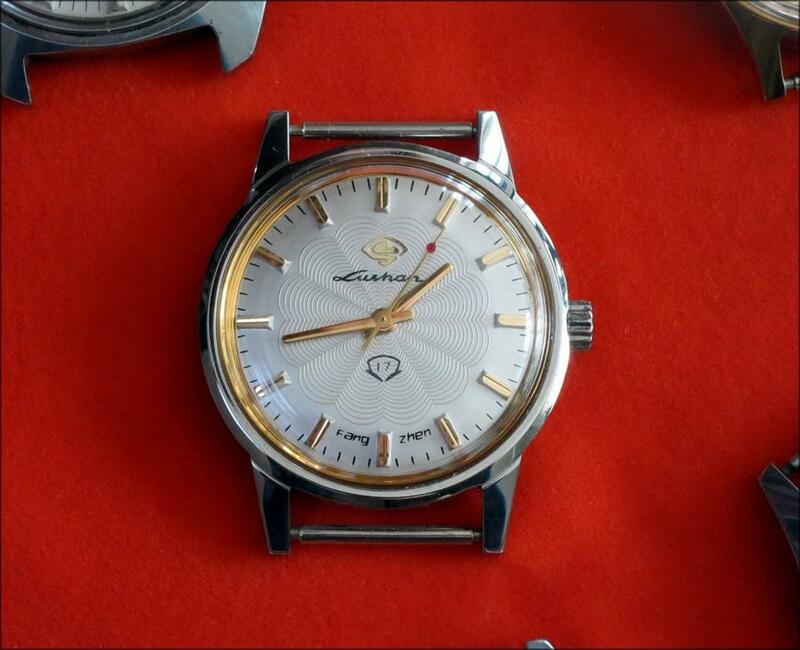 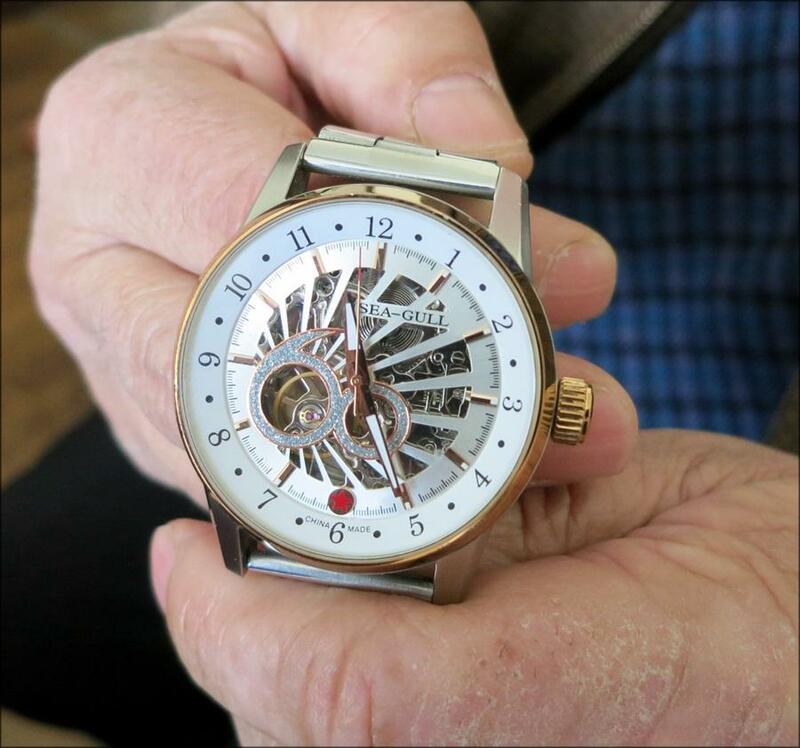 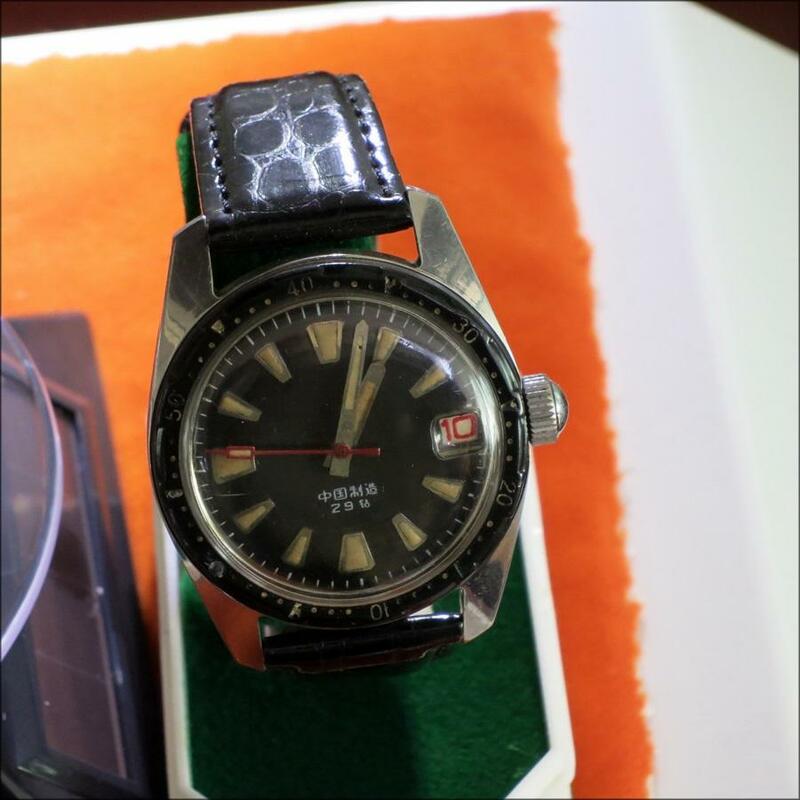 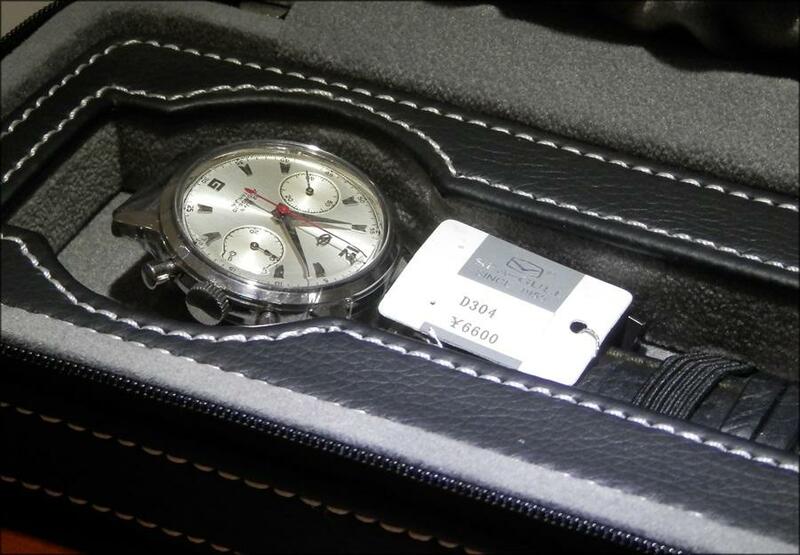 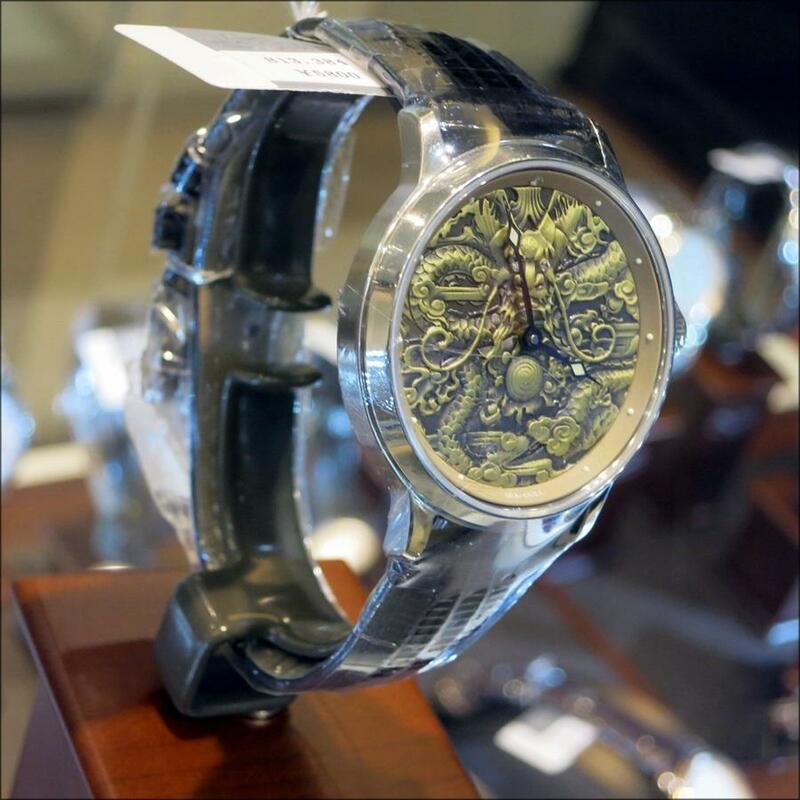 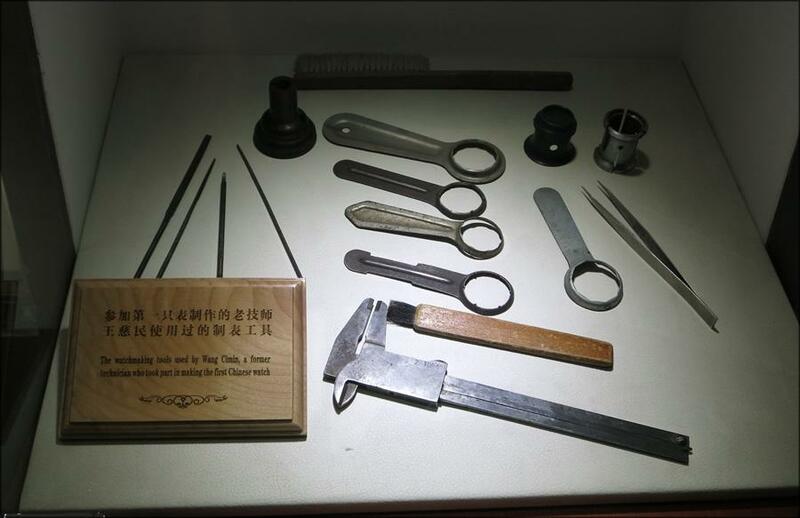 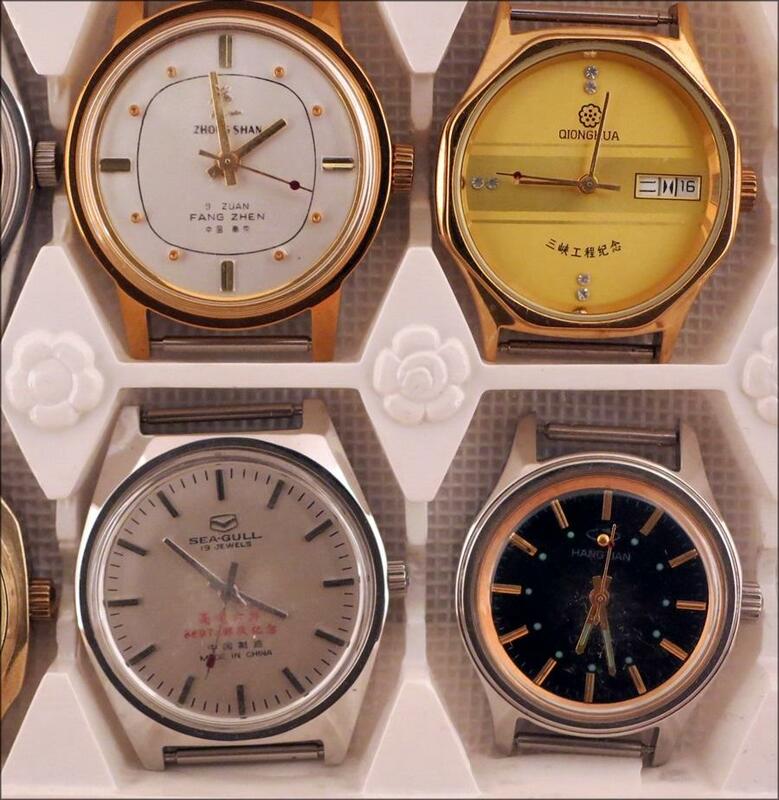 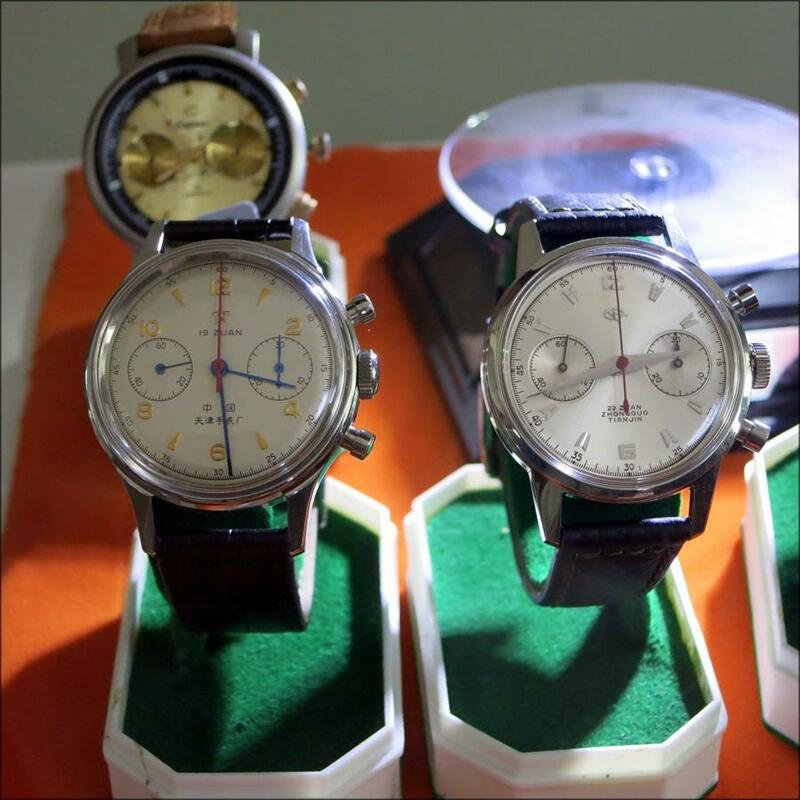 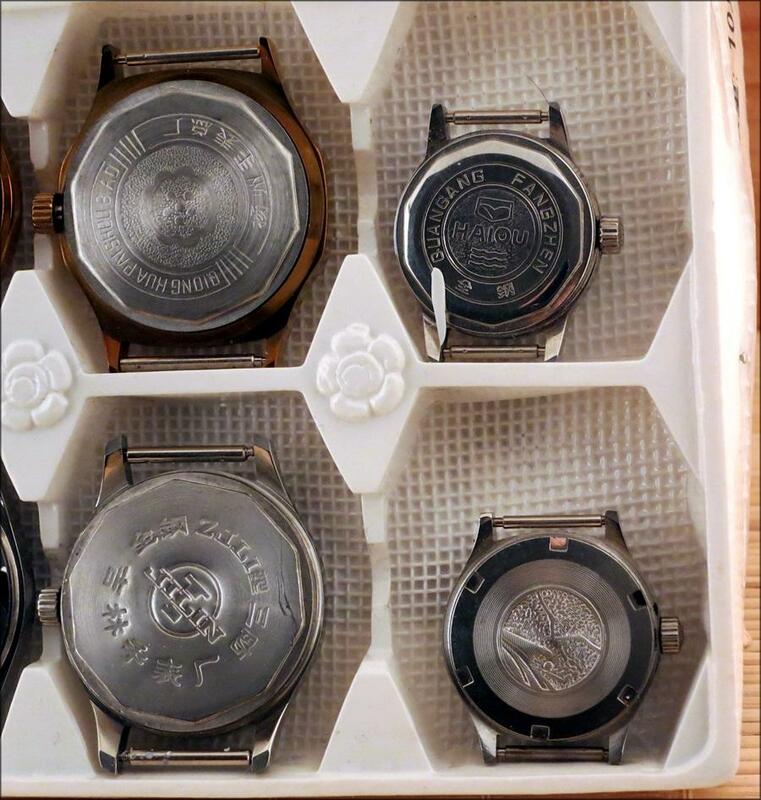 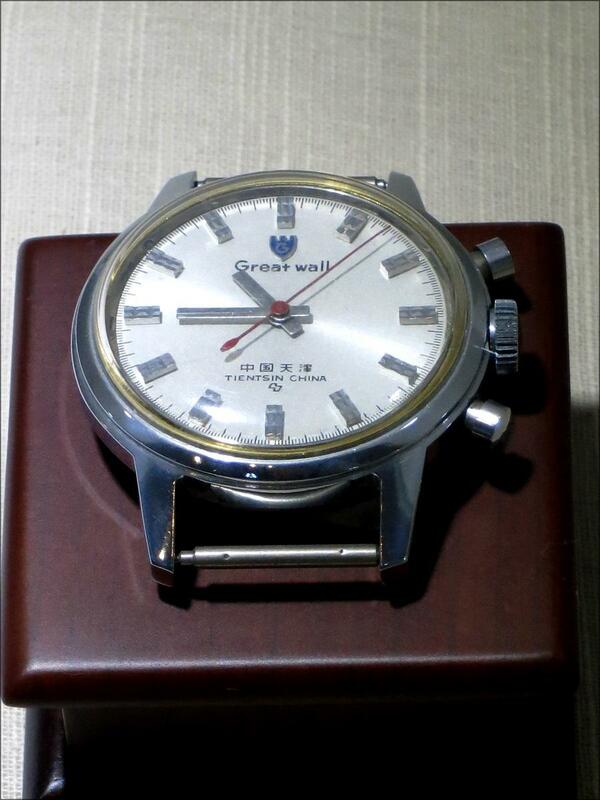 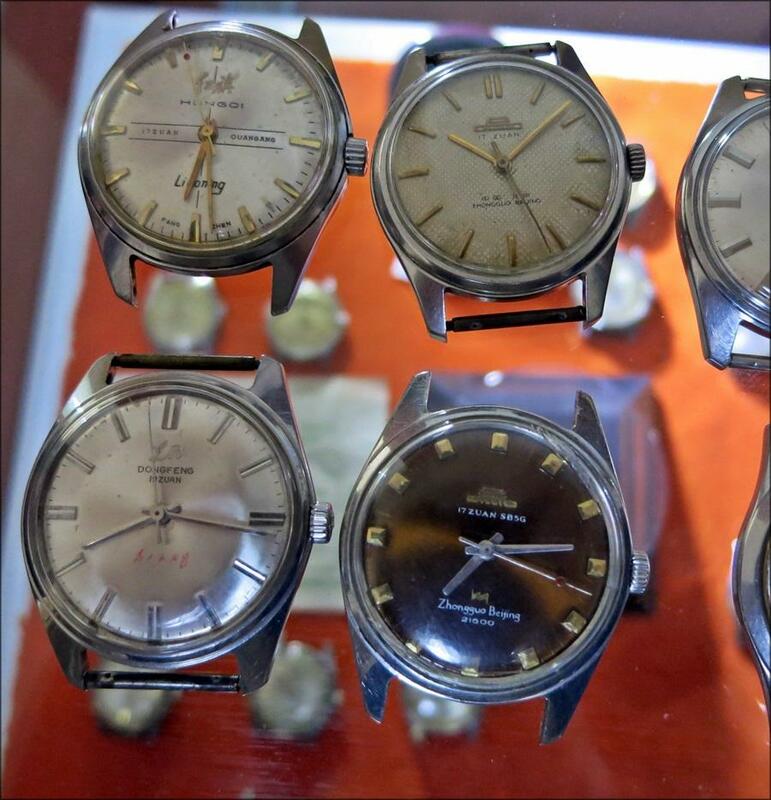 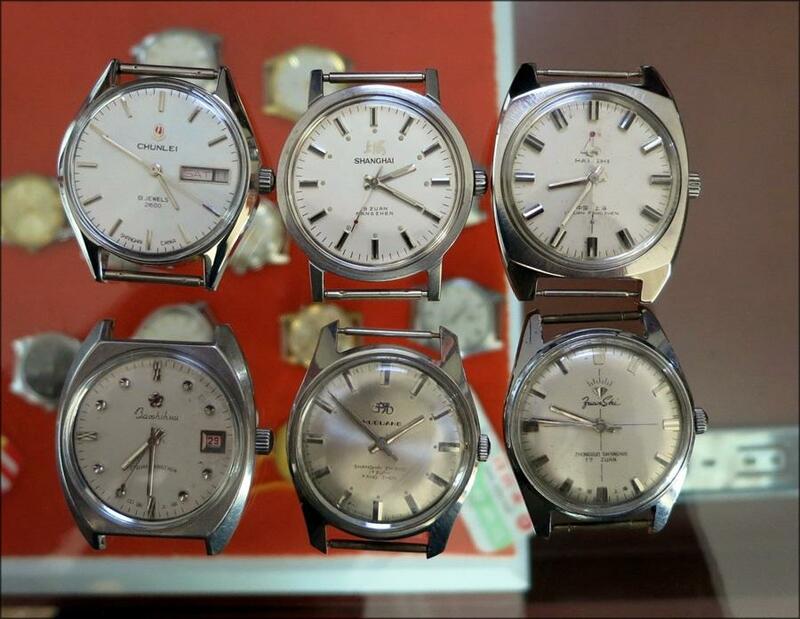 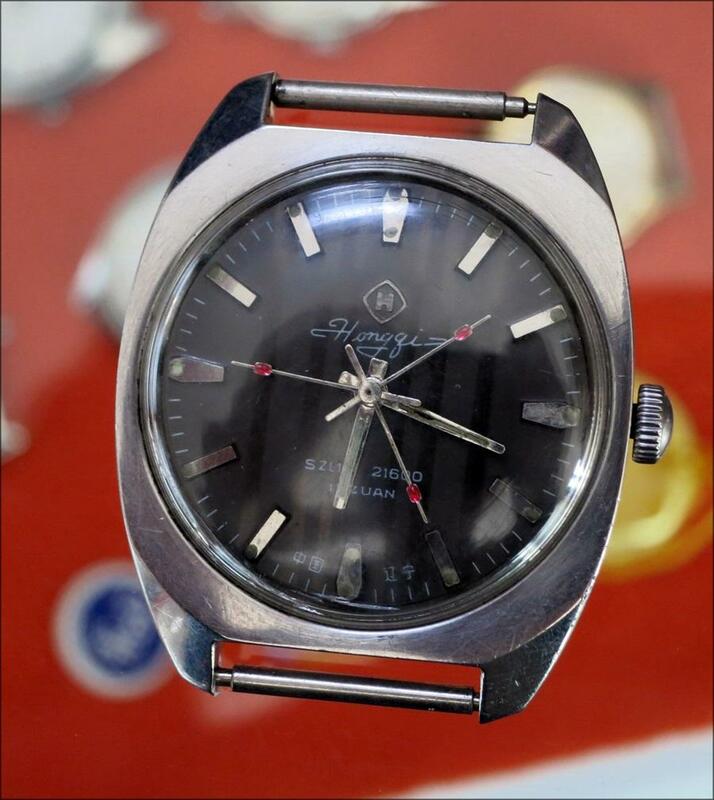 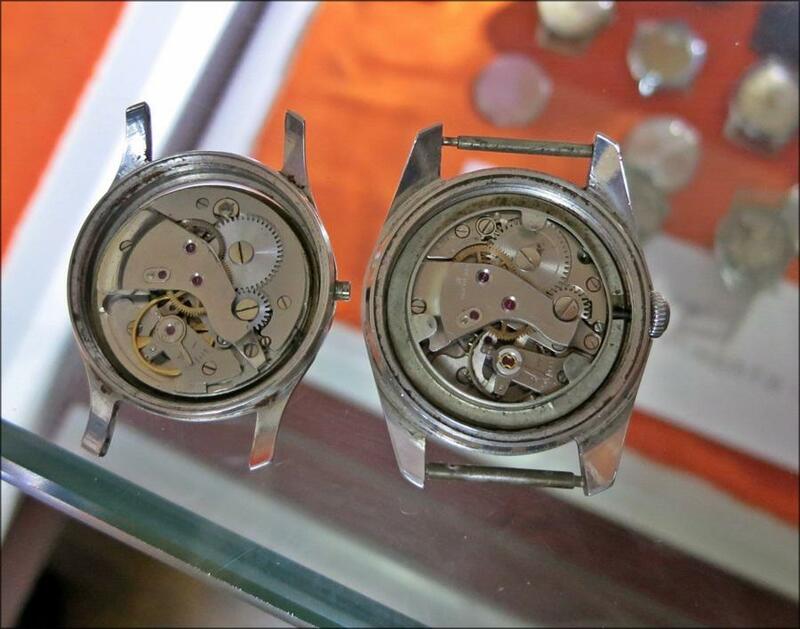 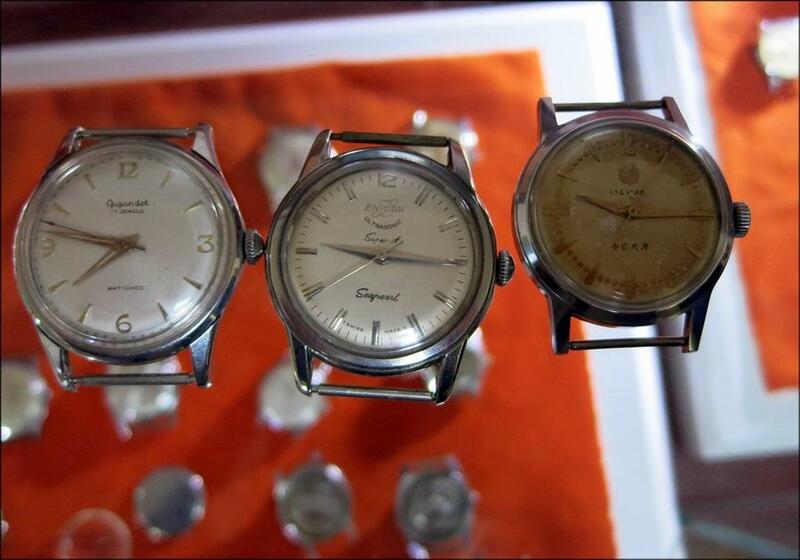 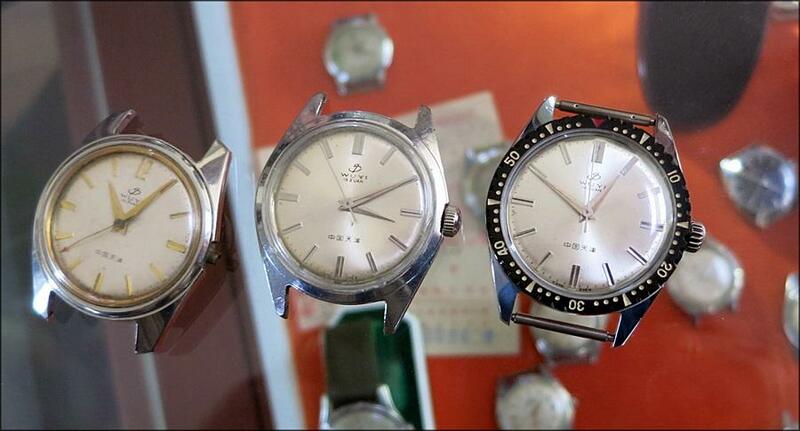 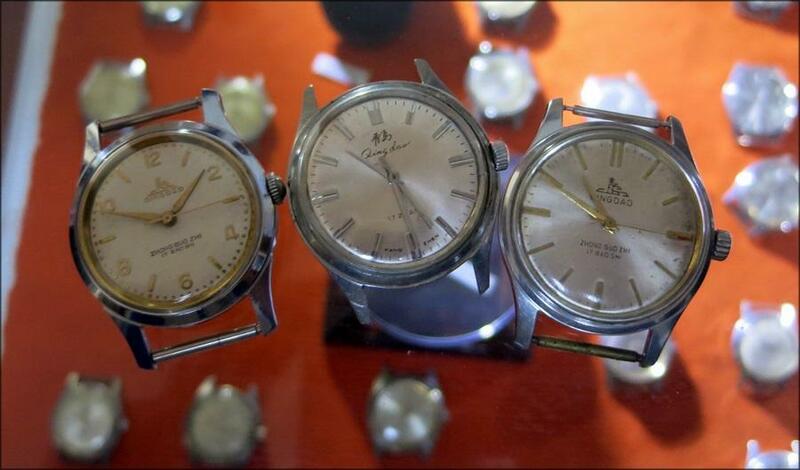 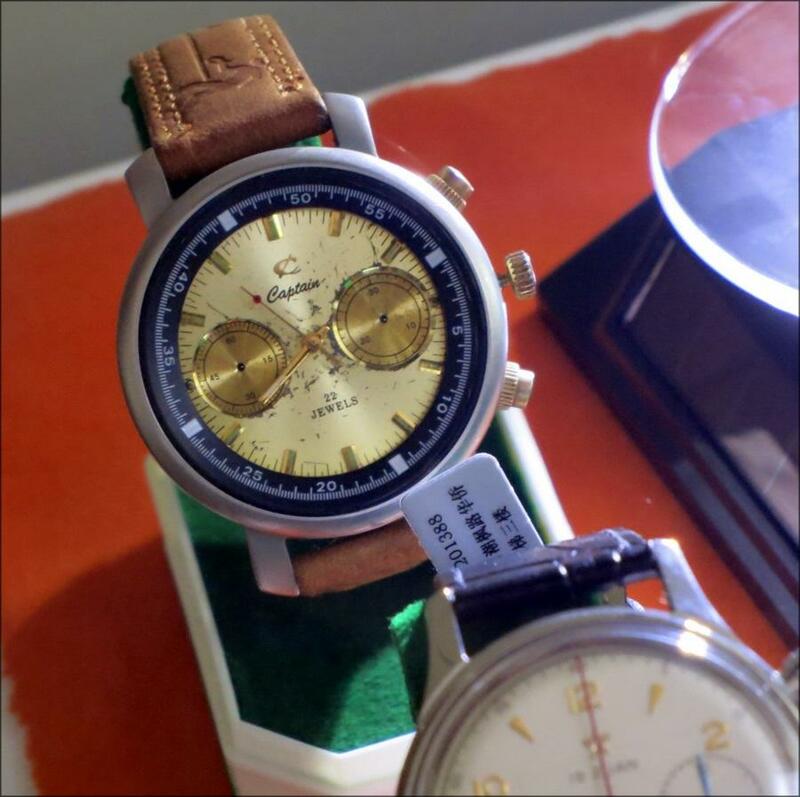 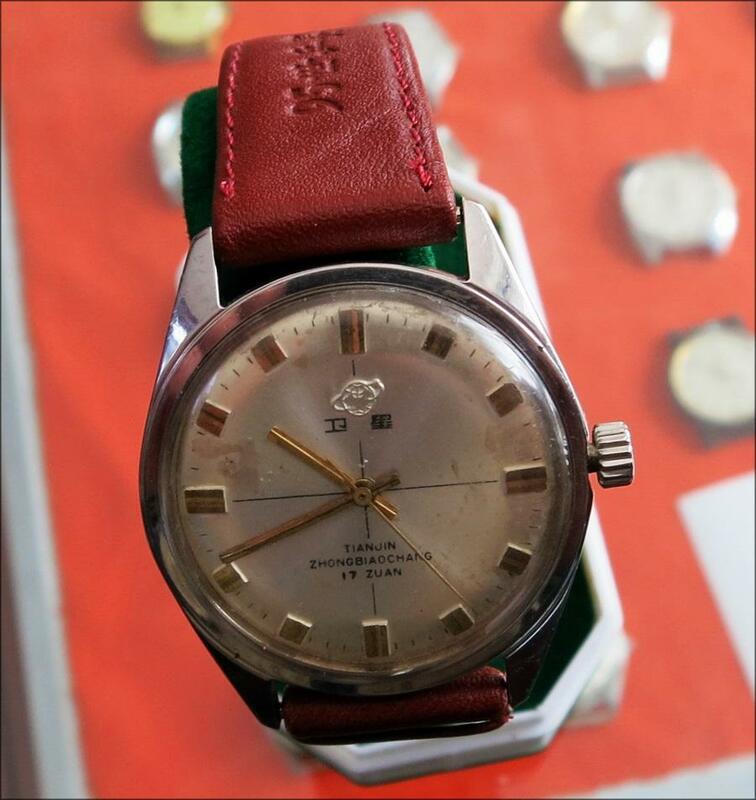 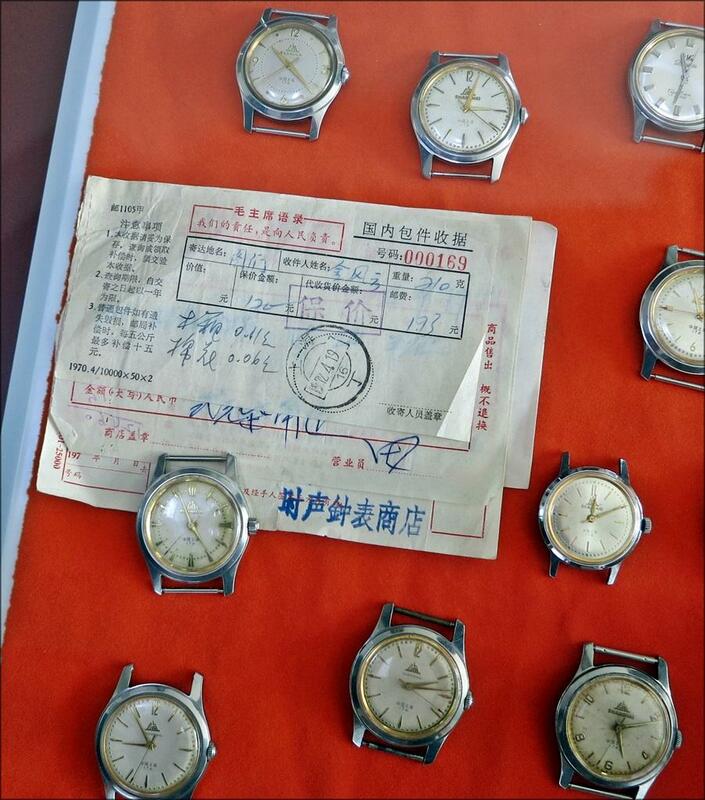 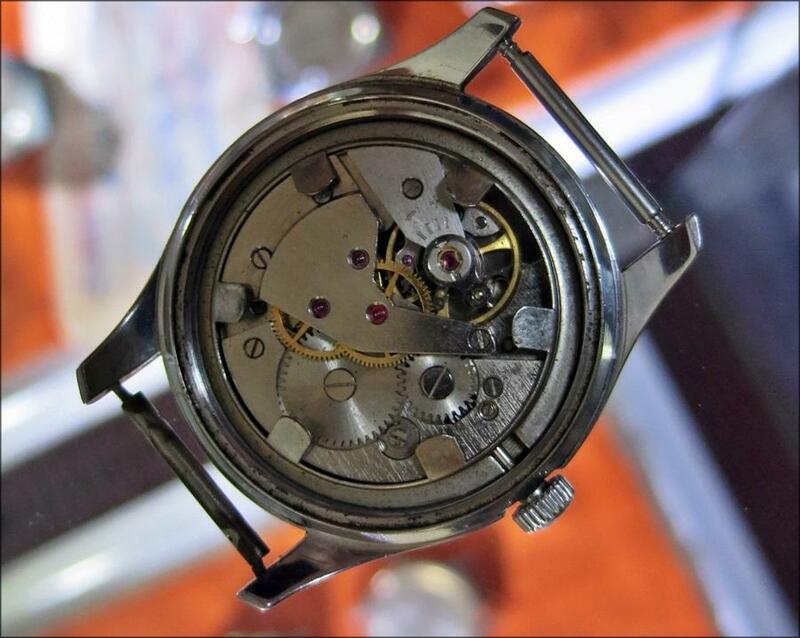 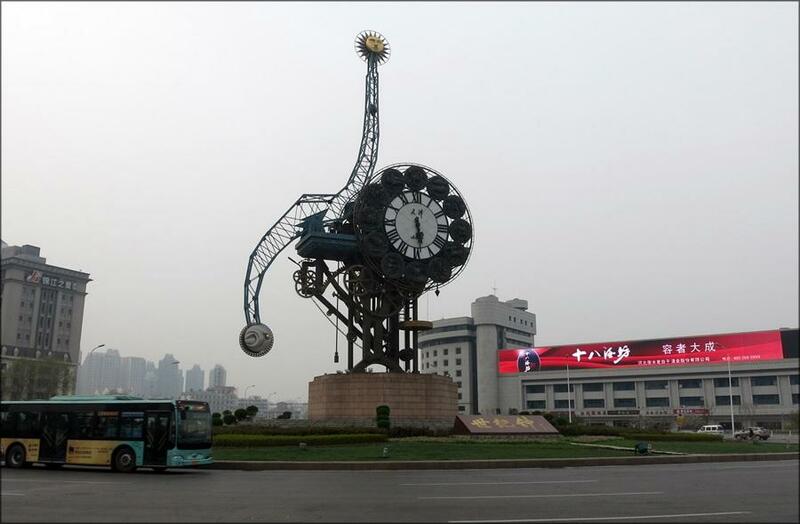 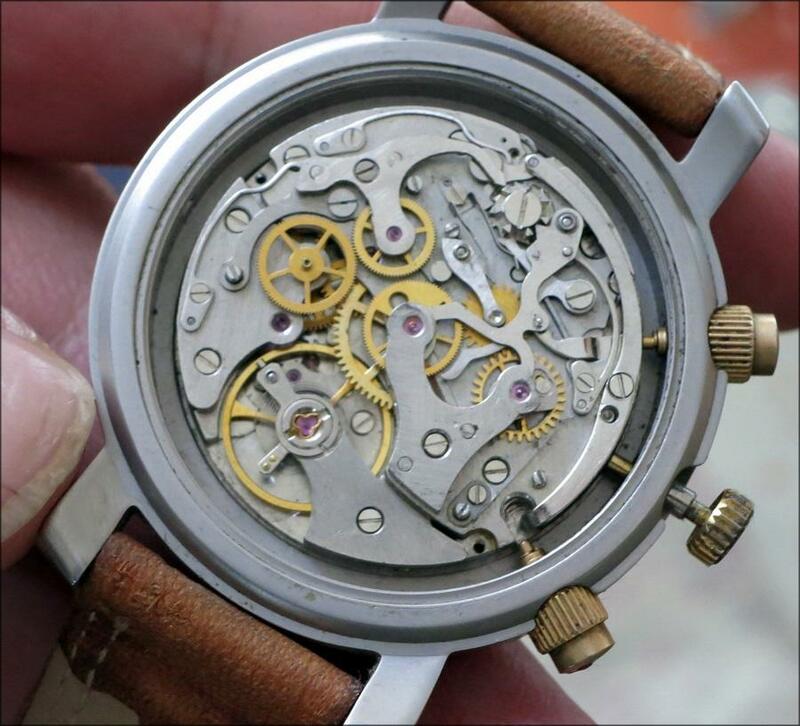 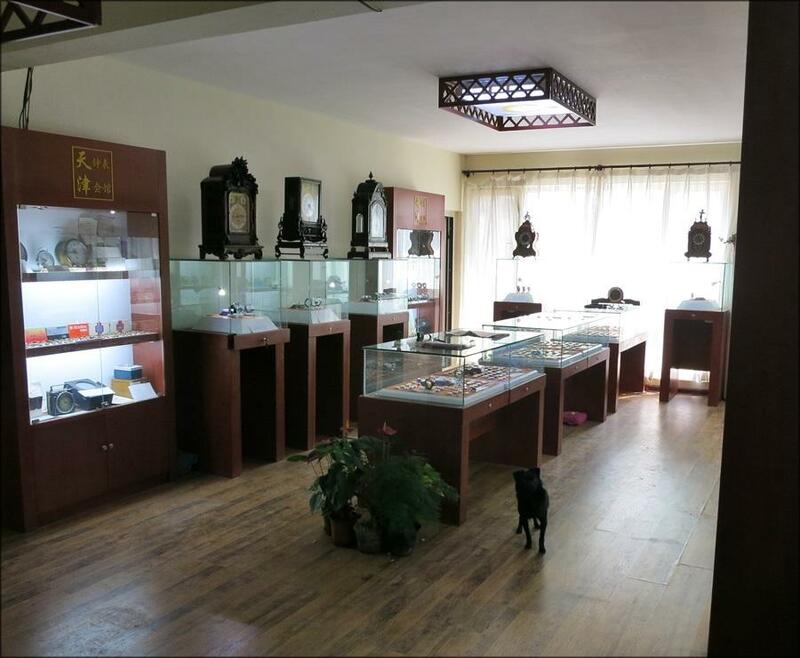 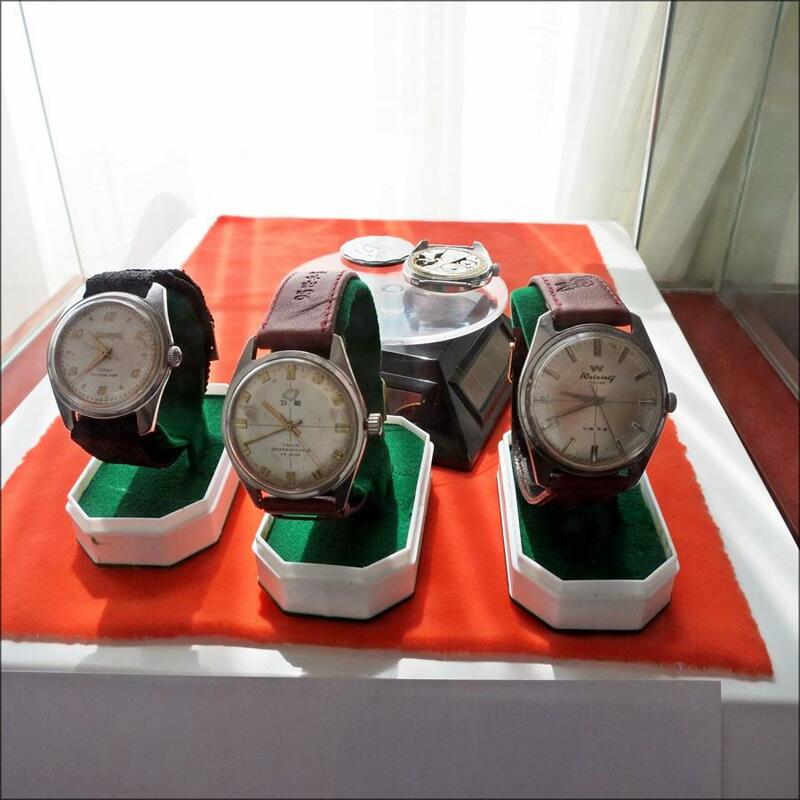 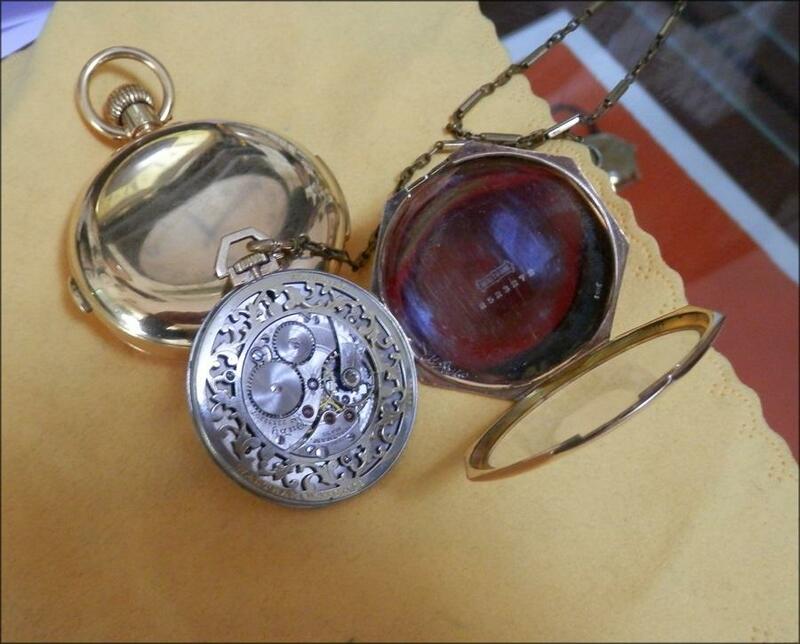 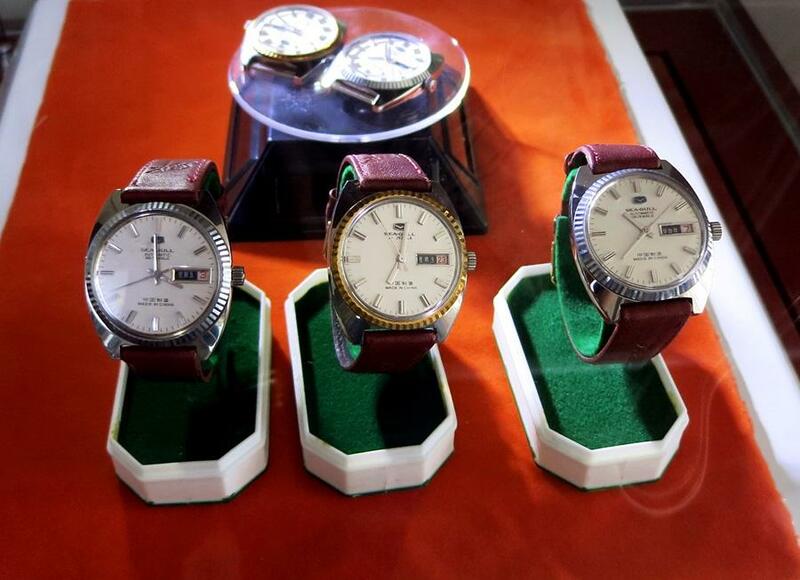 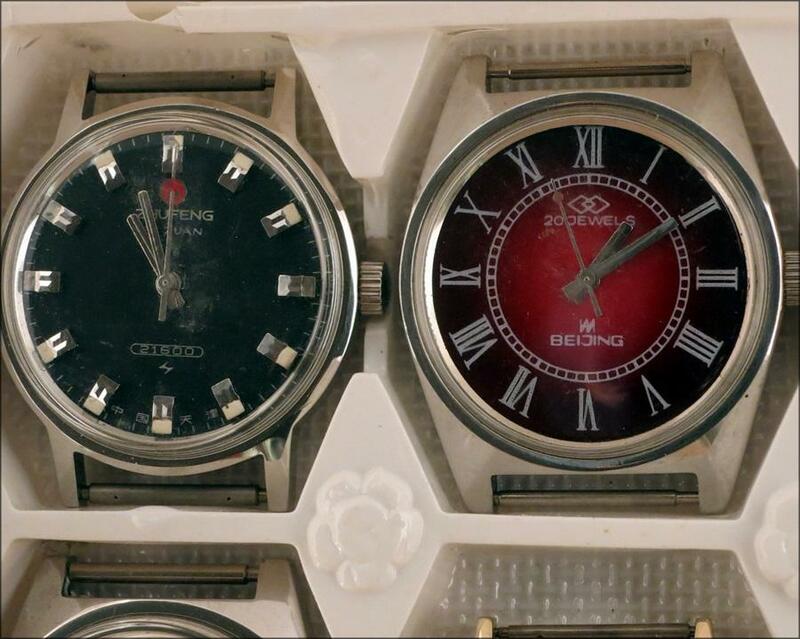 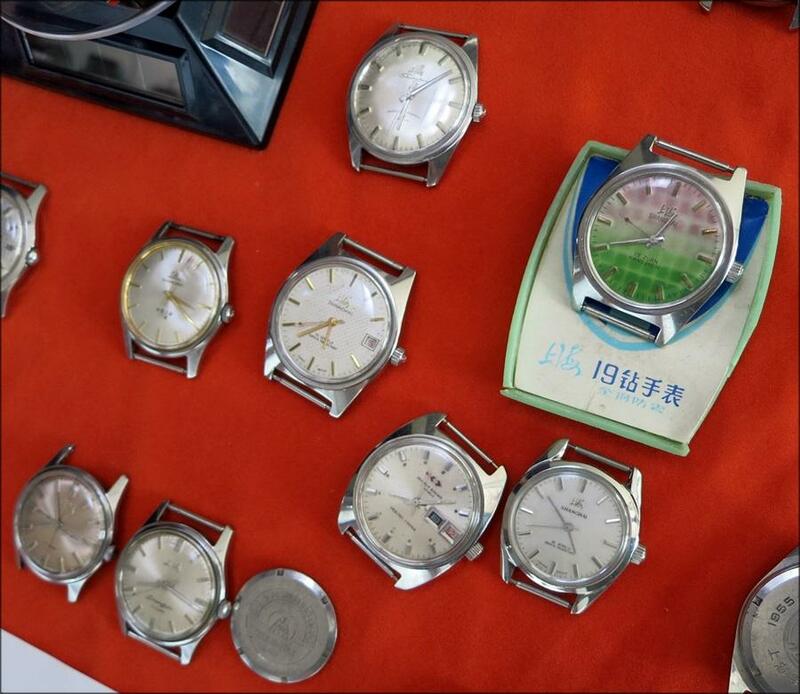 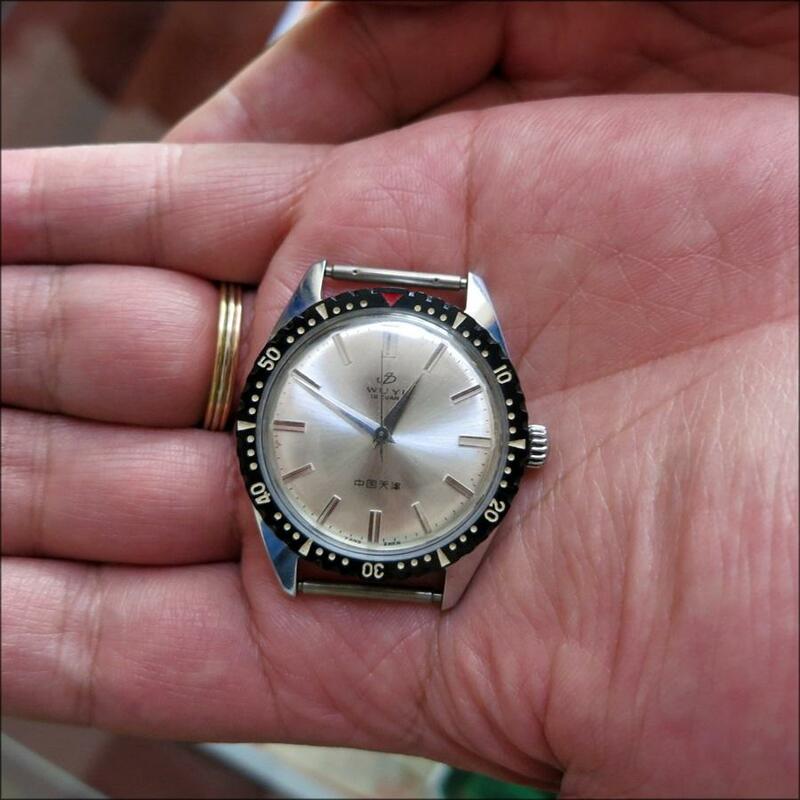 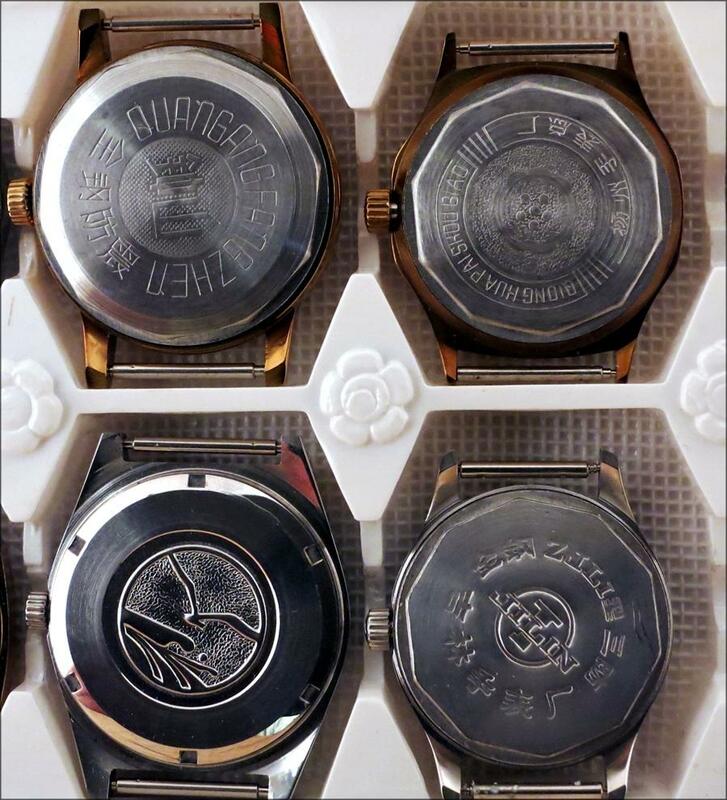 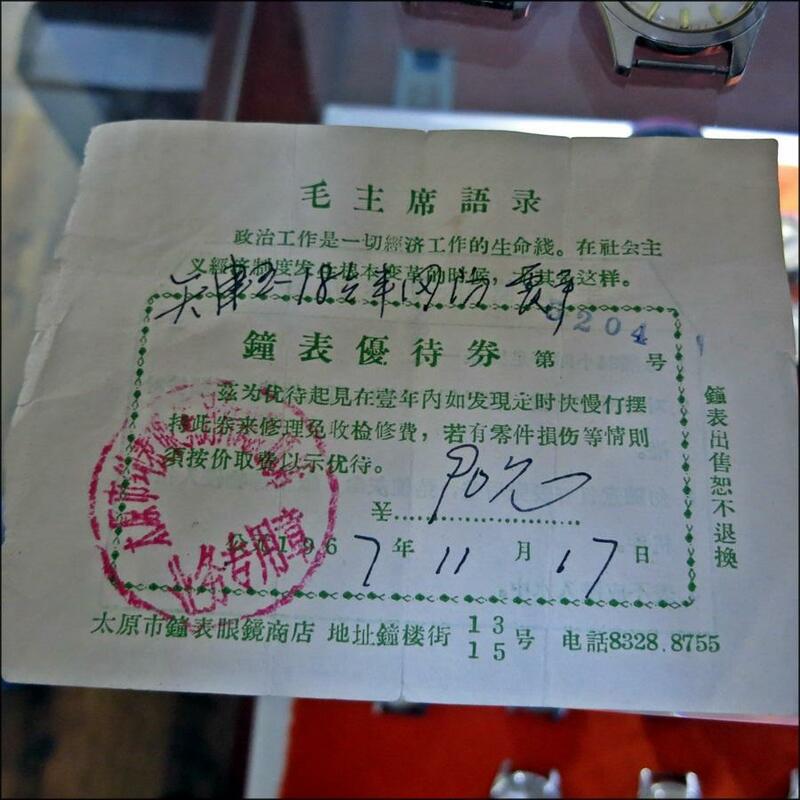 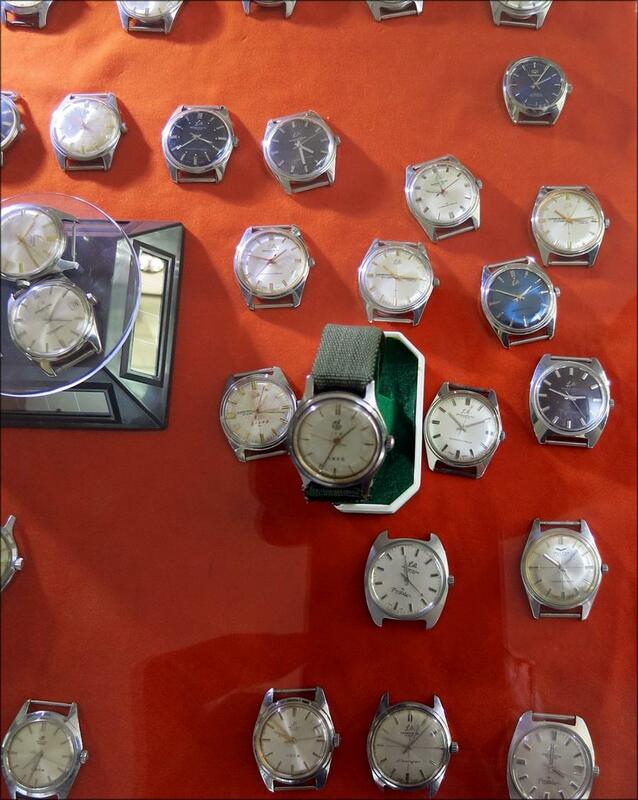 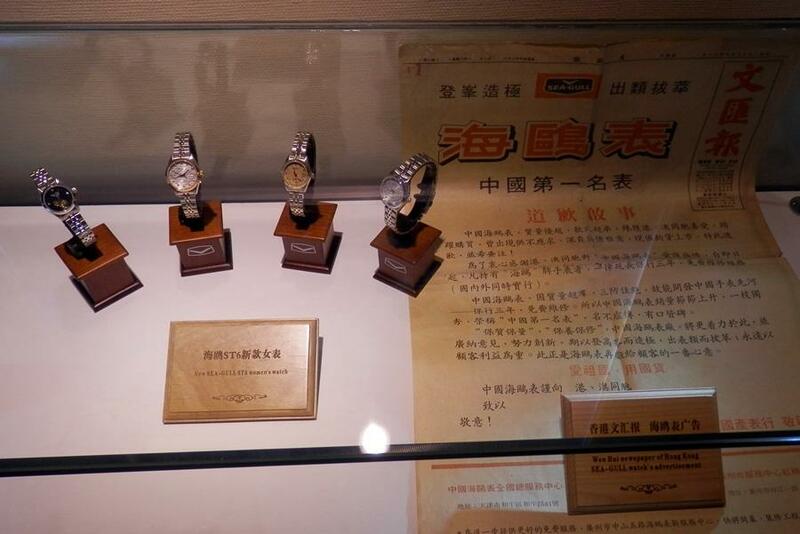 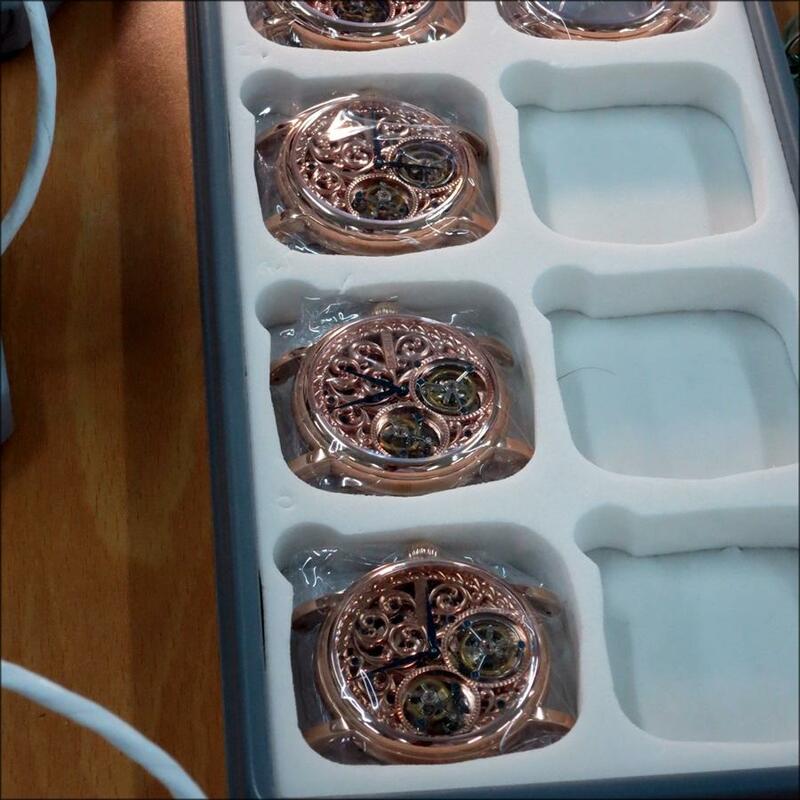 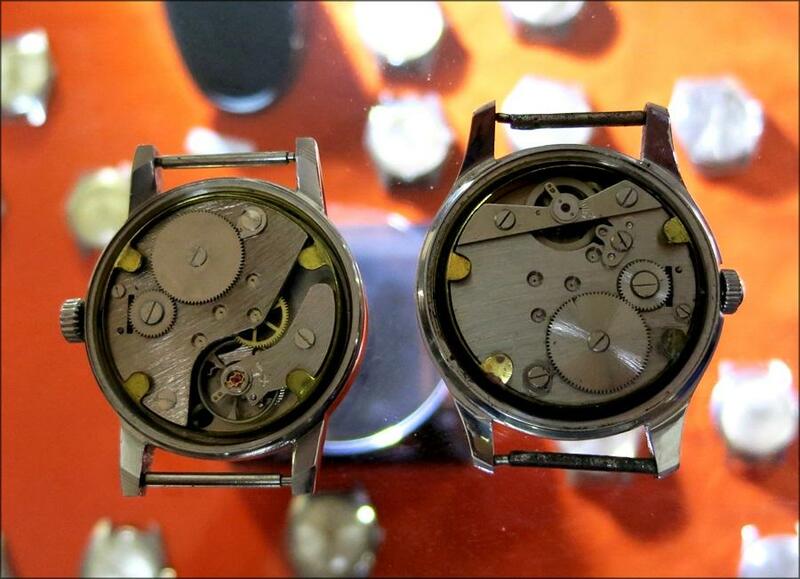 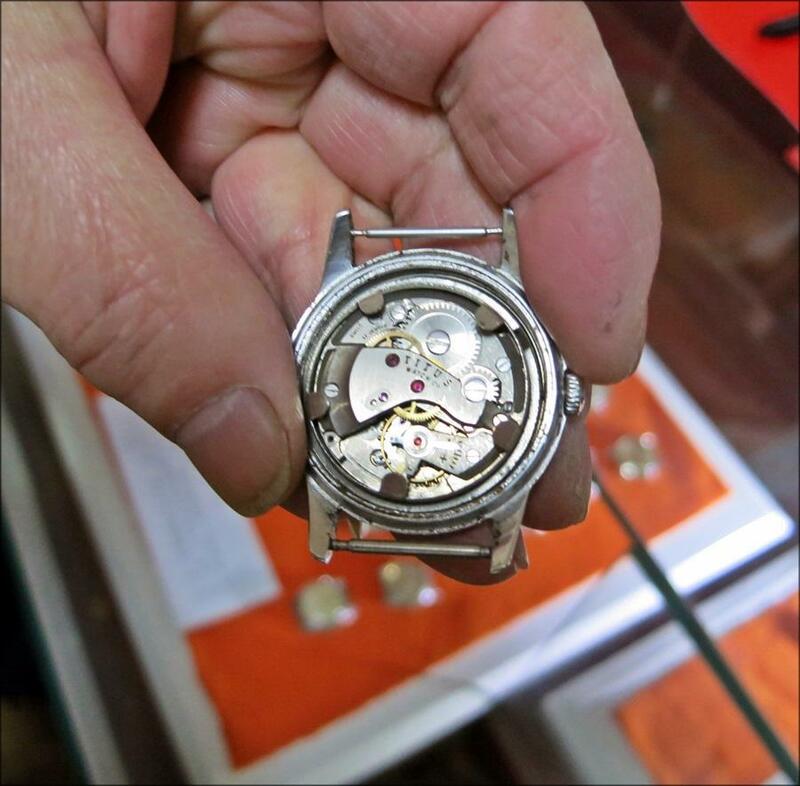 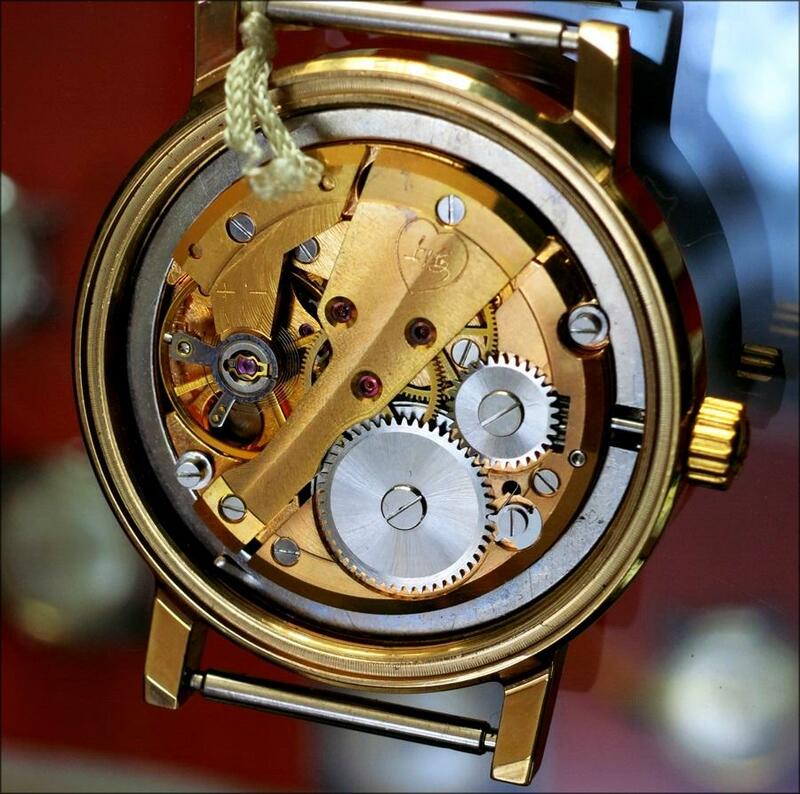 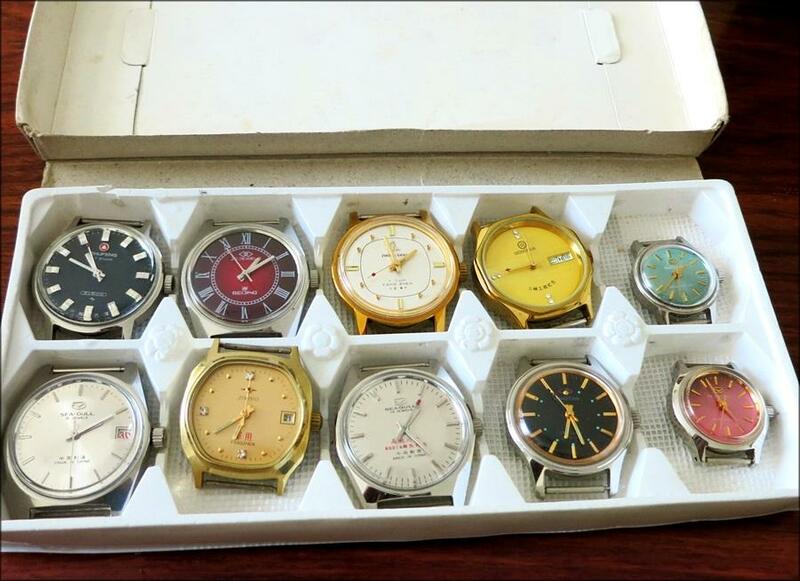 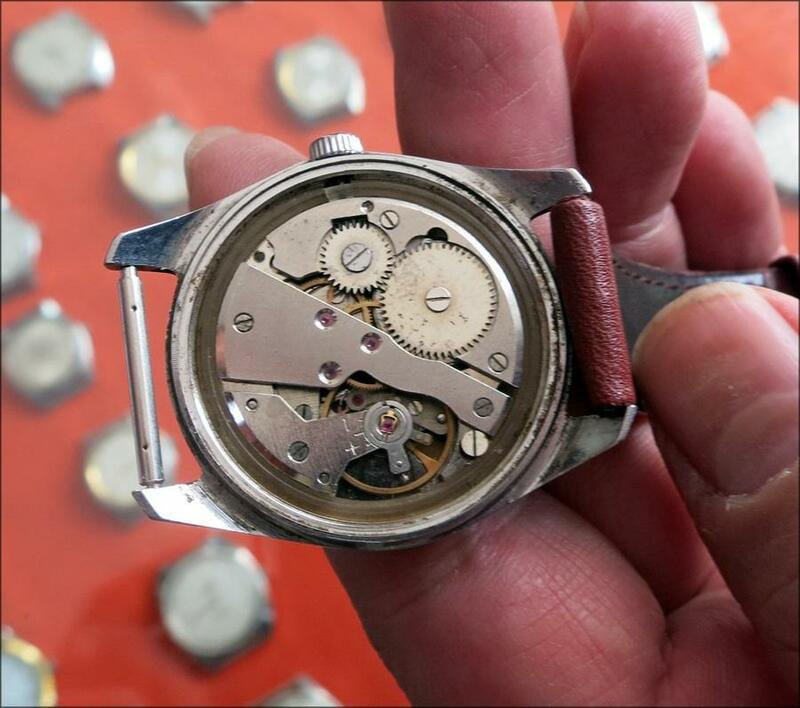 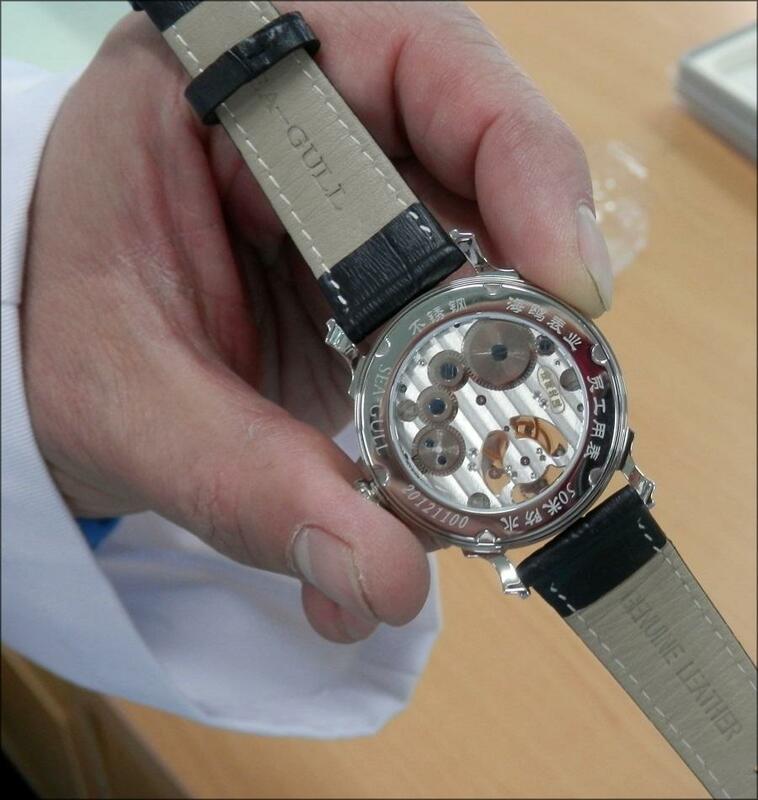 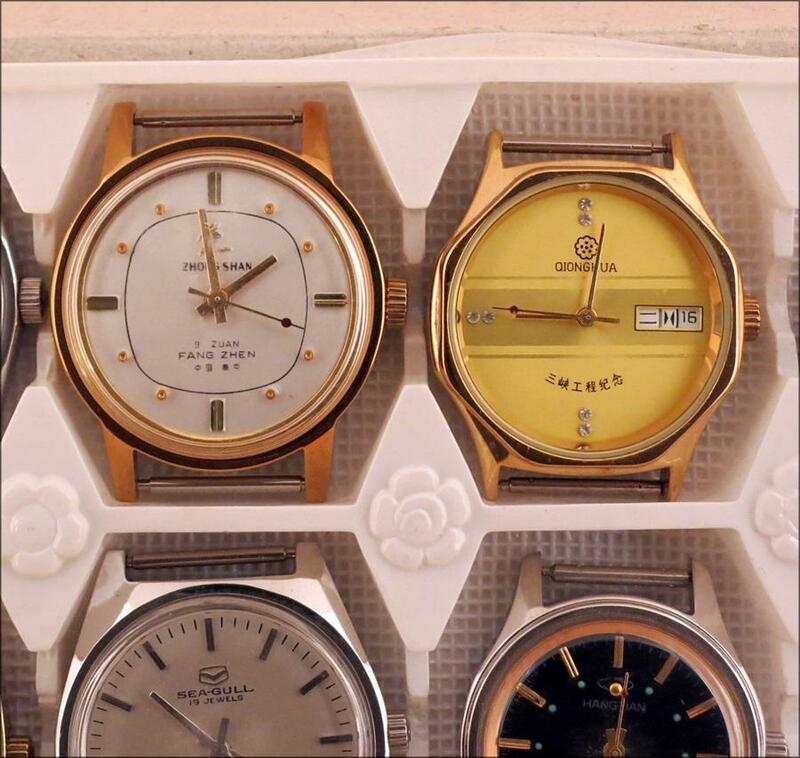 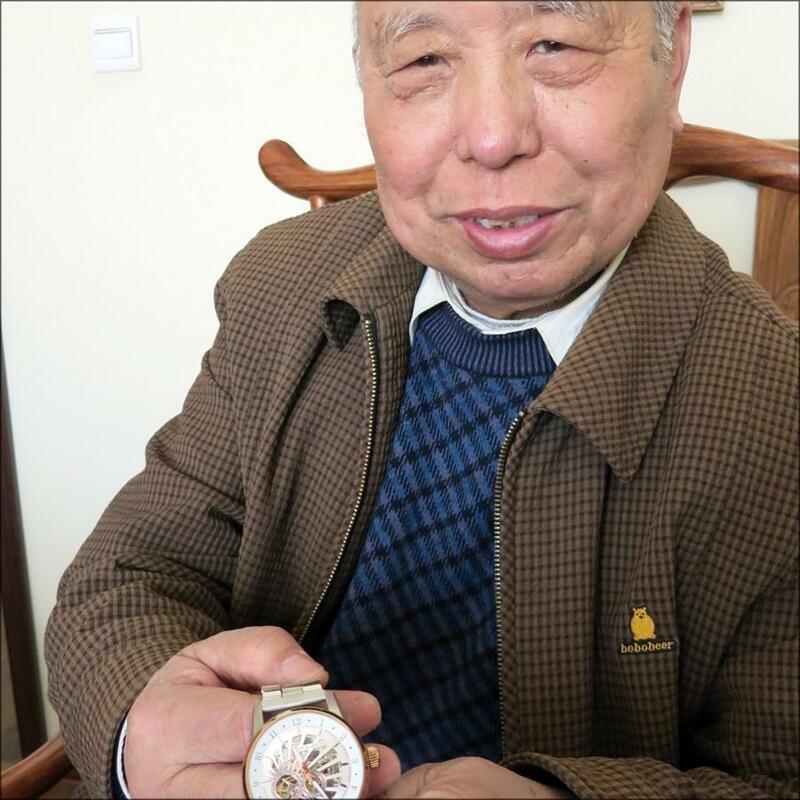 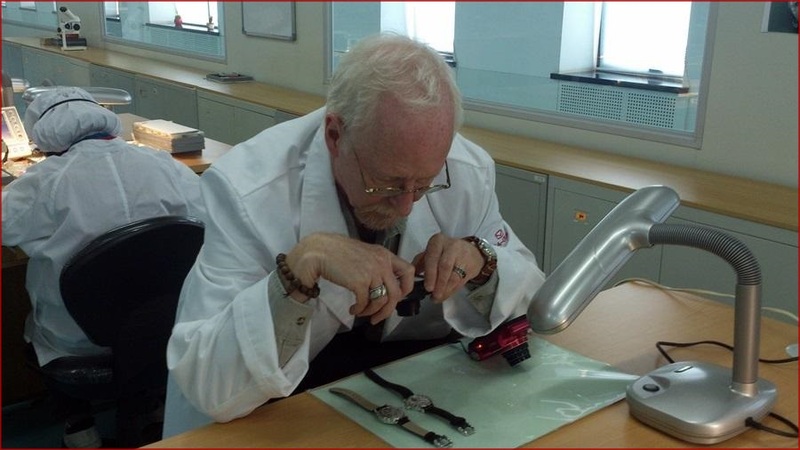 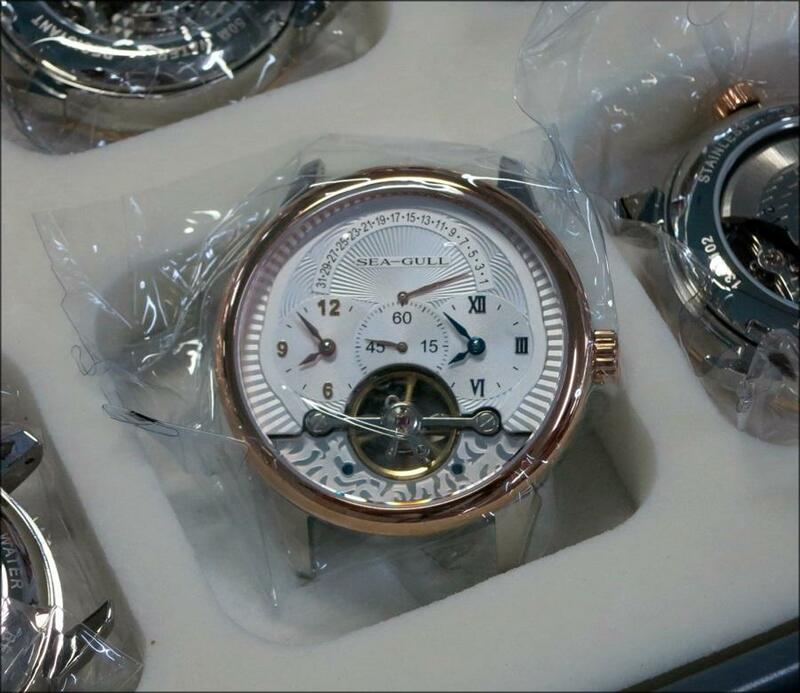 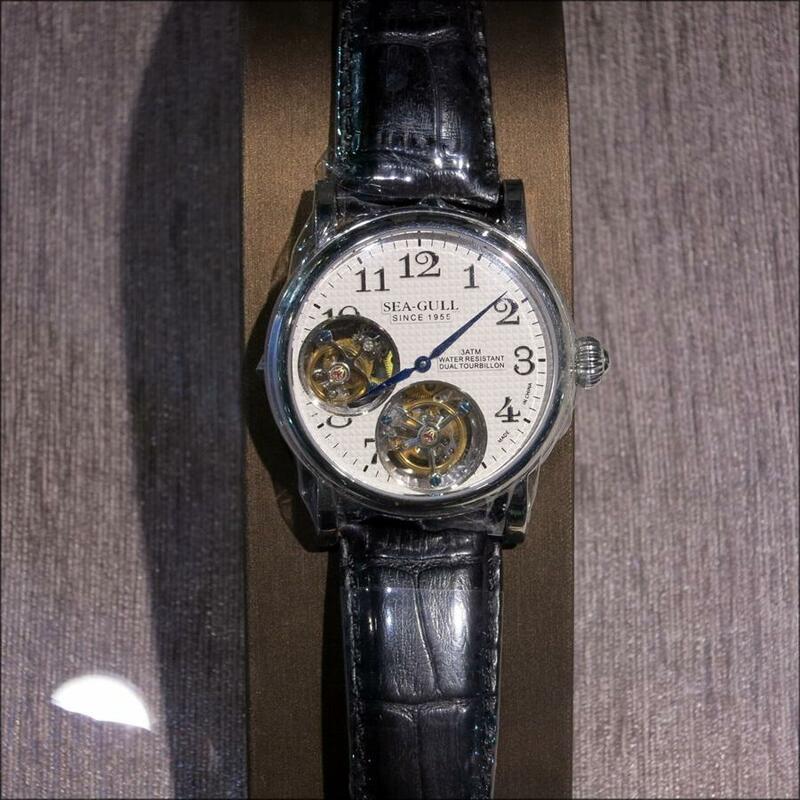 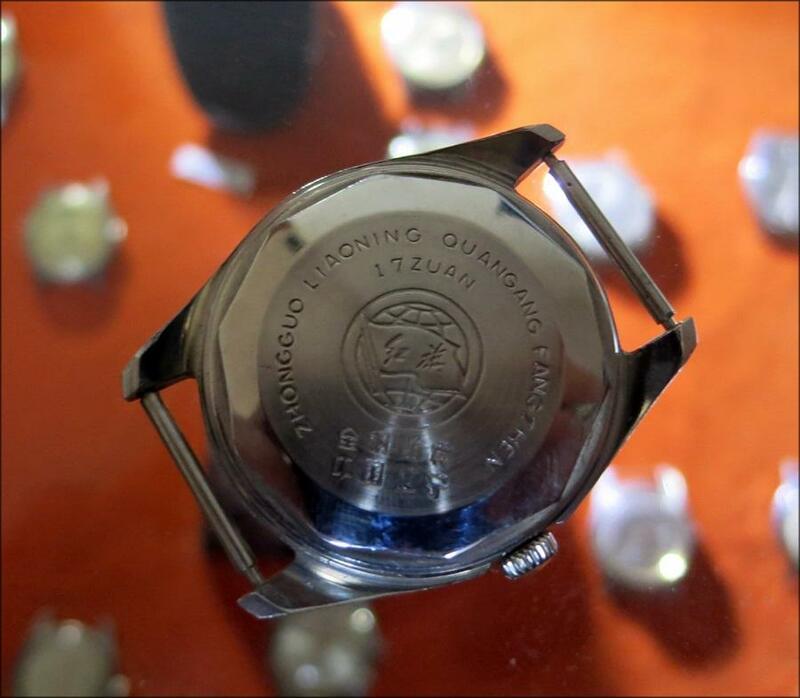 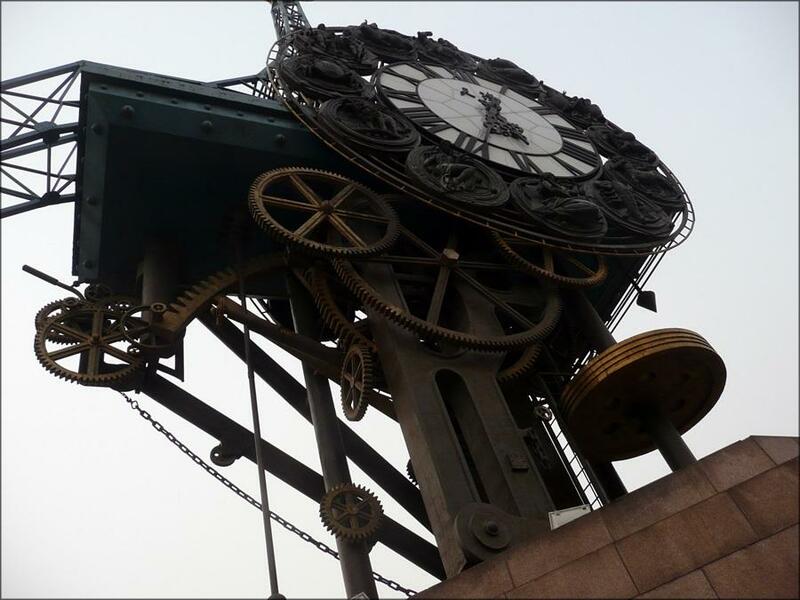 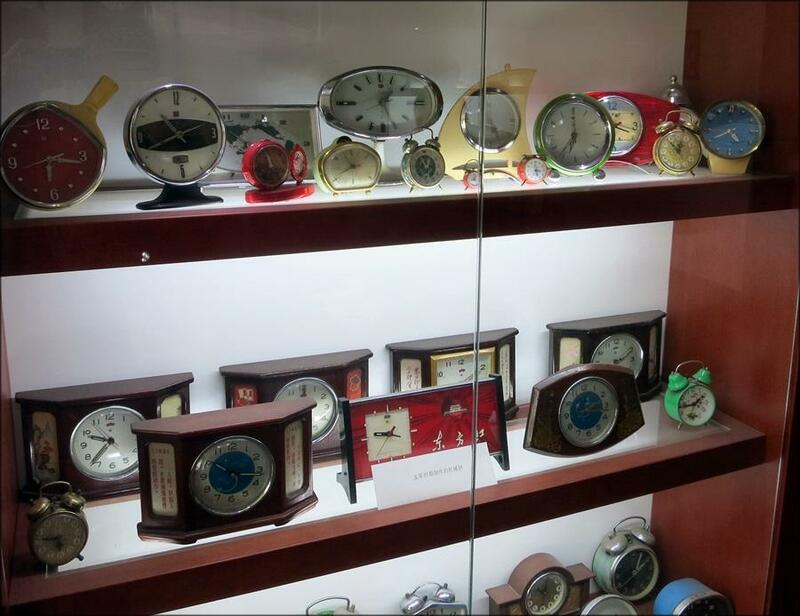 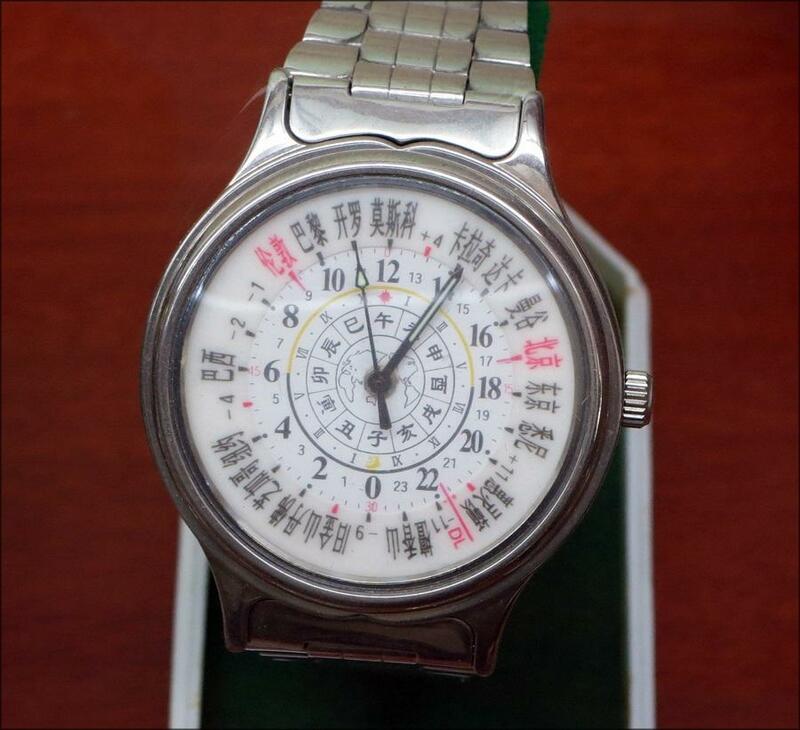 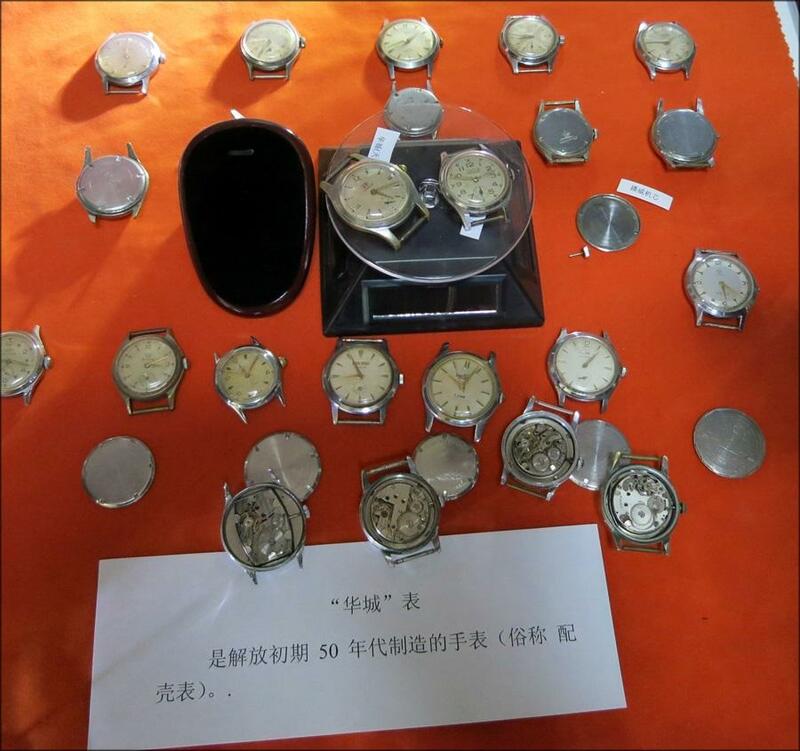 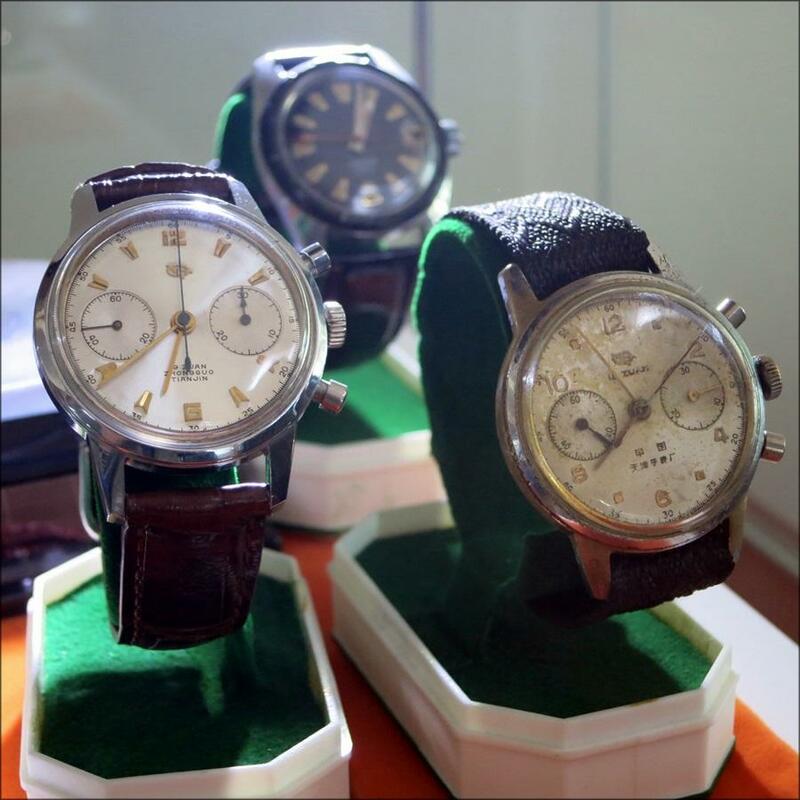 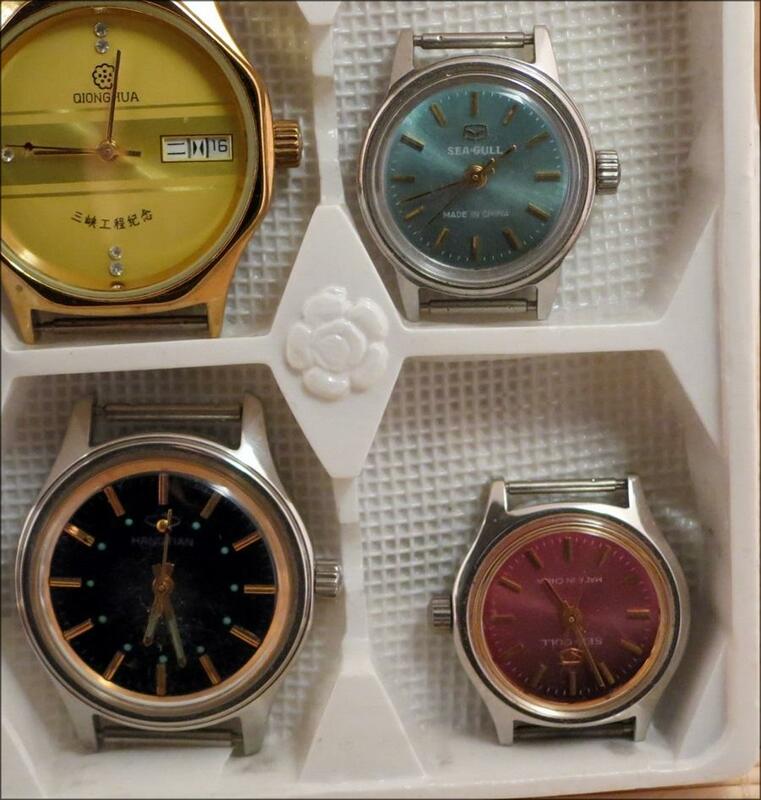 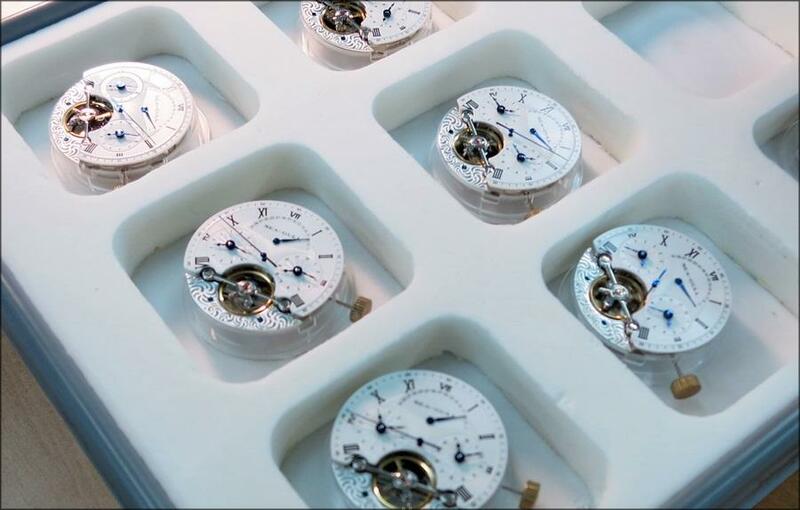 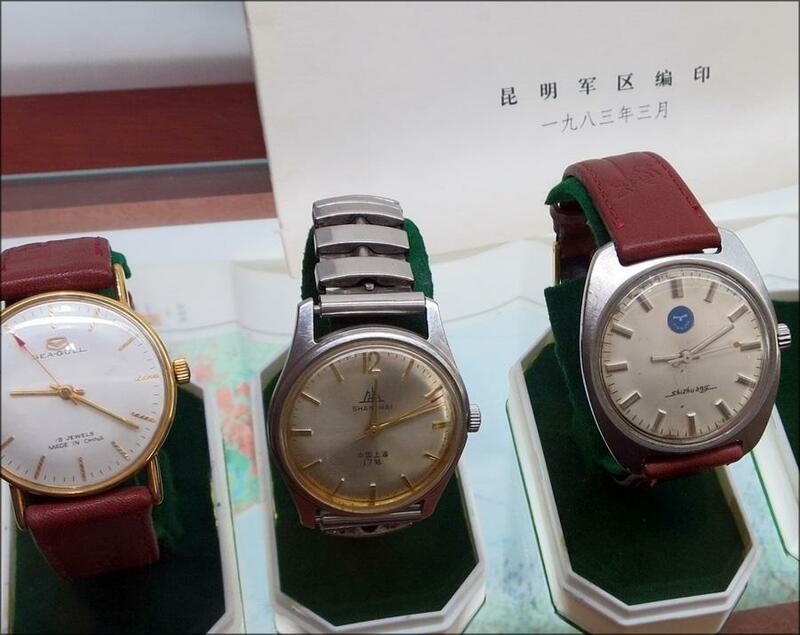 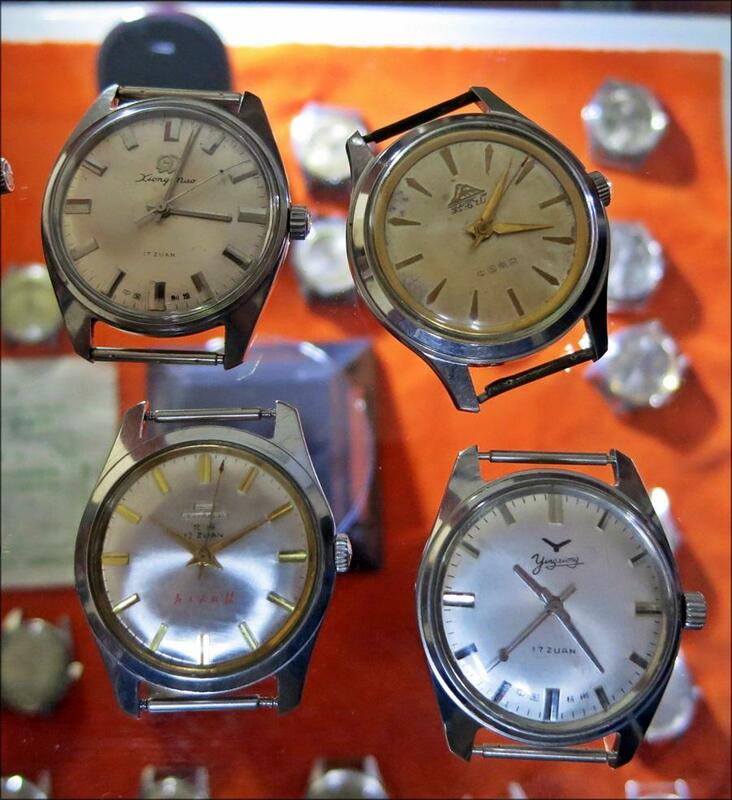 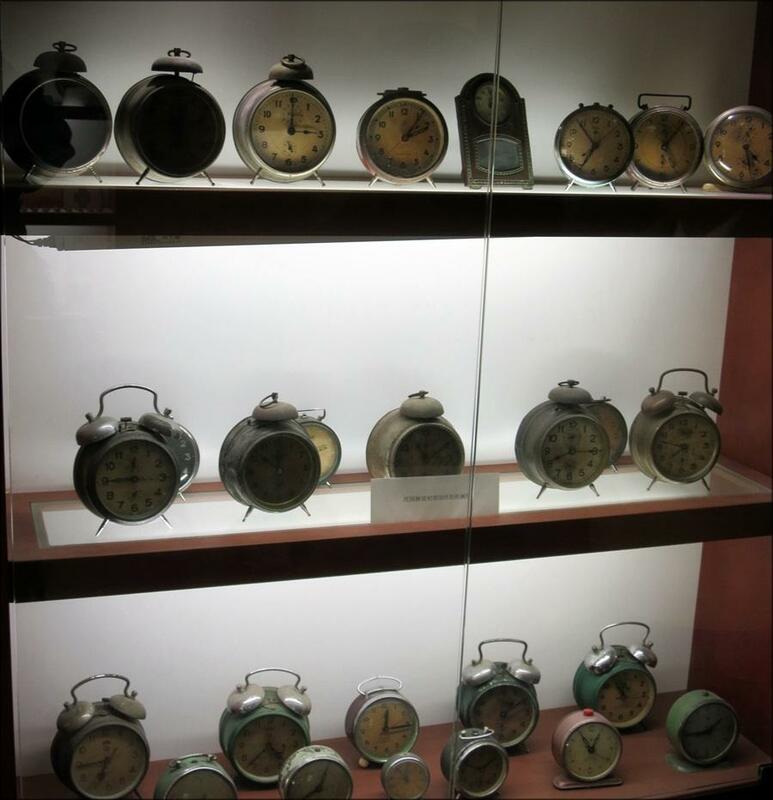 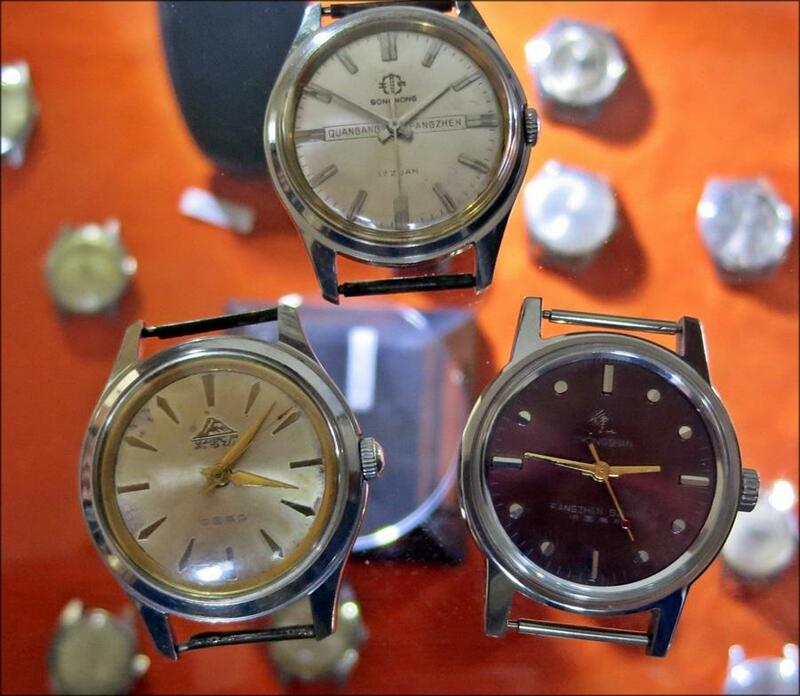 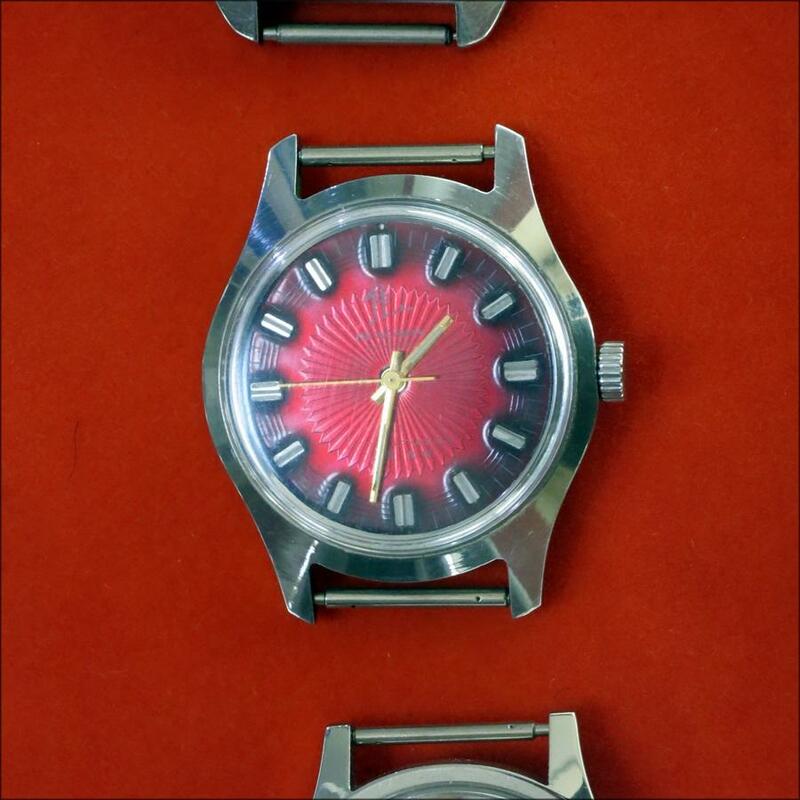 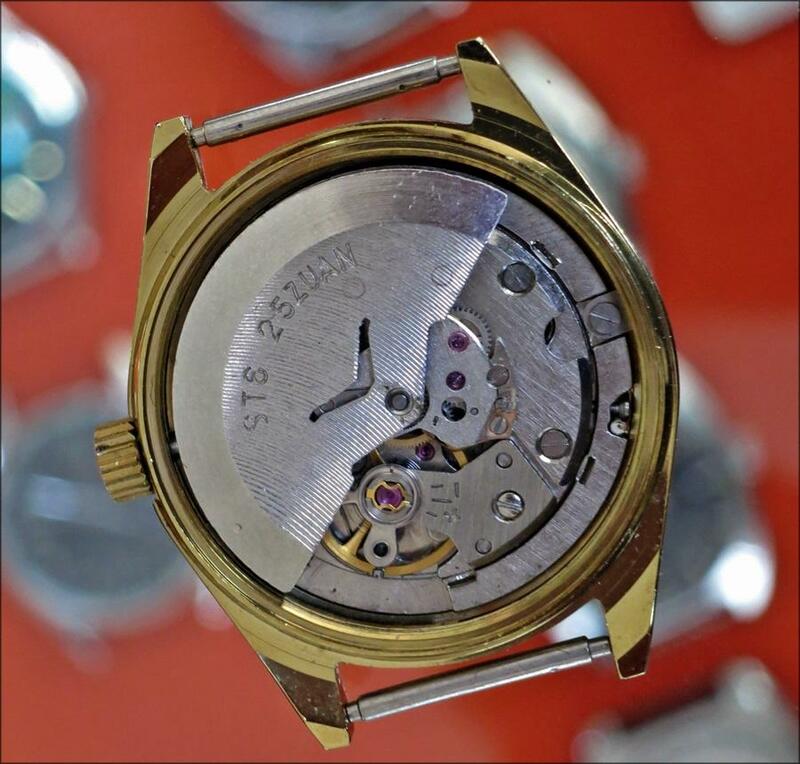 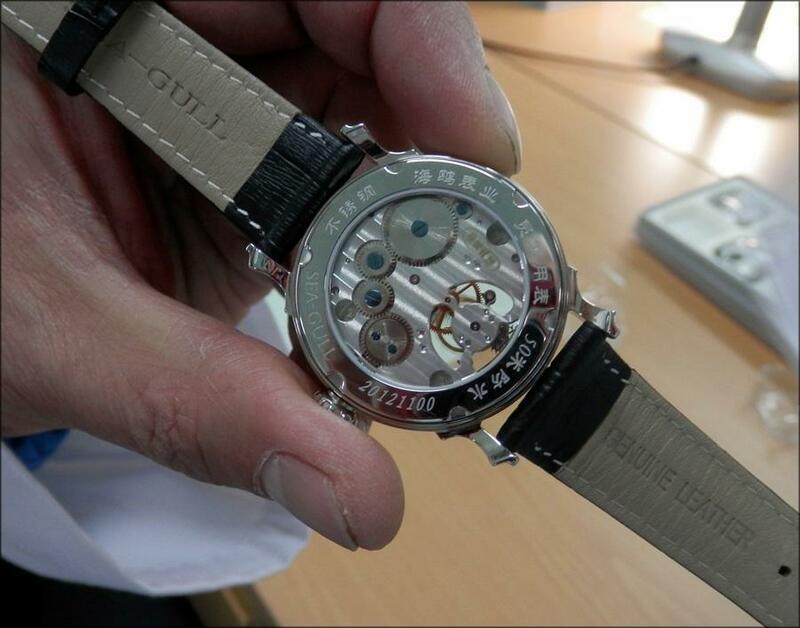 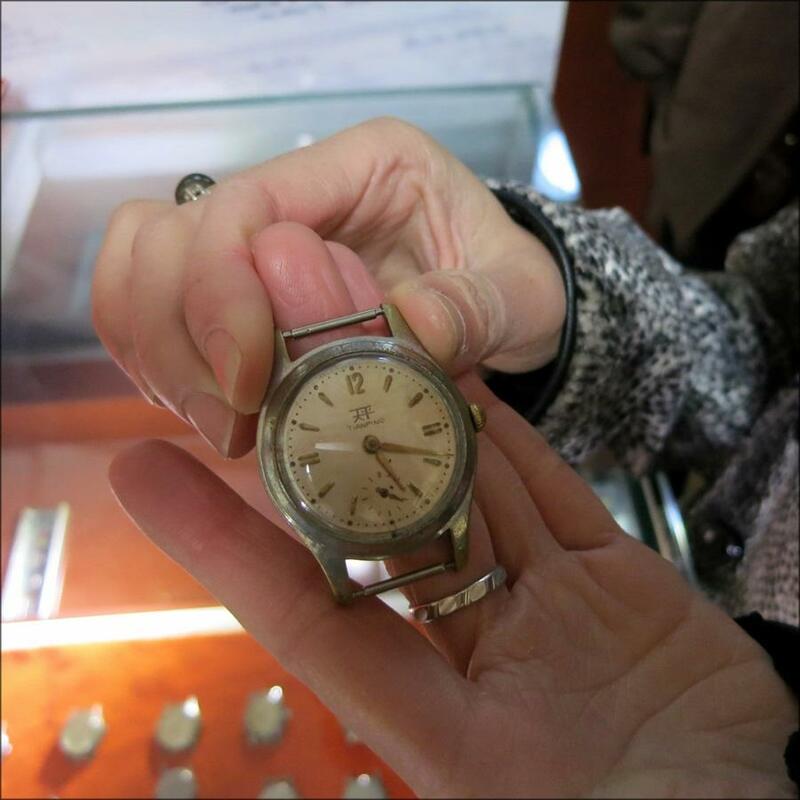 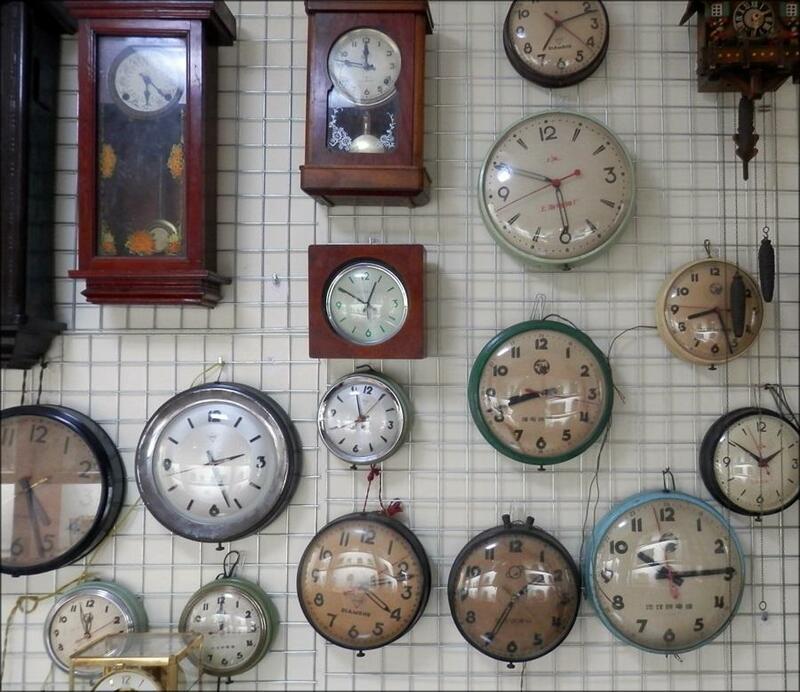 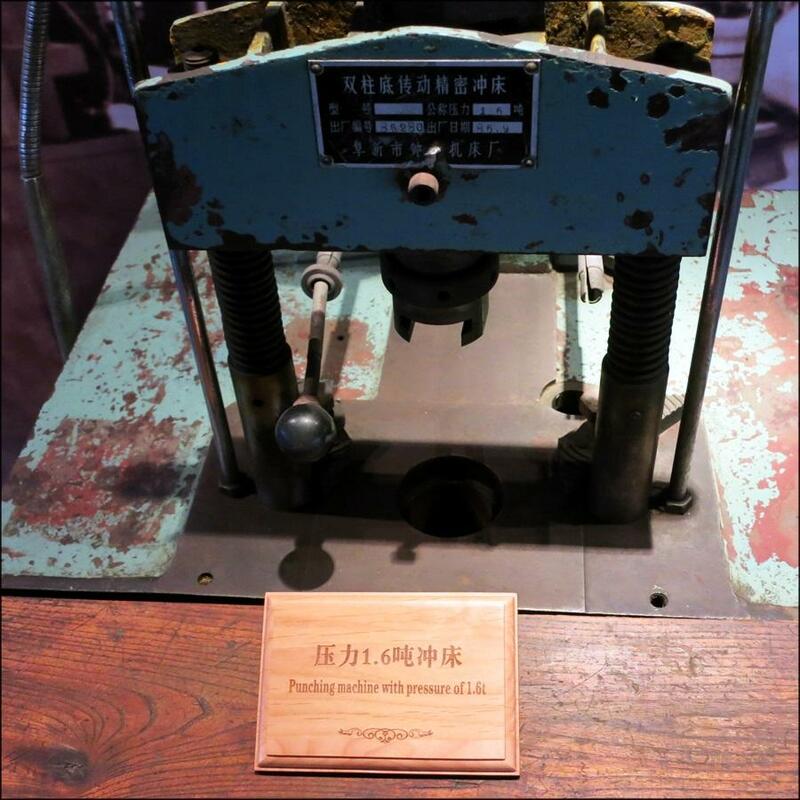 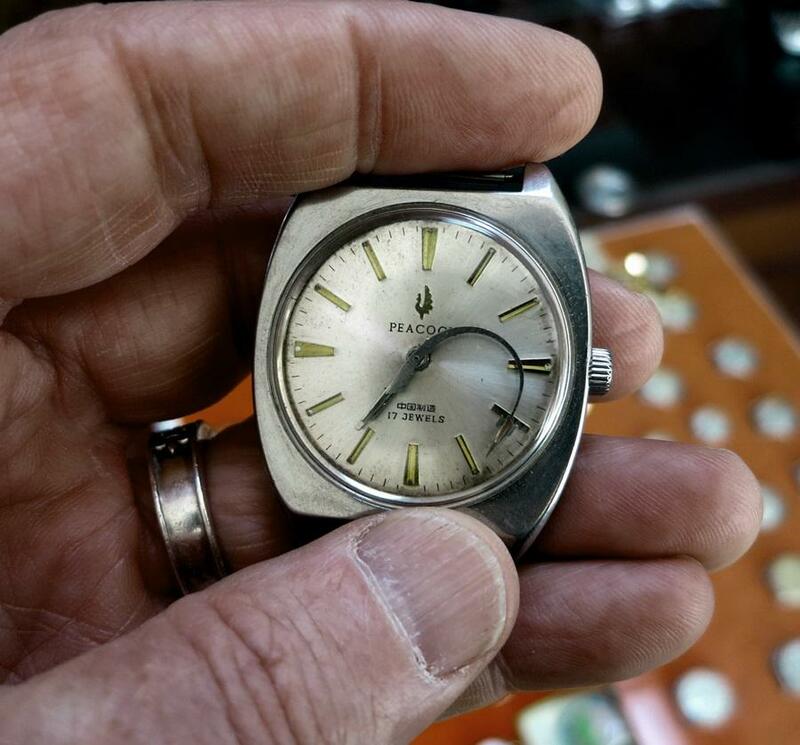 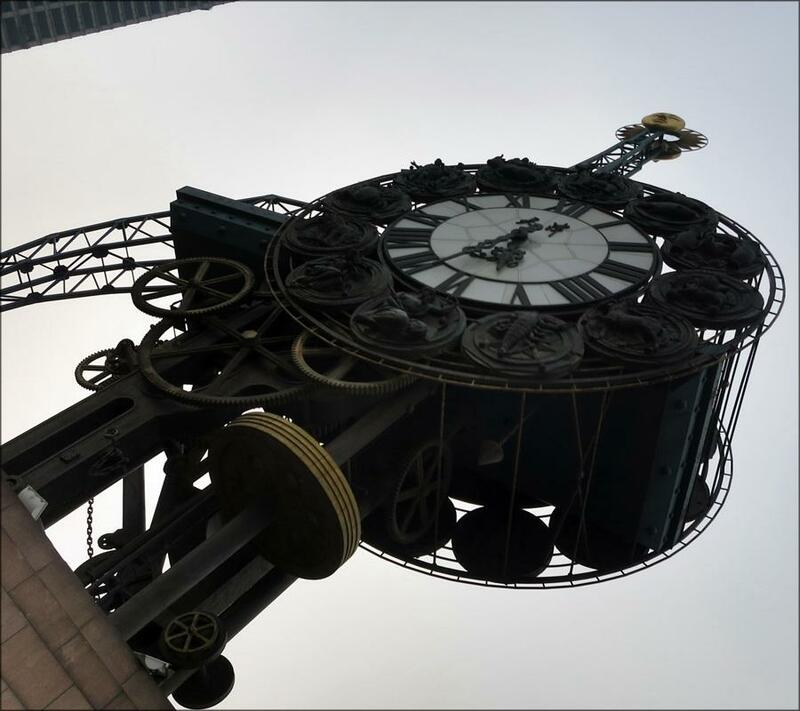 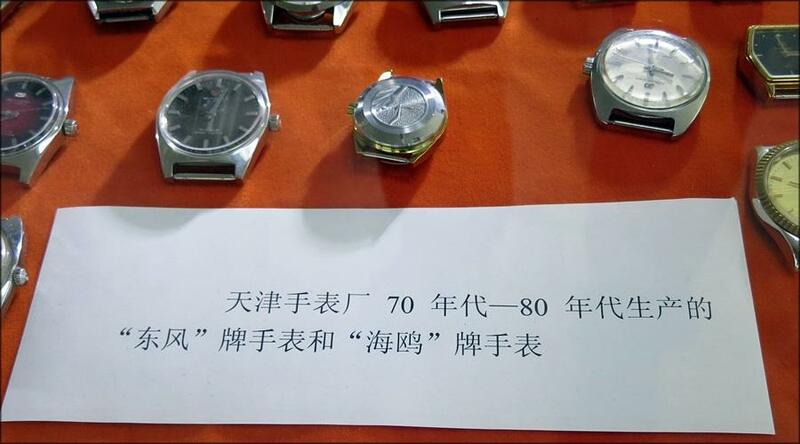 ...a trip to meet Mr. Jiang who is the President of the Tianjin Watch and Clock Collector's Association, and who is also the owner of the private Tianjin Watch and Clock Museum. 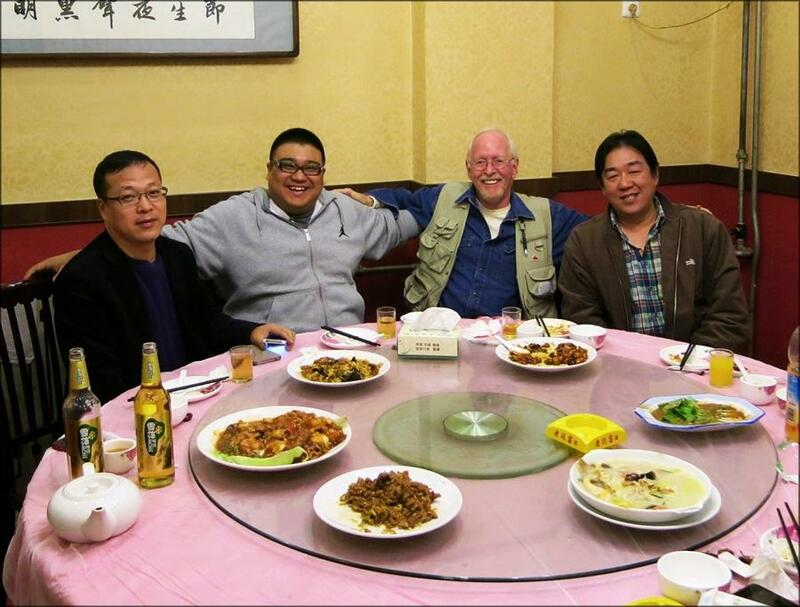 Mr. Jiang (blue shirt. 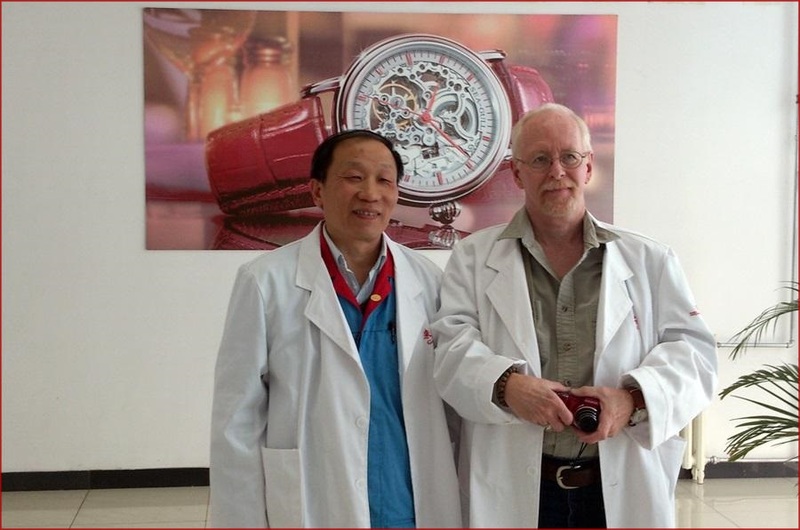 dark jacket) had very kindly arranged that we be joined during my visit by two Tianjin watch-making pioneers, Mr. Na (darker jacket) , a senior engineer at Tianjin Sea-Gull in the 1950s, and Mr. Su (lighter jacket/leather cap), a general engineer at the Tianjin Watch Factory in the 1960s. 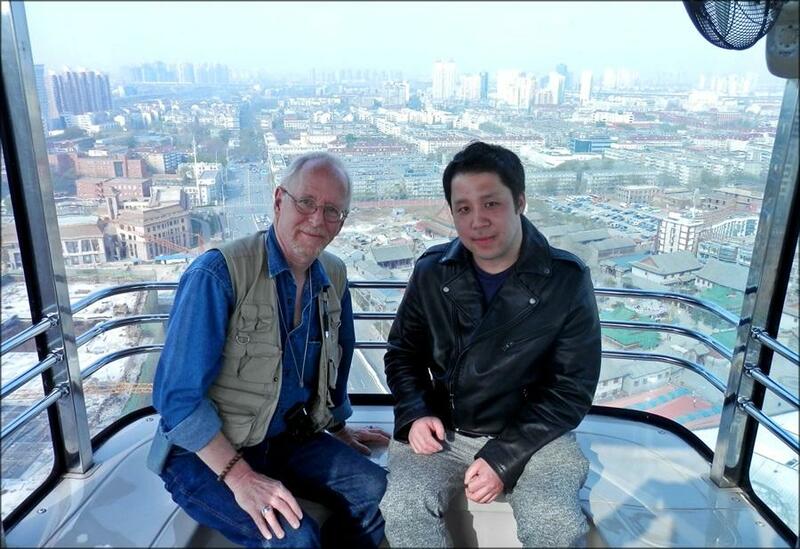 A very pleasant -- and totally unexpected -- additional surprise was the presence of a long-time Chinese forum friend "marockong" AKA "Marco" AKA KooNing, the Editor of China's "Portrait" photography magazine. 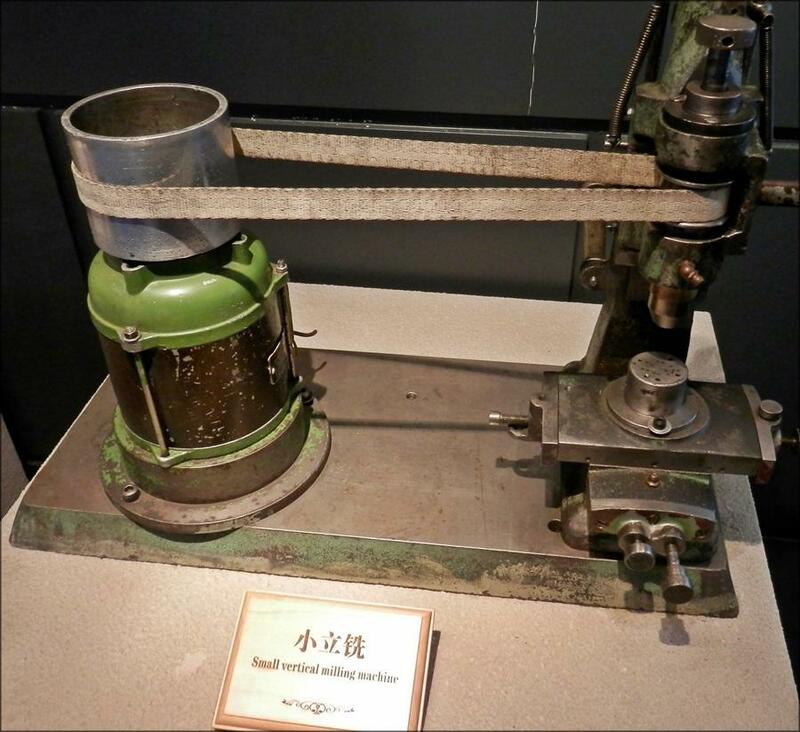 Marockong and I have been "instant buddies" since we first encountered each other, and it was that much happier to be together in person. 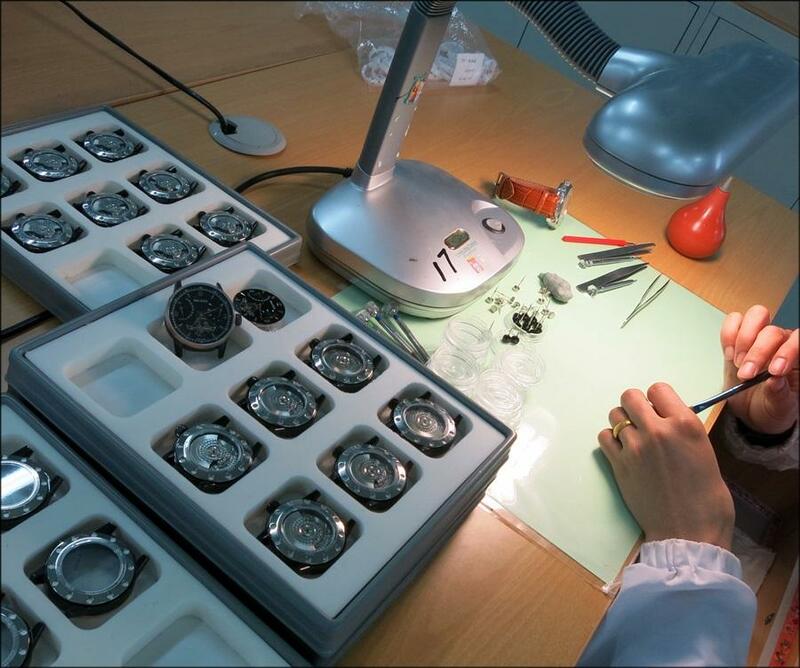 Plus: Marco speaks excellent English and was a great help to my understanding of what I was seeing. 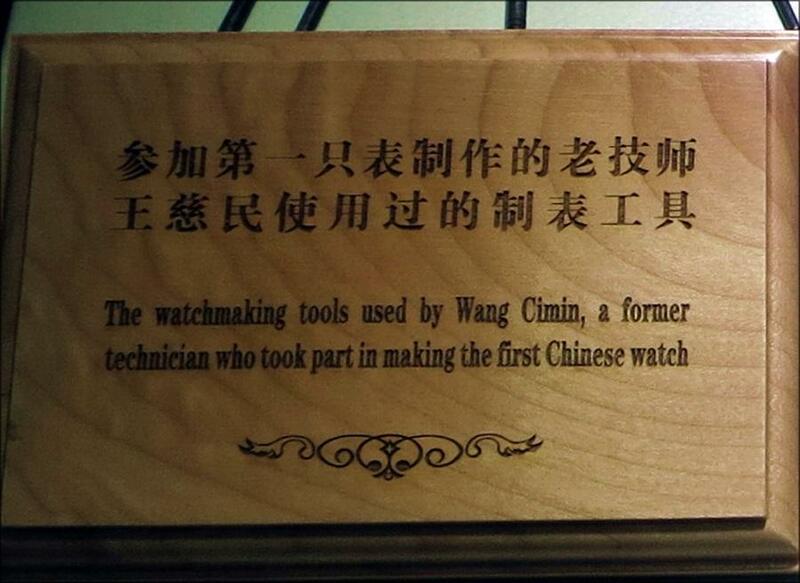 with names...I'll amend the post). 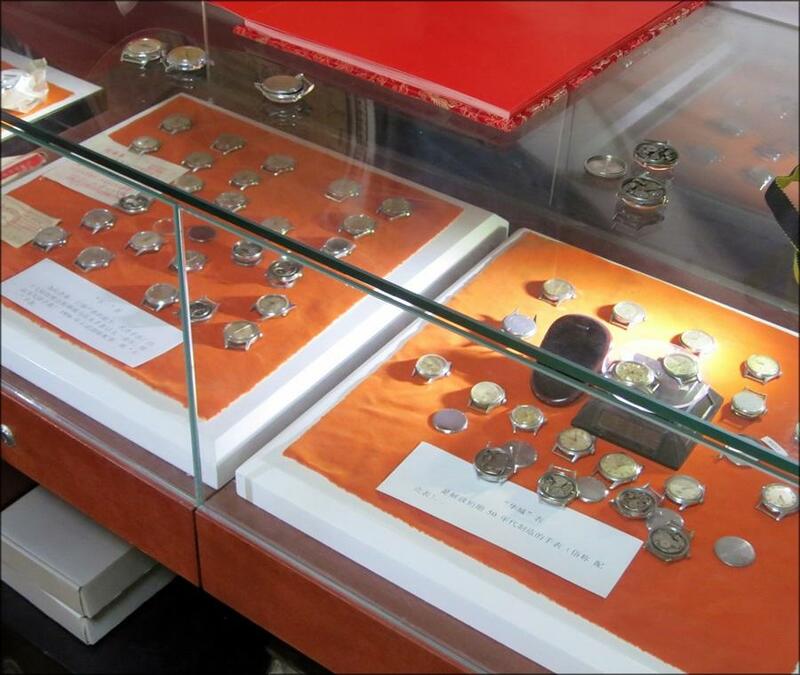 The youngest woman is a beginning collector of VCMs. 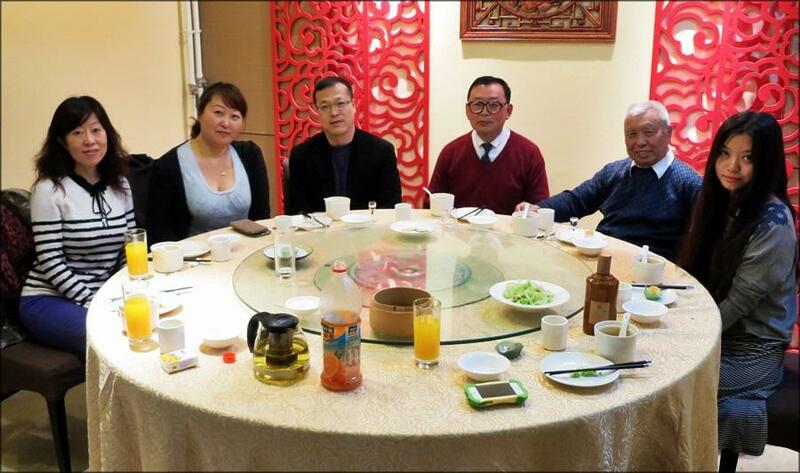 The others are: a good friend of Mr. Jiang who -- along with her brother -- very kindly acted as a translator for me, and (the woman in the black sweater and blue top) Mr. Jiang's wife. 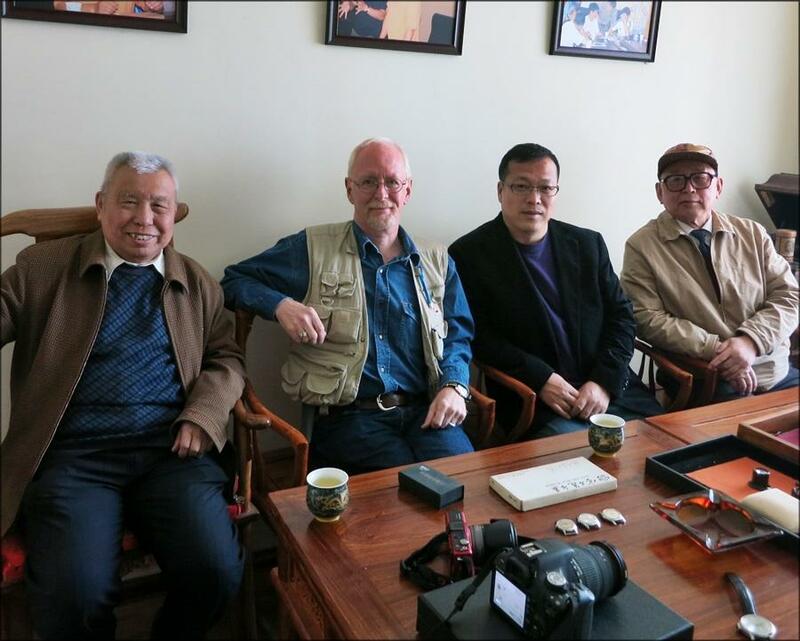 I can't say enough about the kindness I was shown by Mr. Jiang's family and by his many friends. 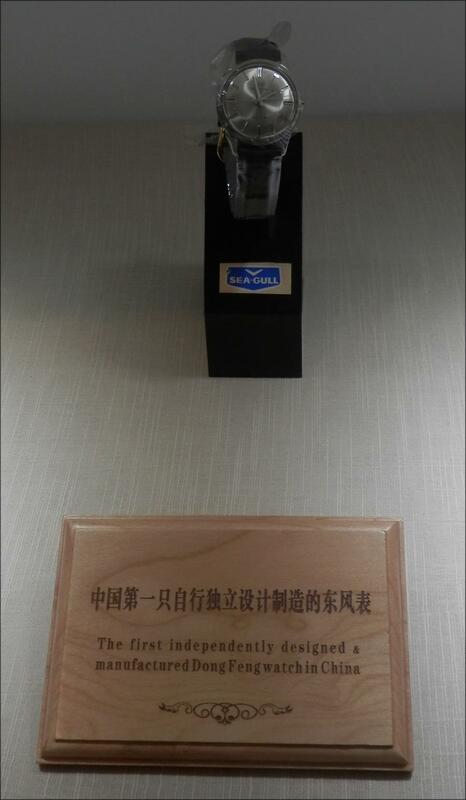 I mean, what could I say? 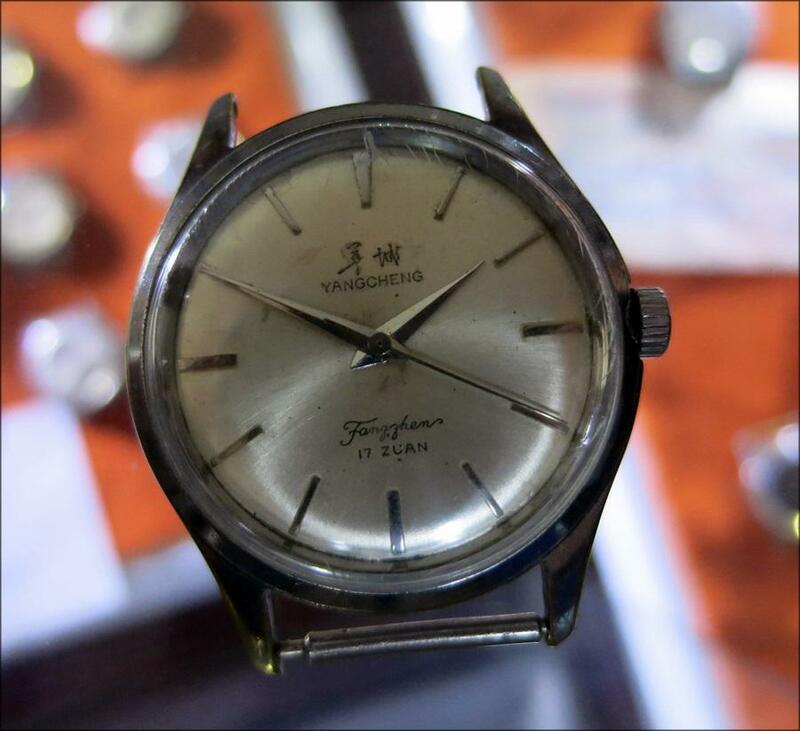 This is a dream trip for a VCM collector on many, many levels and I'm very aware that the people shown here went to appreciable effort, time and time again, to provide me with memories to last a lifetime. 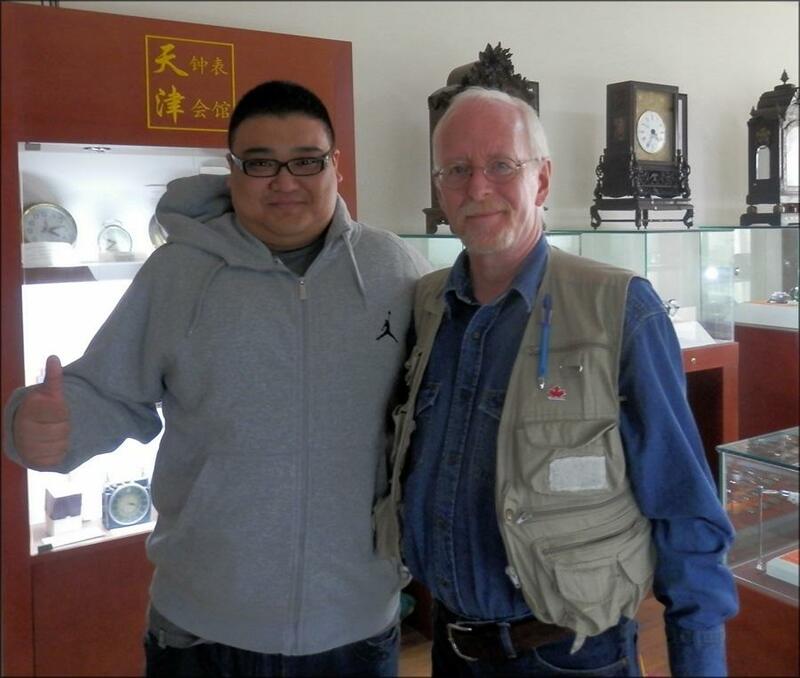 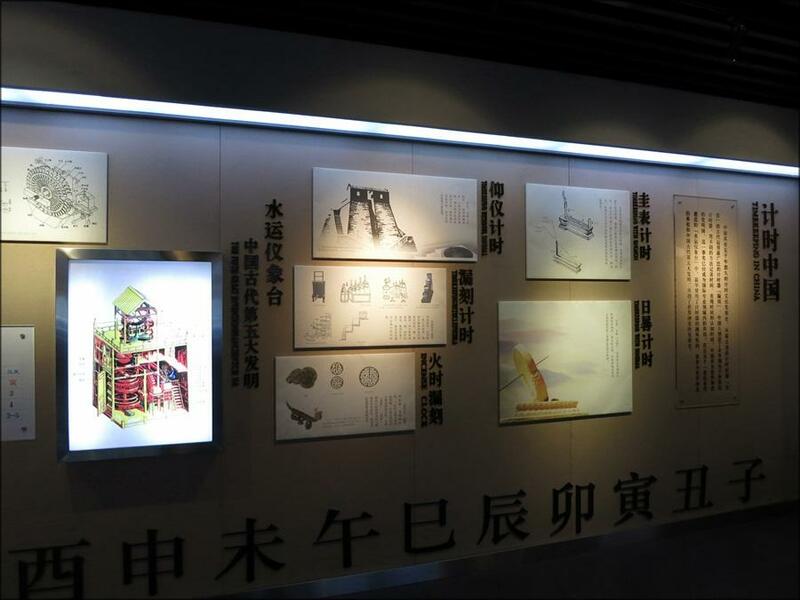 Among other things, Mr. Jiang informed me that I had the honour of being the first westerner to ever visit the museum. 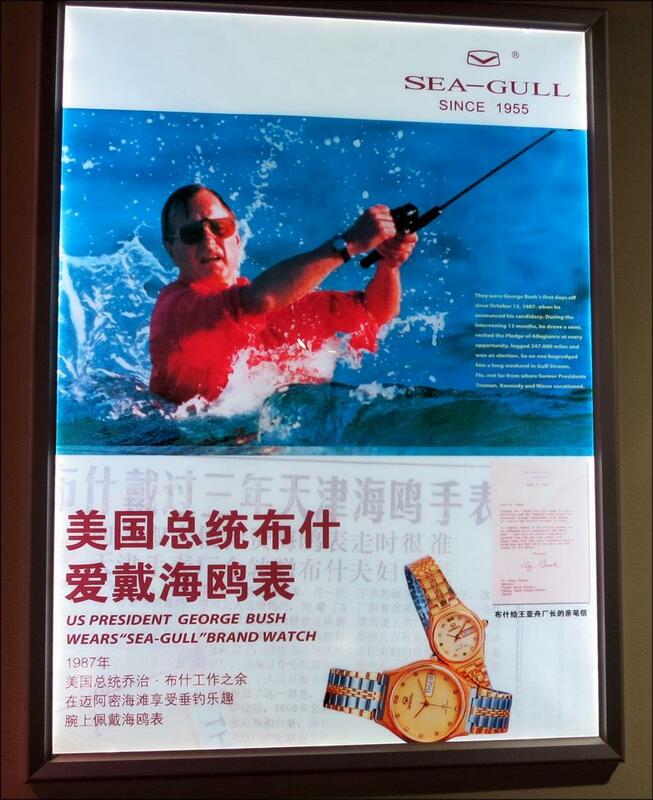 I'll let most of the photos speak for themselves. 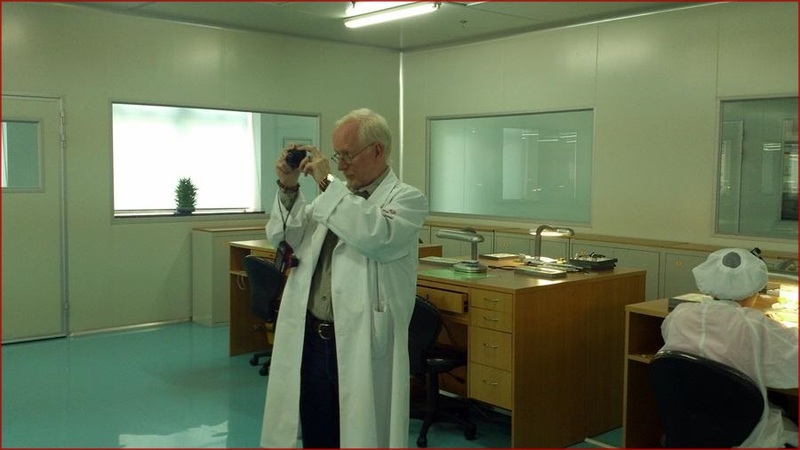 But...here's some fun for VCM sleuths: the photos run in rough chronological order and so -- occasionally -- there are a few long-time VCM mystery questions asked, implied and maybe answered in the photos. 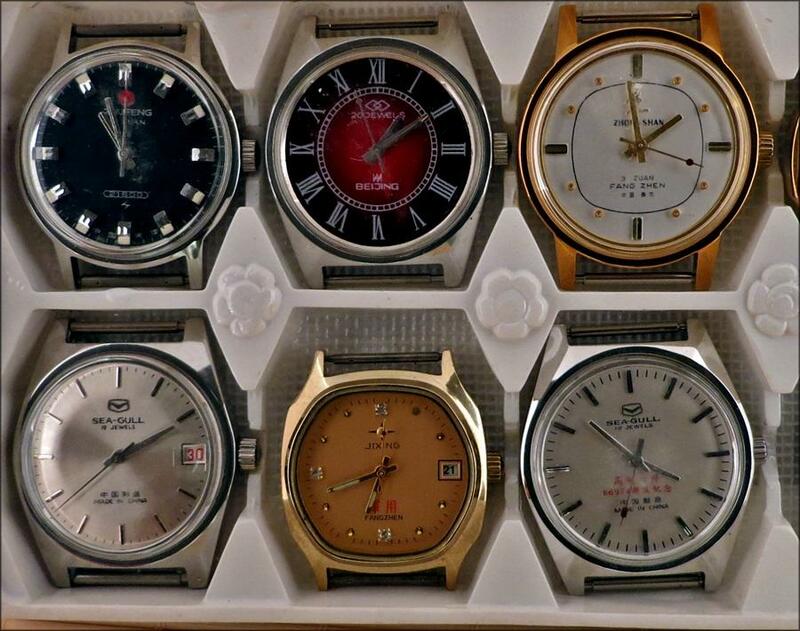 Let the discussions begin. 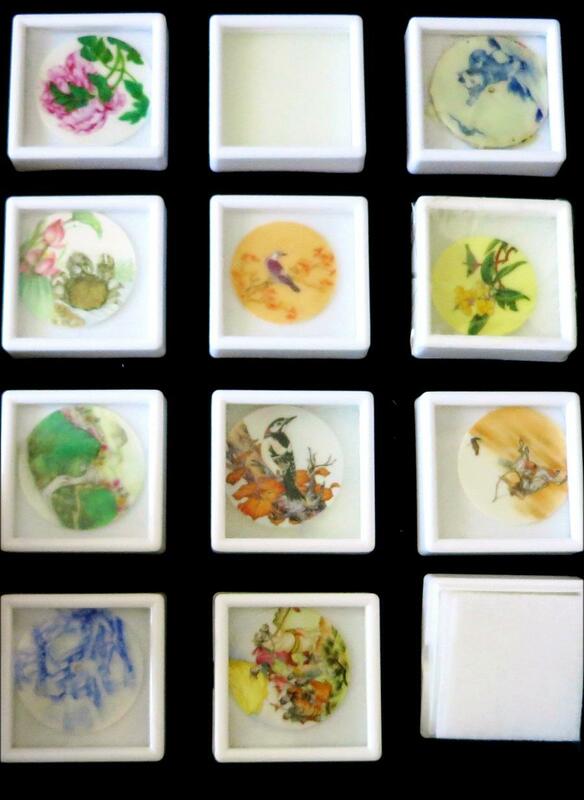 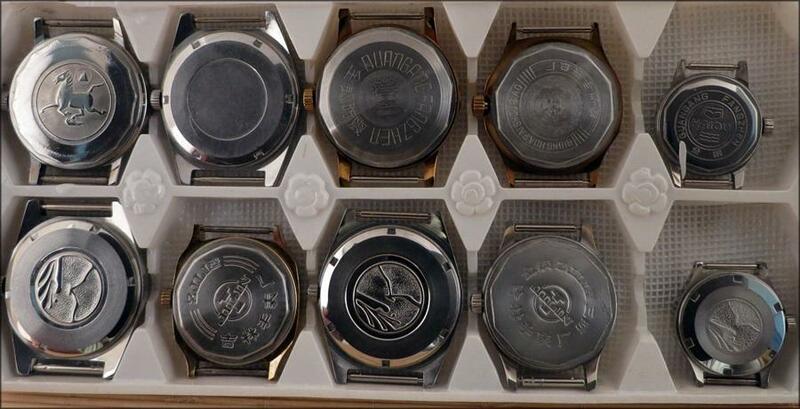 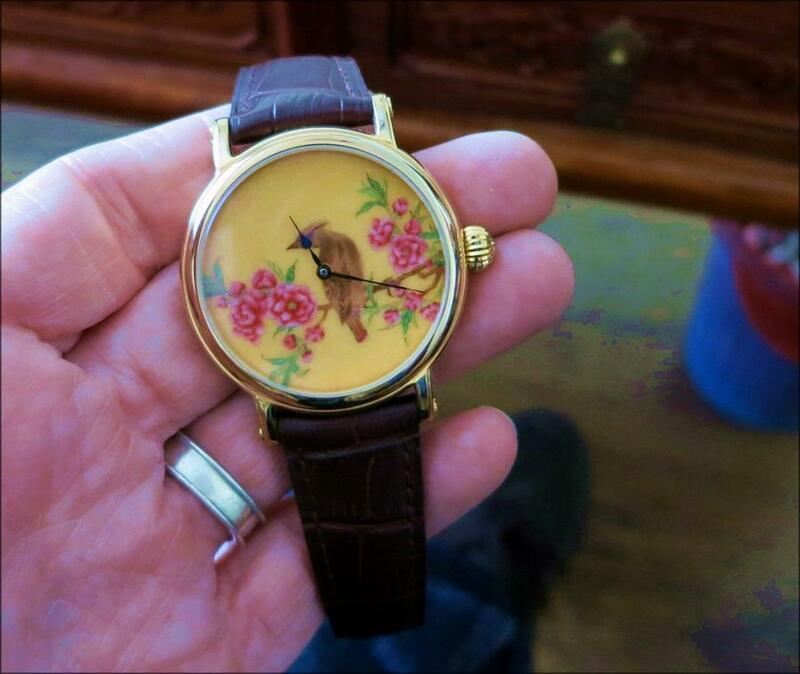 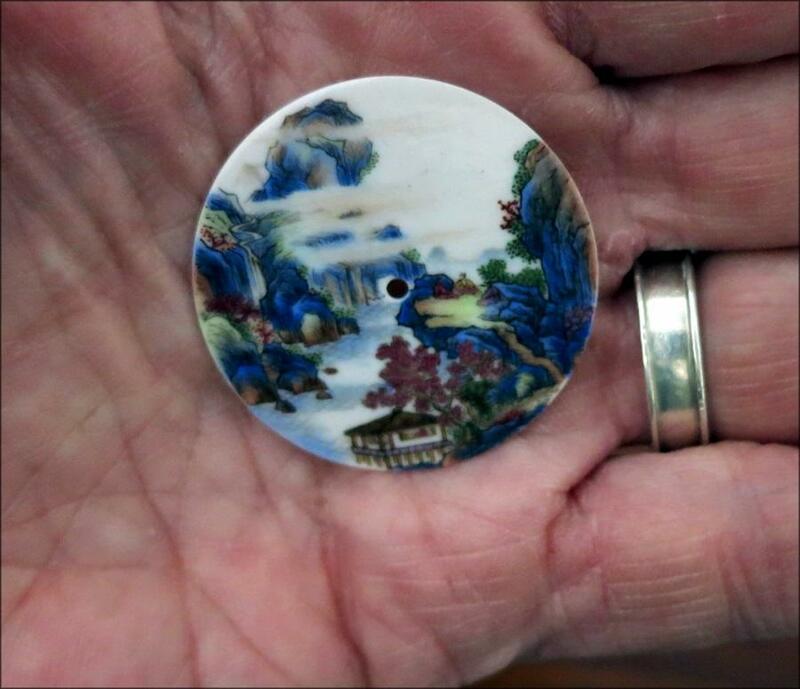 Note these hand-painted porcelain dials. 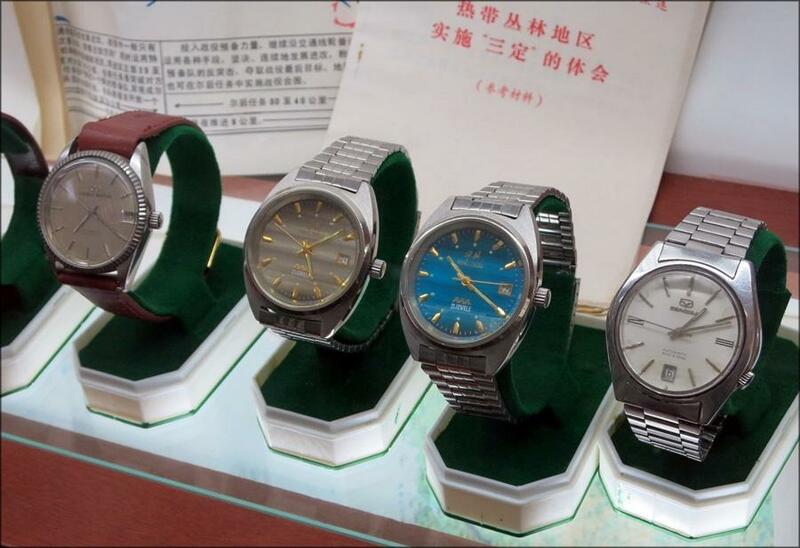 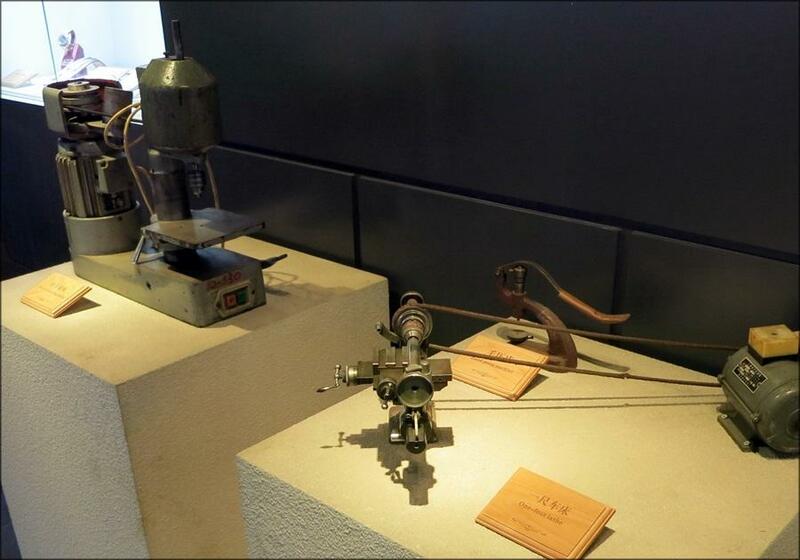 These are Mr. Jiang's creations and were headed to Basel along with Mr. Jiang the day following this meeting. 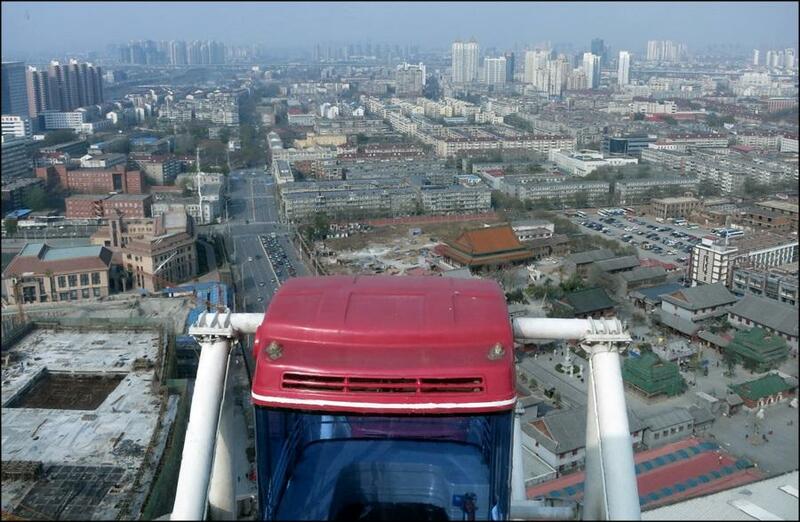 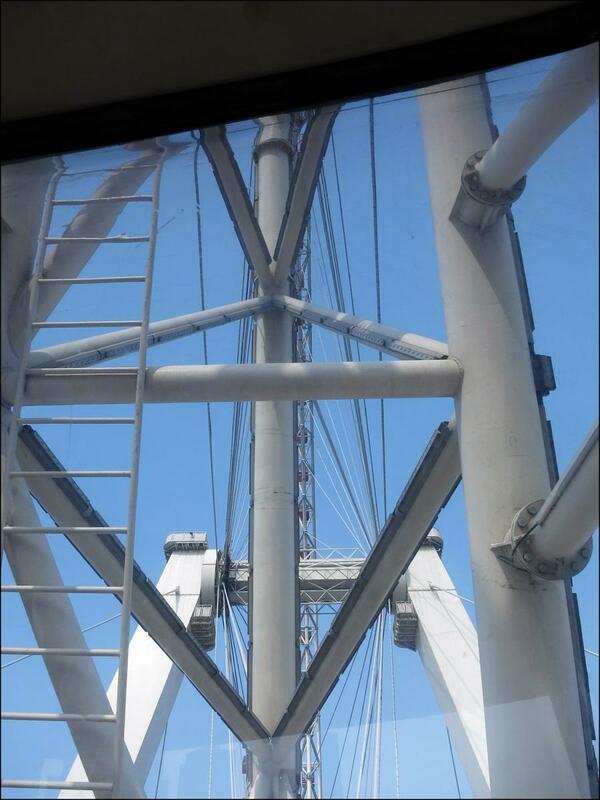 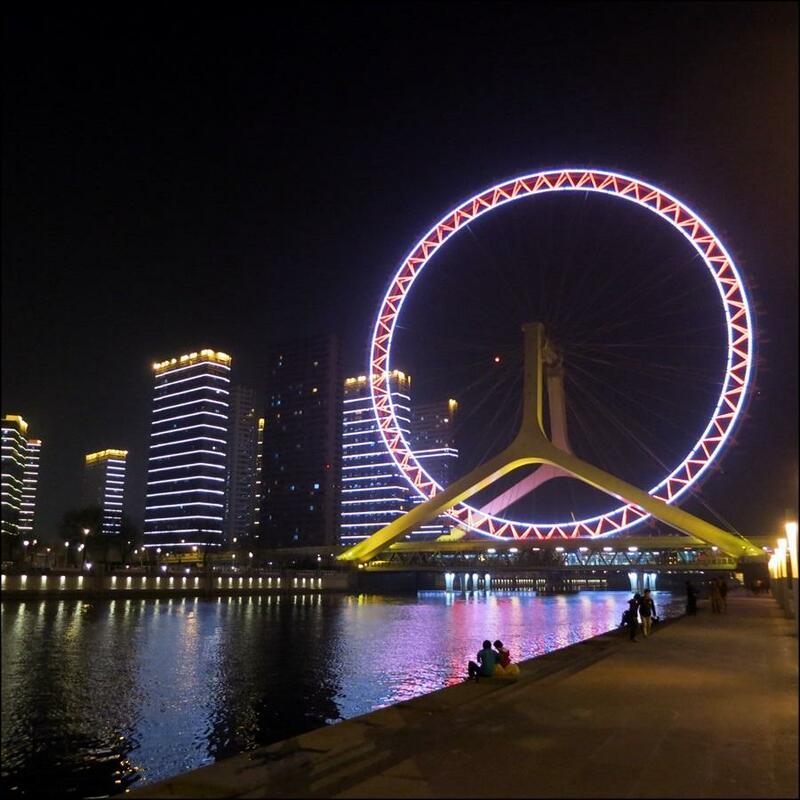 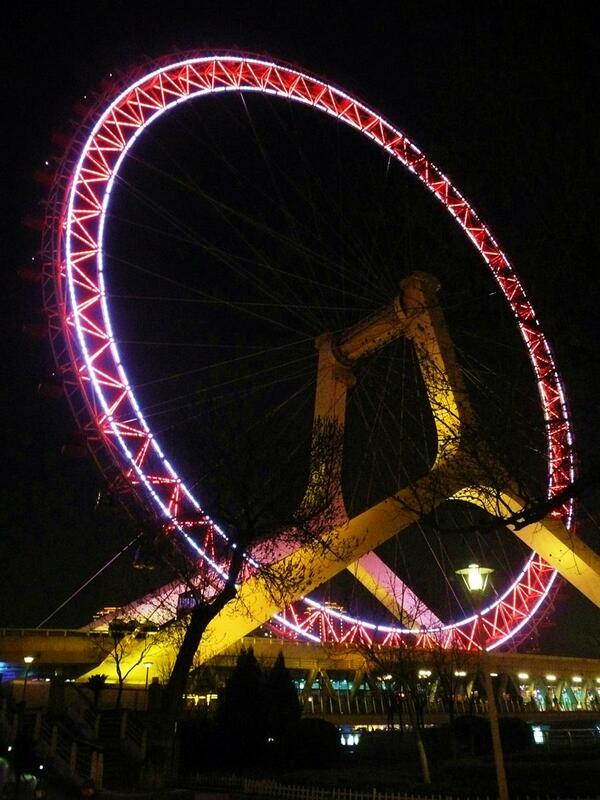 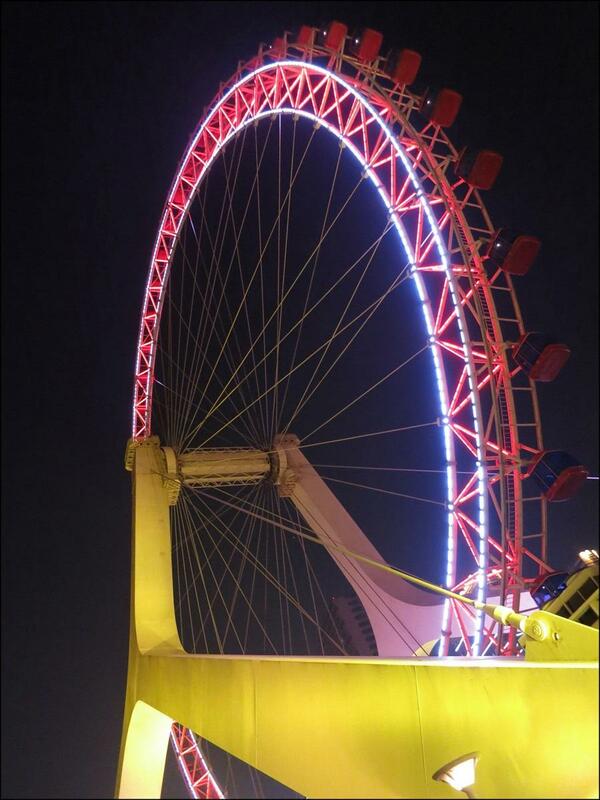 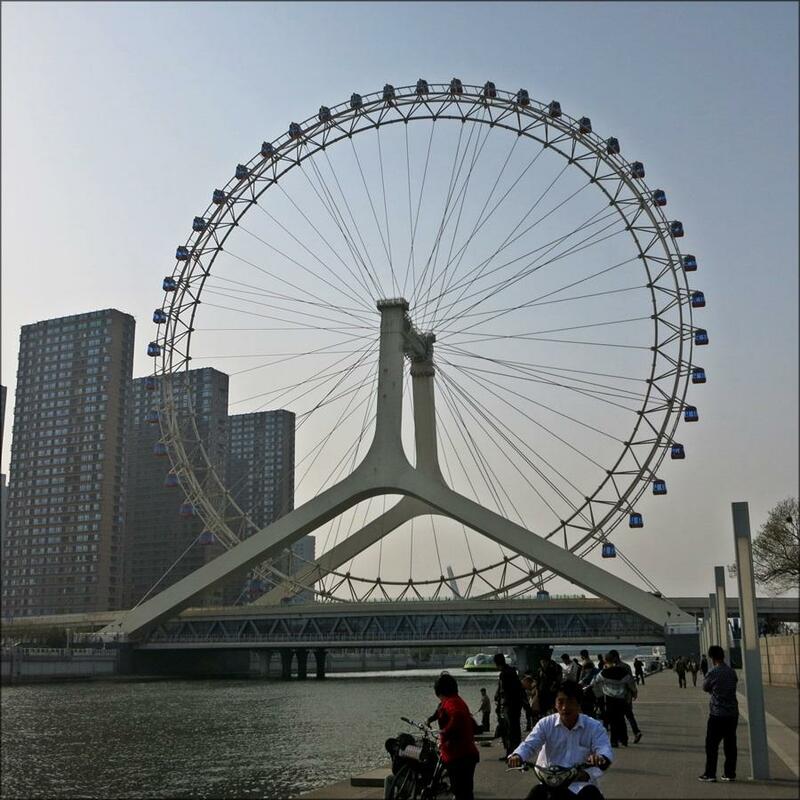 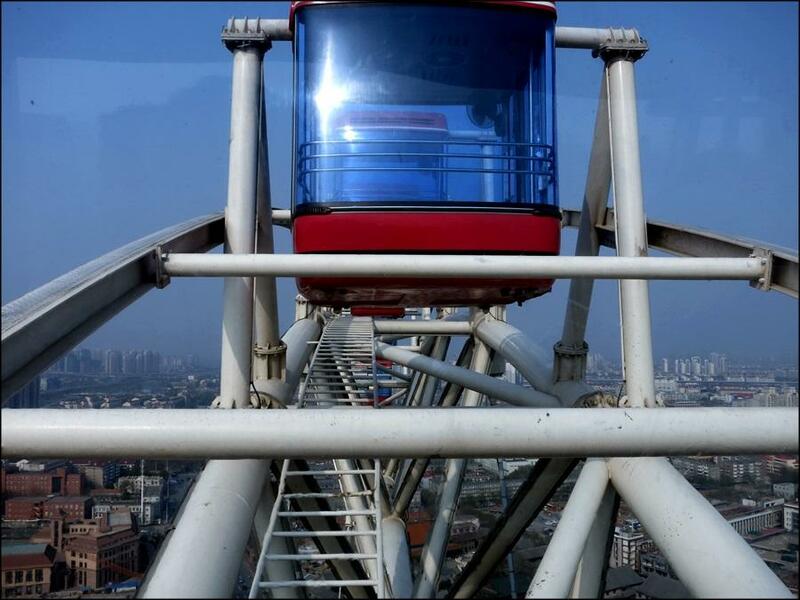 The 120 meter (394 ft) Tianjin Eye is the second highest Ferris wheel in China and 4th highest in the world. 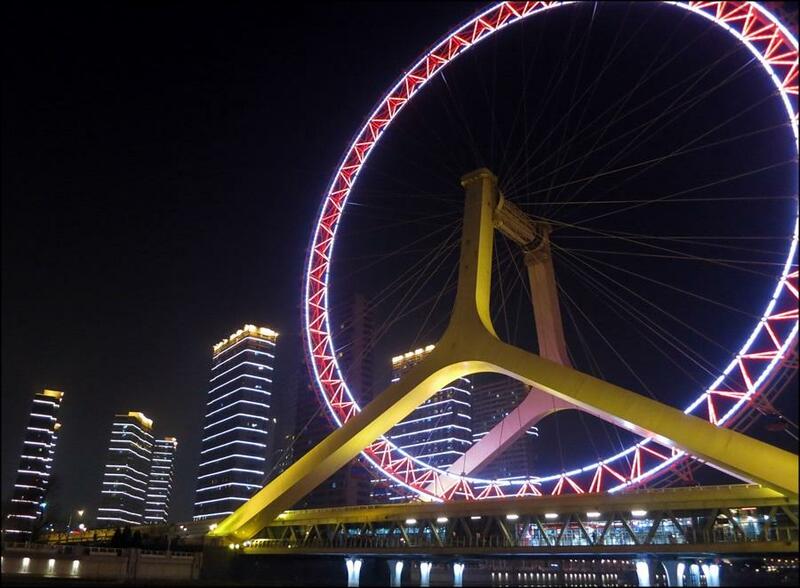 It's also the tallest Ferris wheel built on a bridge; in this case: the Yongle Bridge (or Chihai Bridge), over Tianjin's Hai He (river). 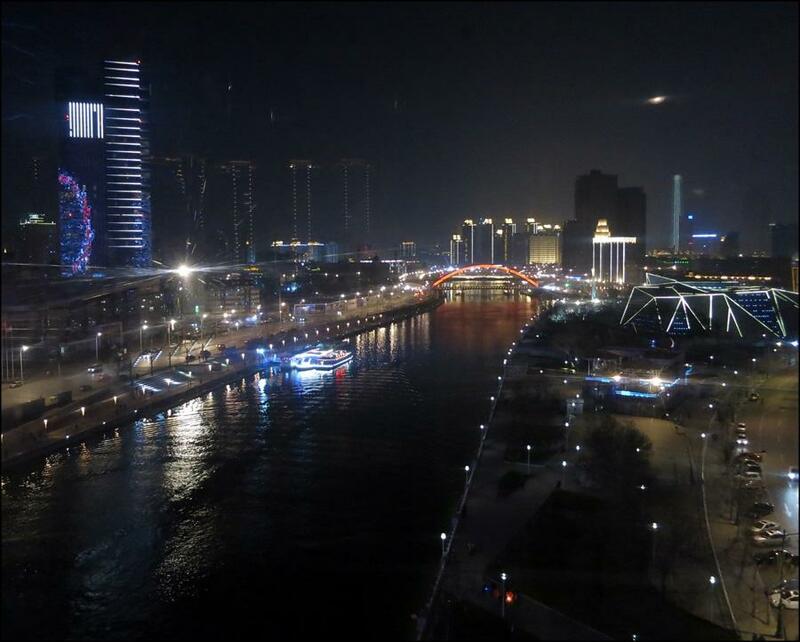 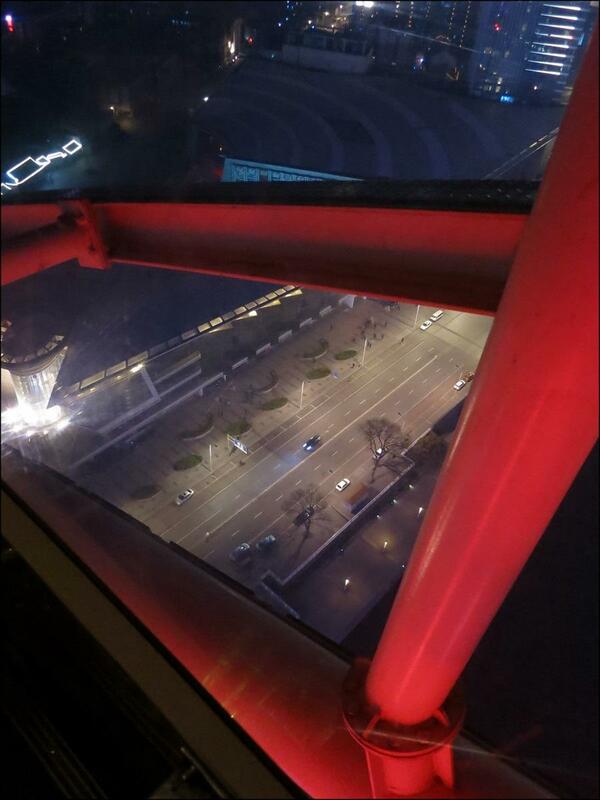 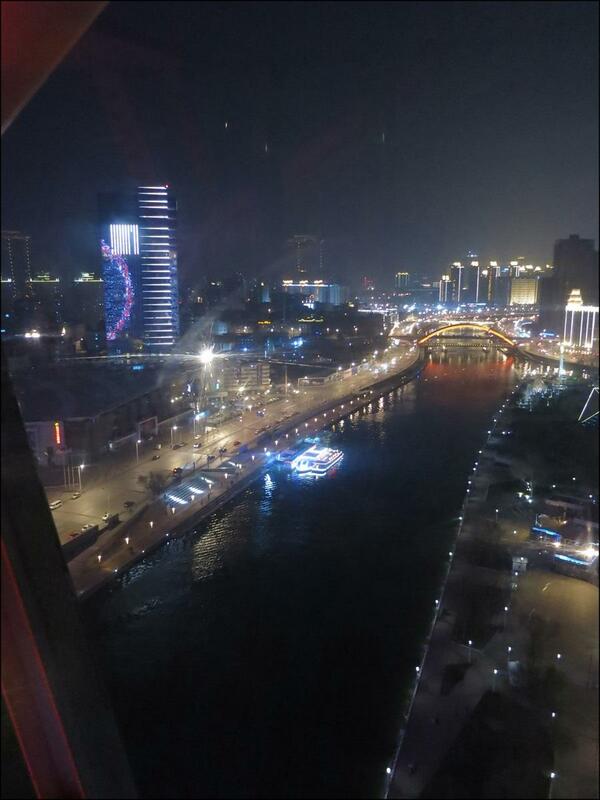 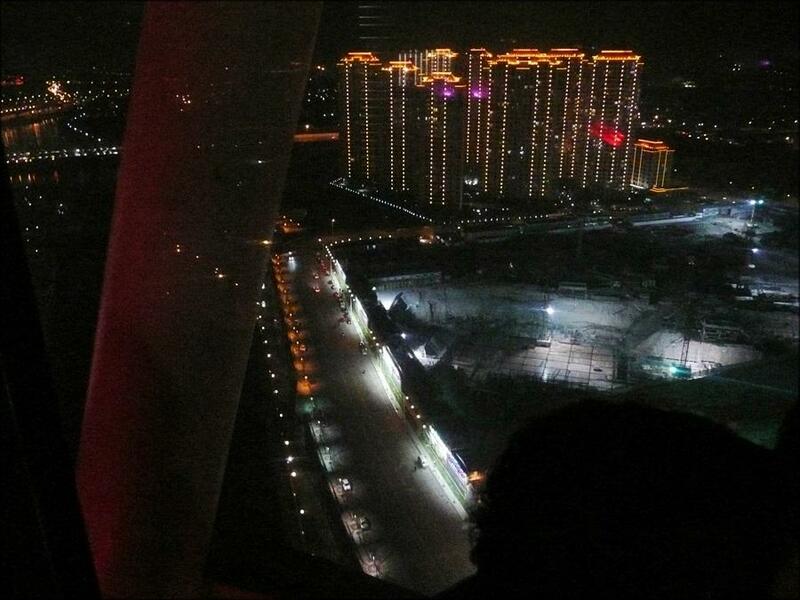 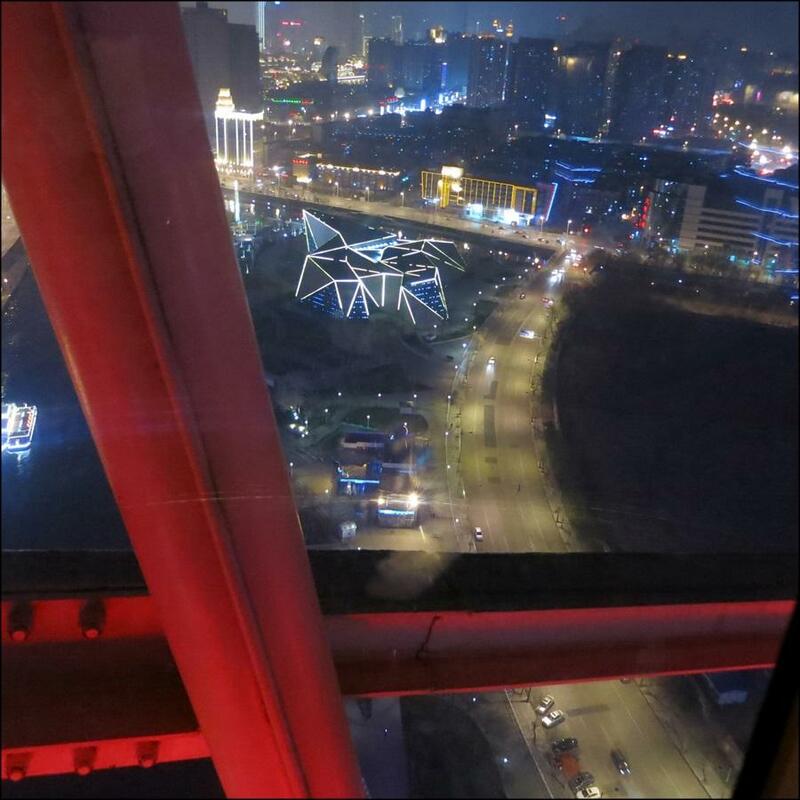 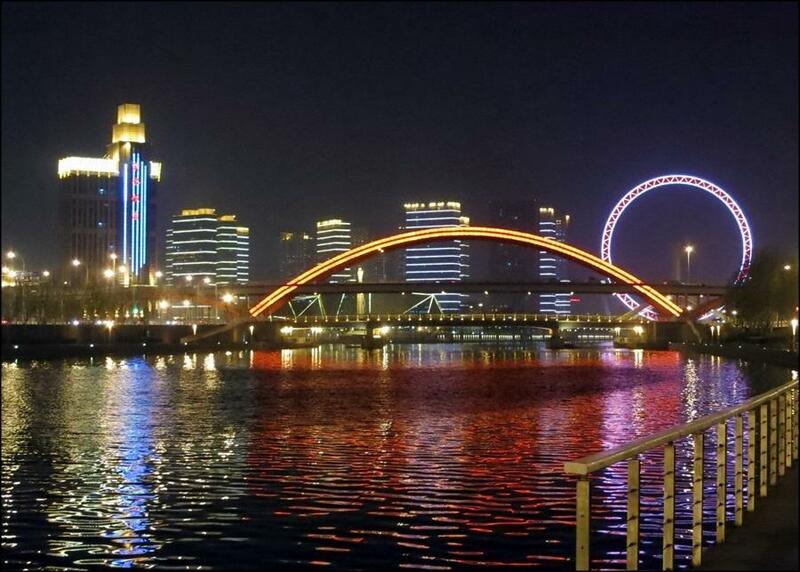 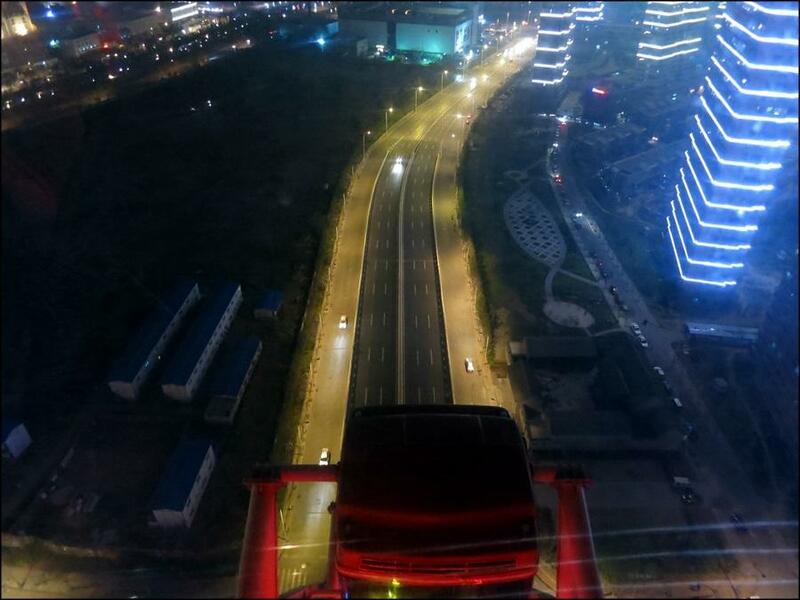 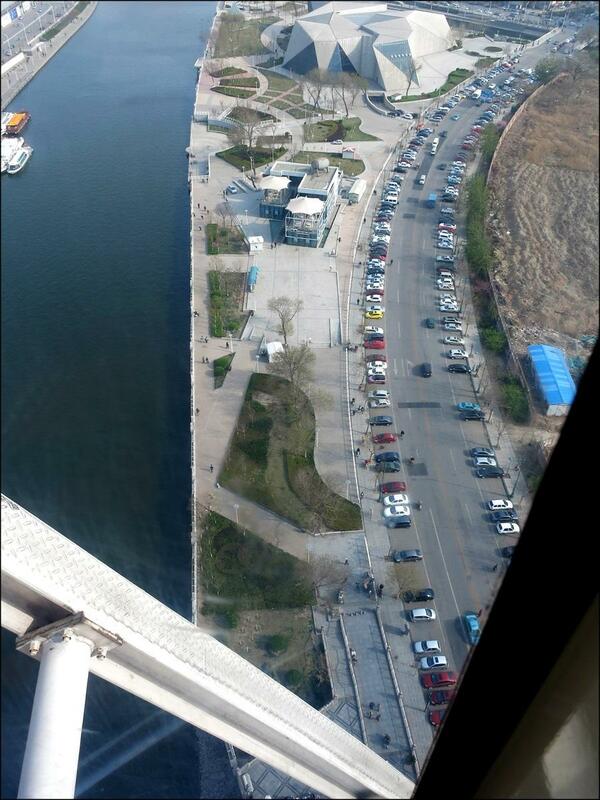 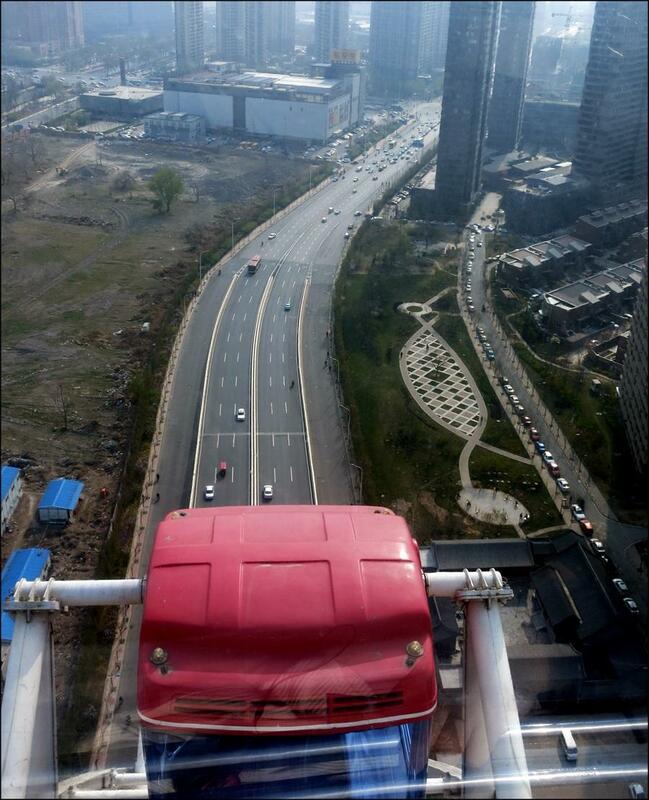 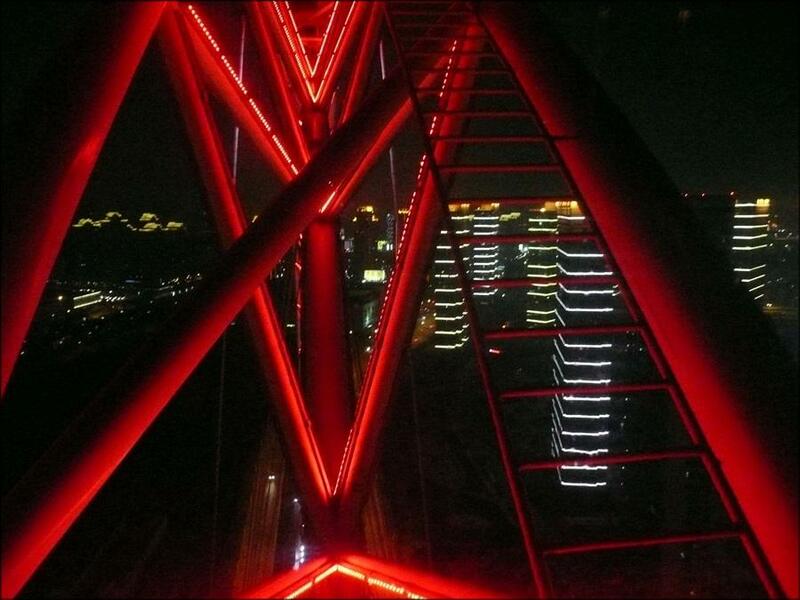 And since I already thought Tianjin's river/waterfront is one of the prettiest urban places I've ever seen, and since I was trying -- and succeeding -- in getting rid of my fear of heights...well, I rode the Tianjin Eye three times, once in the daytime and on two separate nights. 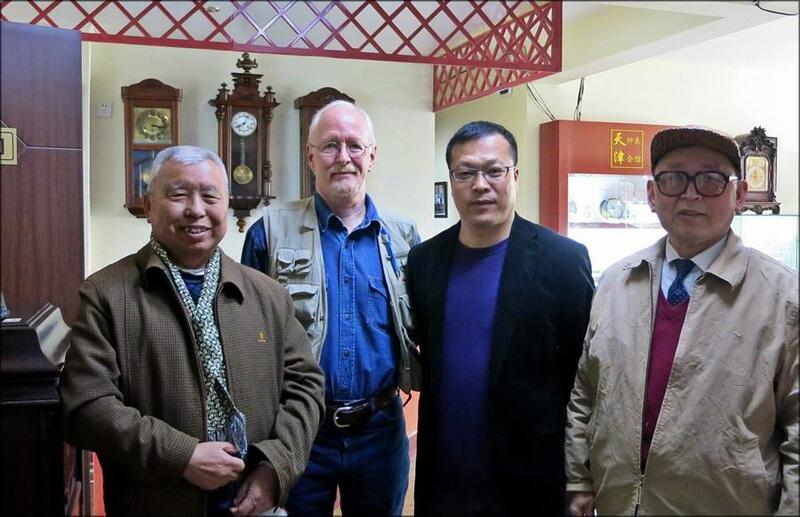 One photo includes my good friend Da Wei. 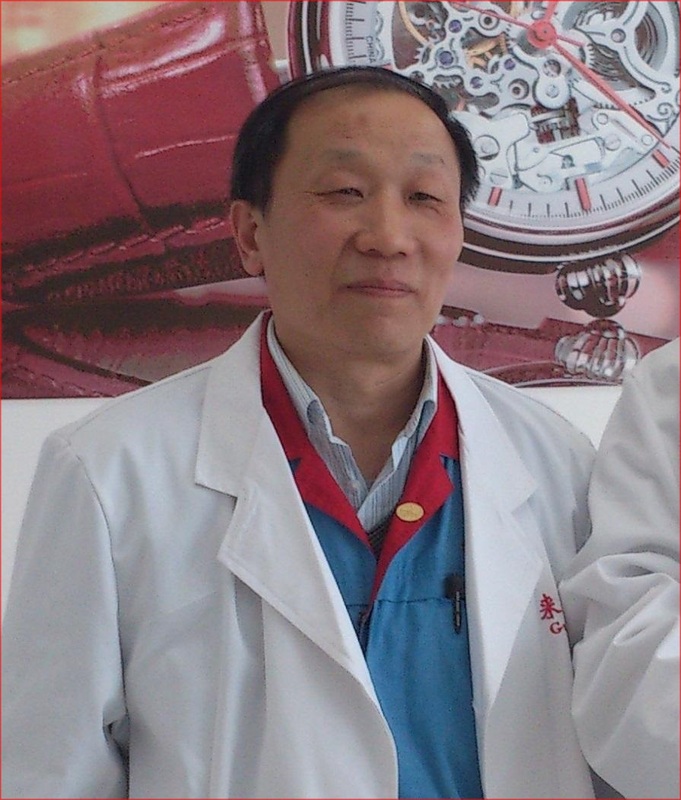 I first met Da Wei in scenic Peace River Alberta (where I live) because he was working there. 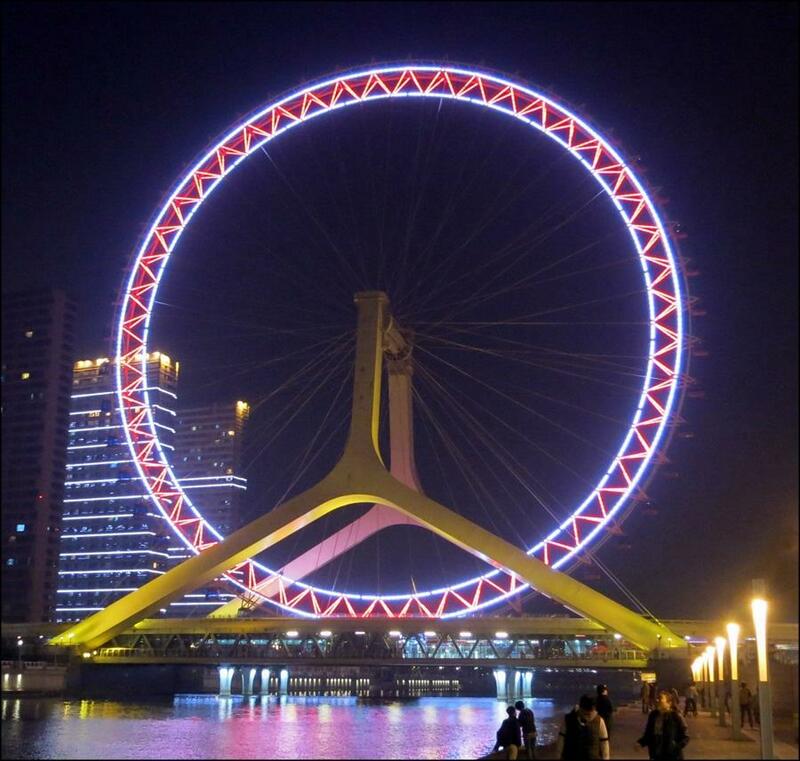 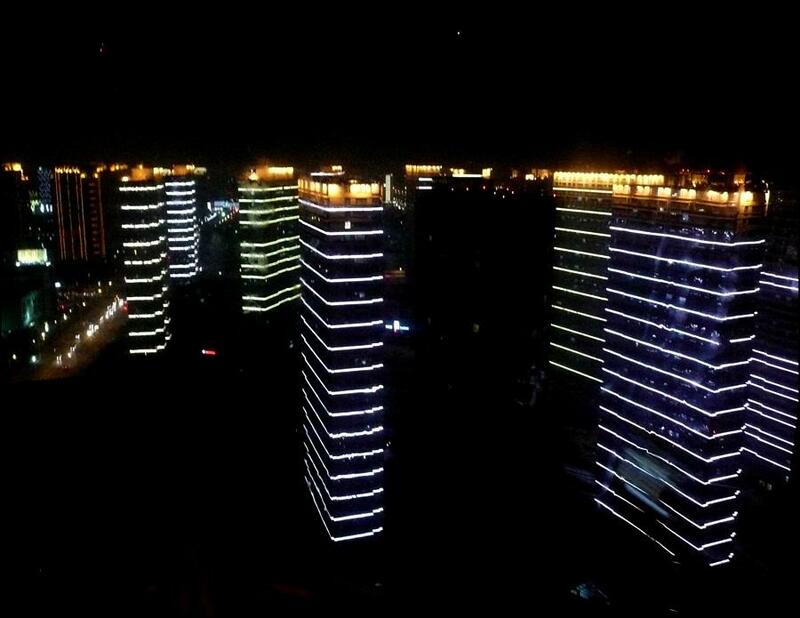 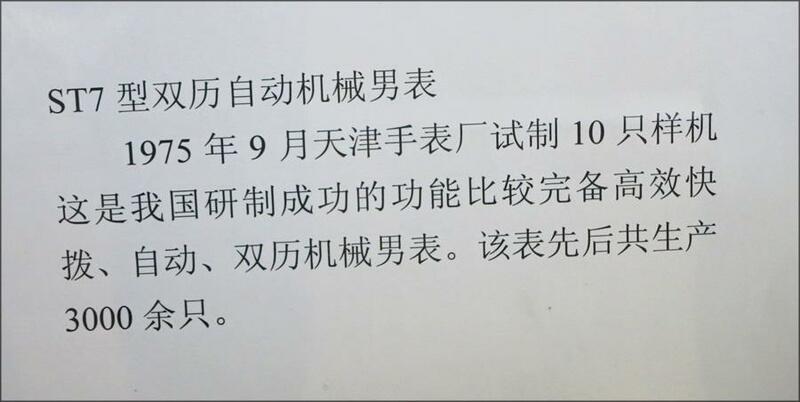 But Tianjin is Da Wei's home city, and he was back there after a couple of years in Peace River. 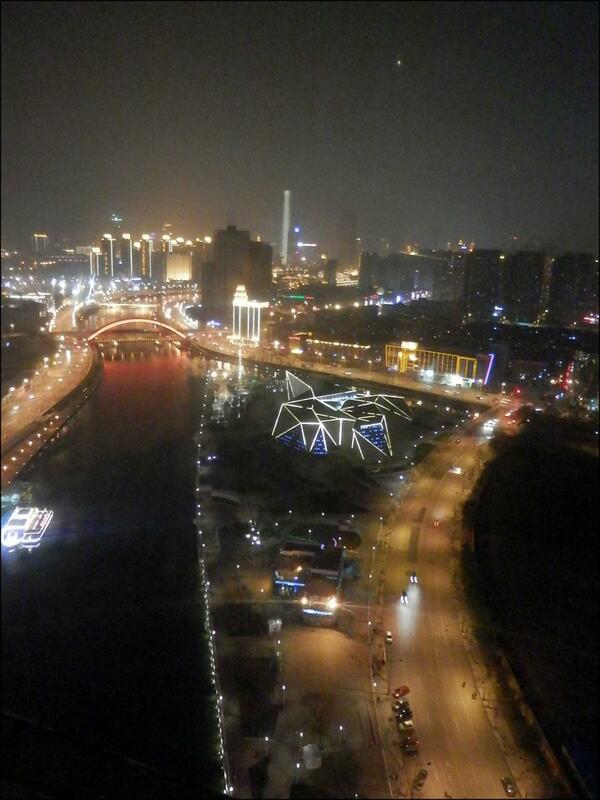 Before he left, though, we'd made plans to meet up together when we were both in Tianjin :-). 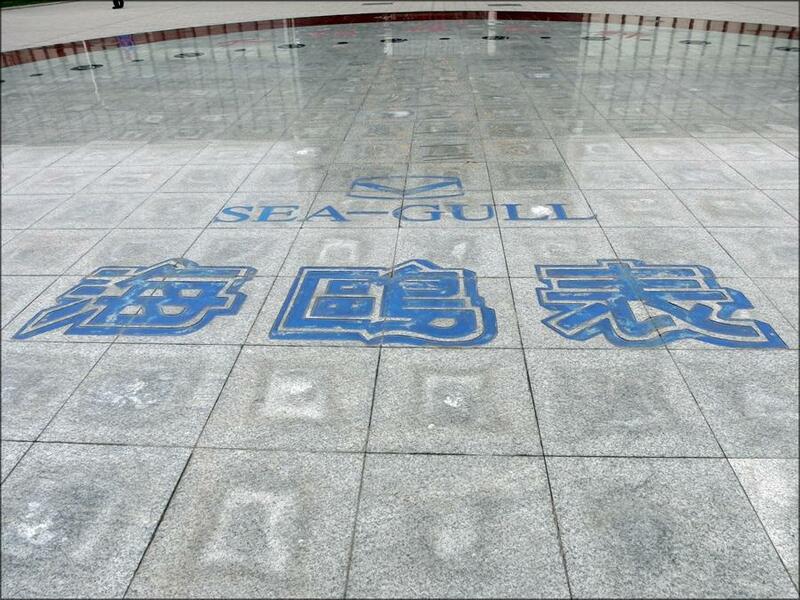 I was extremely pleased to be able to revisit the facilities of the Sea-Gull Watch Group Marketing Ltd., Tianjin (天津海鸥手表集团销售有限公司 / 39° 7' 1.20" N 117° 24' 14.36" E ) on April 21st, and I very much want to very sincerely thank a few folks who I know had a hand in ensuring this visit to the Tianjin Sea-Gull facility was extra special for me. 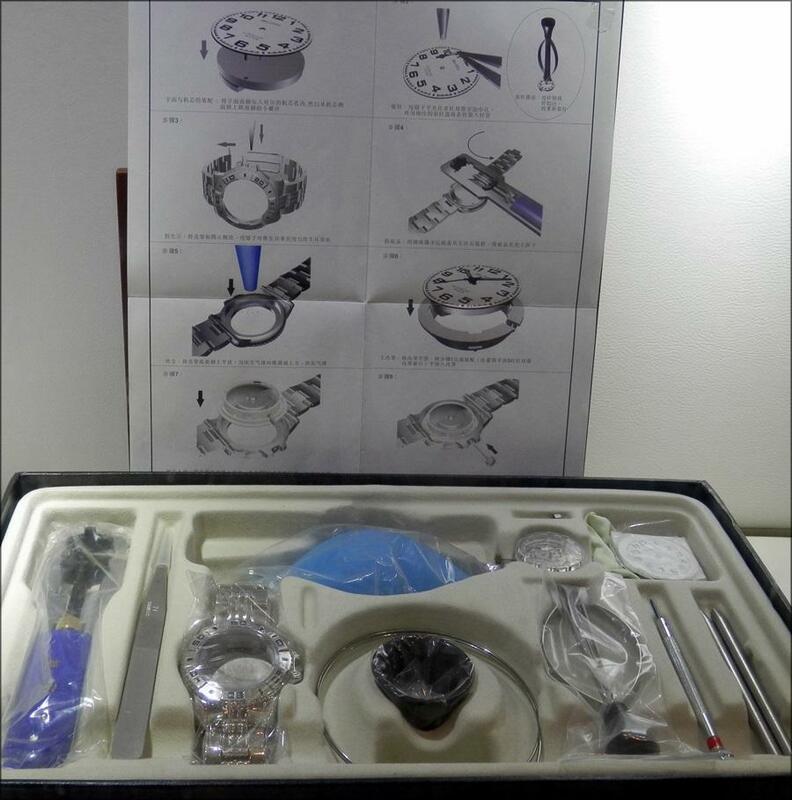 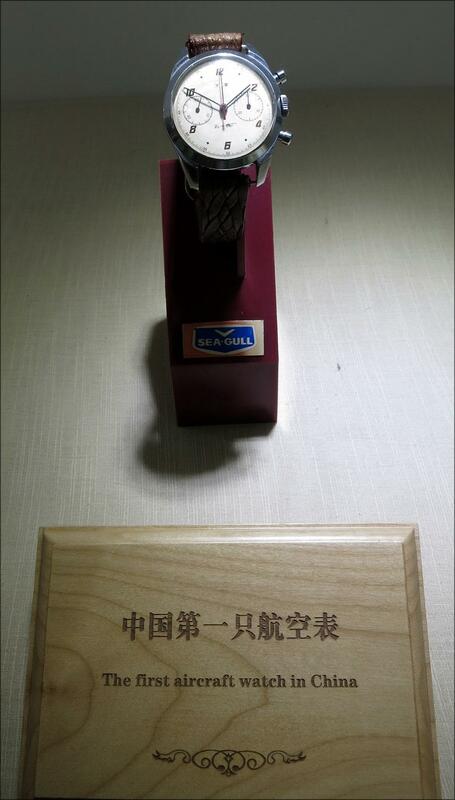 Mr. Du Jianhe / Deputy General Manager / Tianjin Sea-Gull Watch Technologies, Co., Ltd.
Mr. Han Huishuang: Store Manager / Tianjin Sea-Gull Watch Technologies, Co., Ltd. 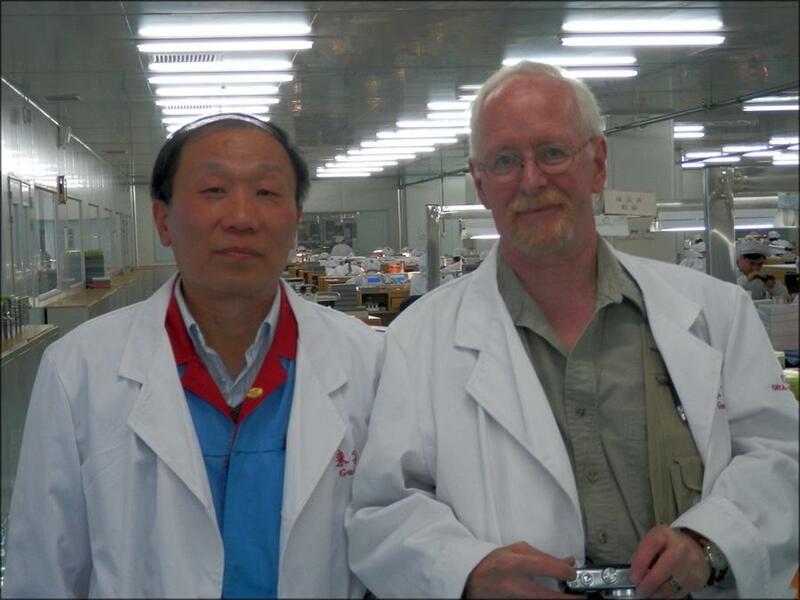 I've (regretfully) misplaced the name of my guide this visit. 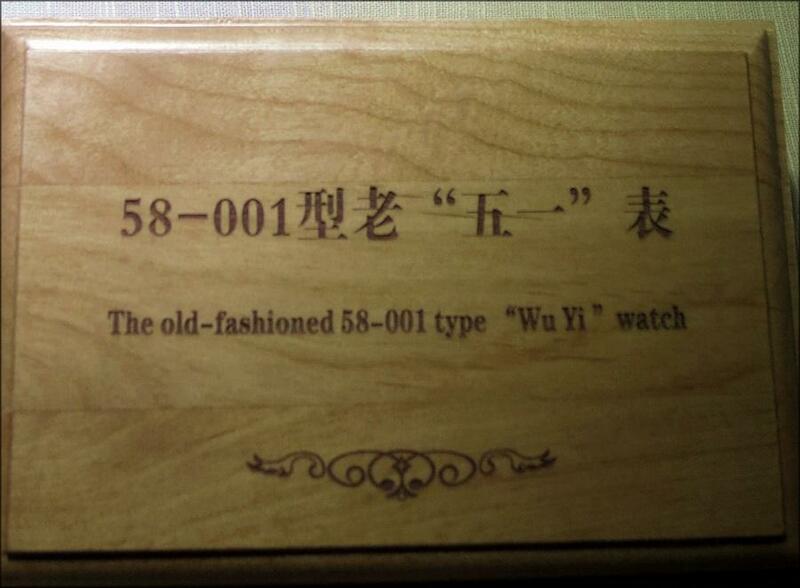 I'll amend this as soon as I have her name. 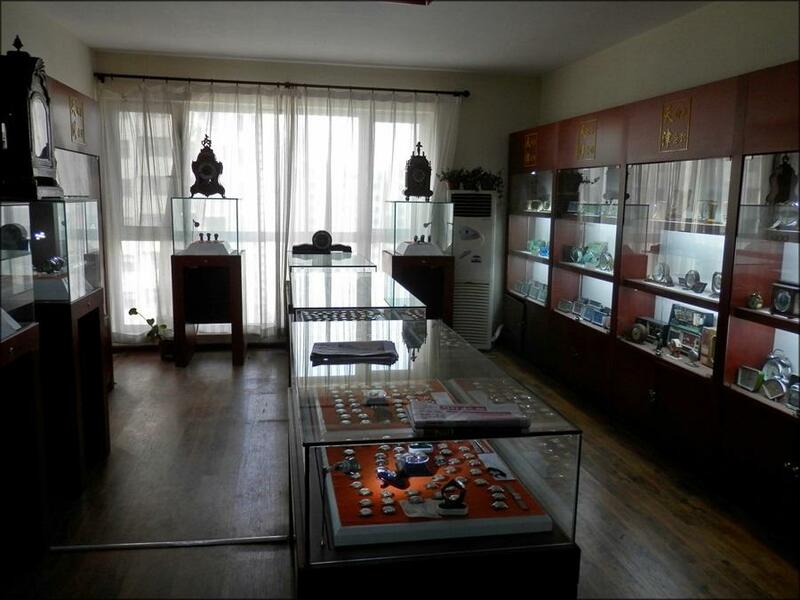 She was knowledgeable and friendly, and her English was pleasantly fluent. 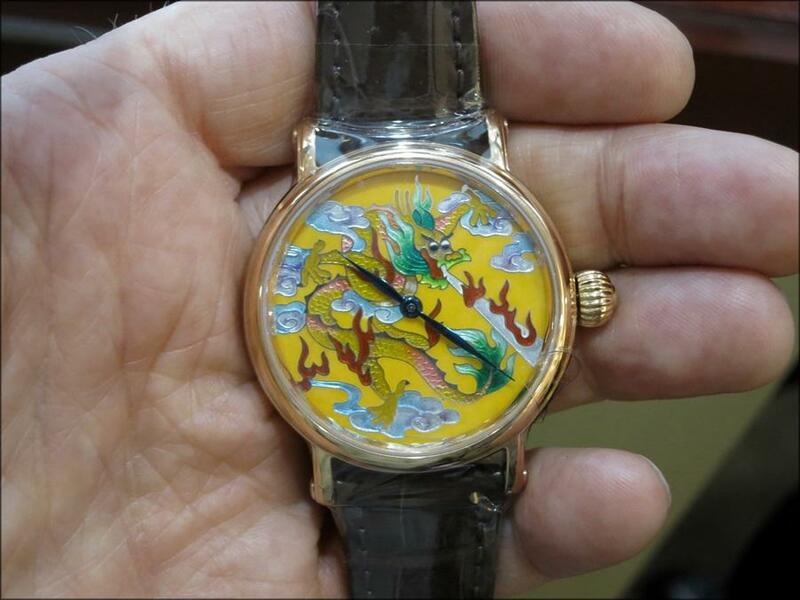 ...and, as always, Joel Chan. 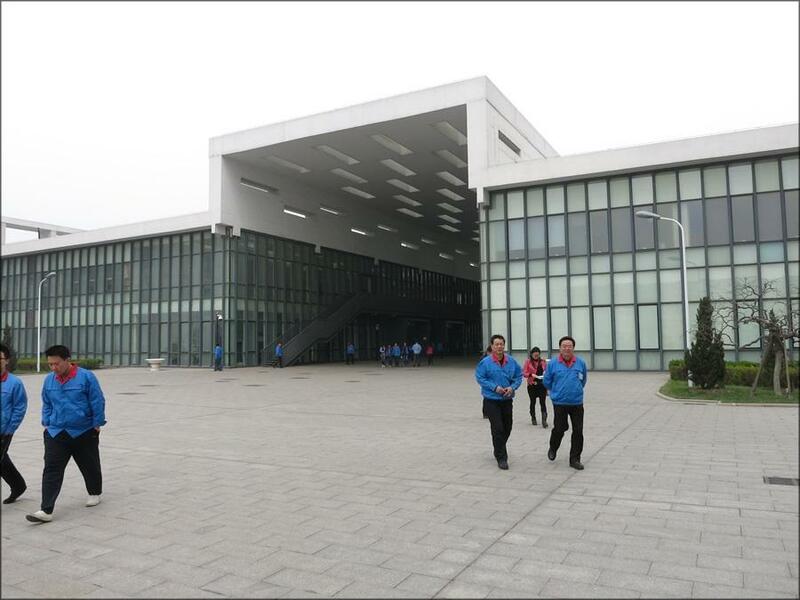 The weather was OK but gray and nothing special, so I didn't bother too much with outside photos (and I was happy enough with the outside shots from the last visit anyways) . 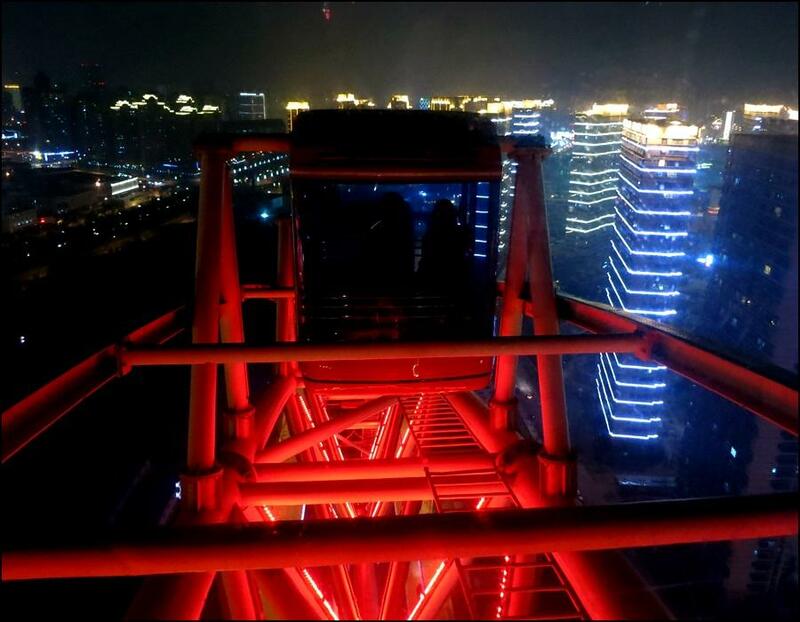 Inside, though, was different. 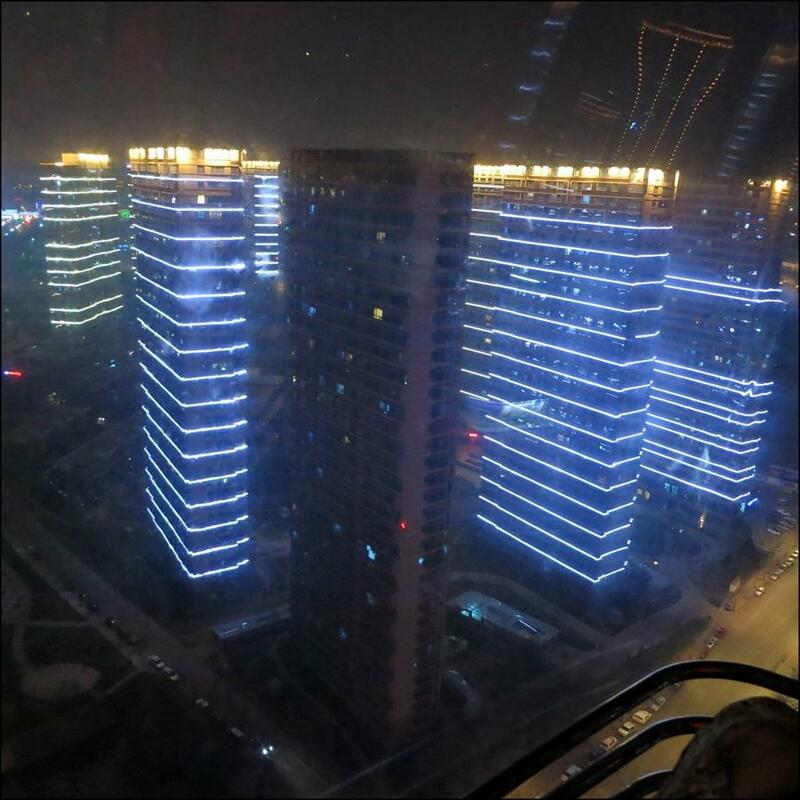 I wanted to do a better job inside than I did last time and I think maybe I succeeded. 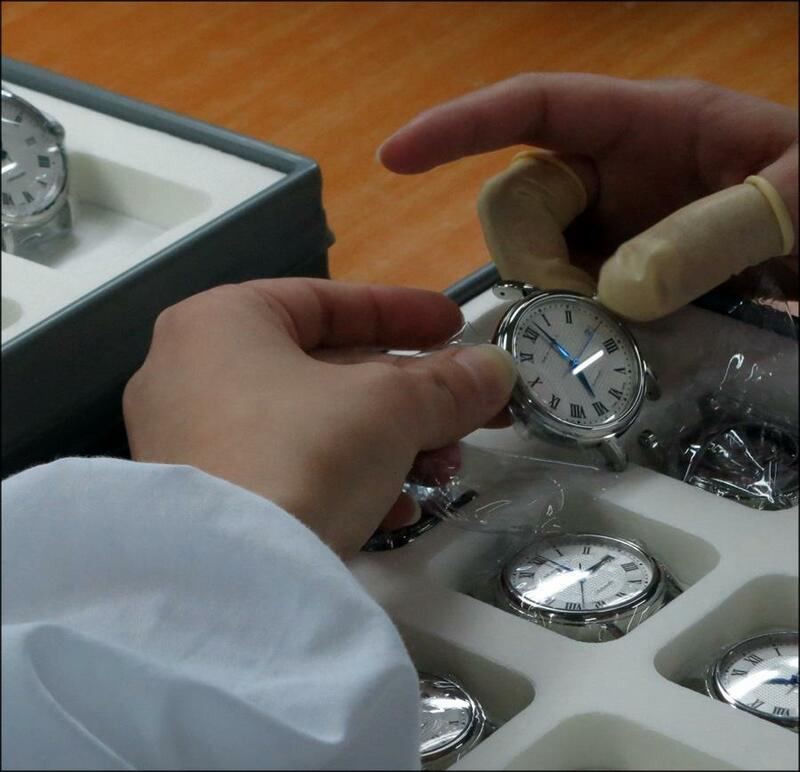 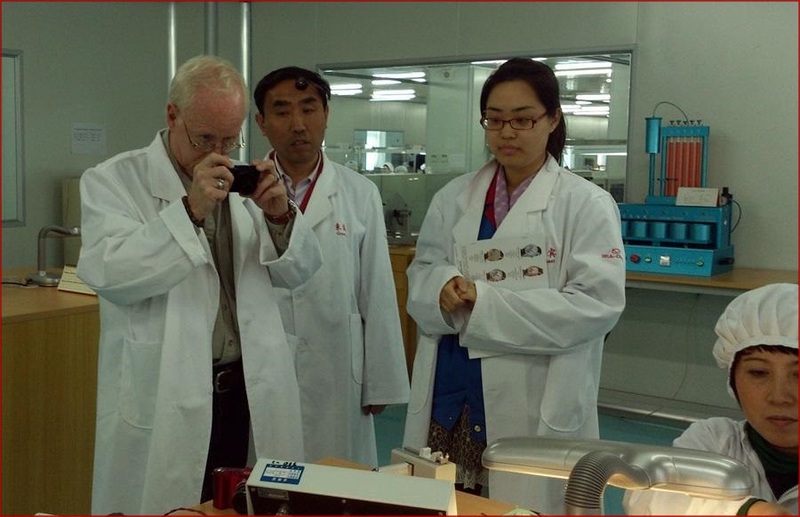 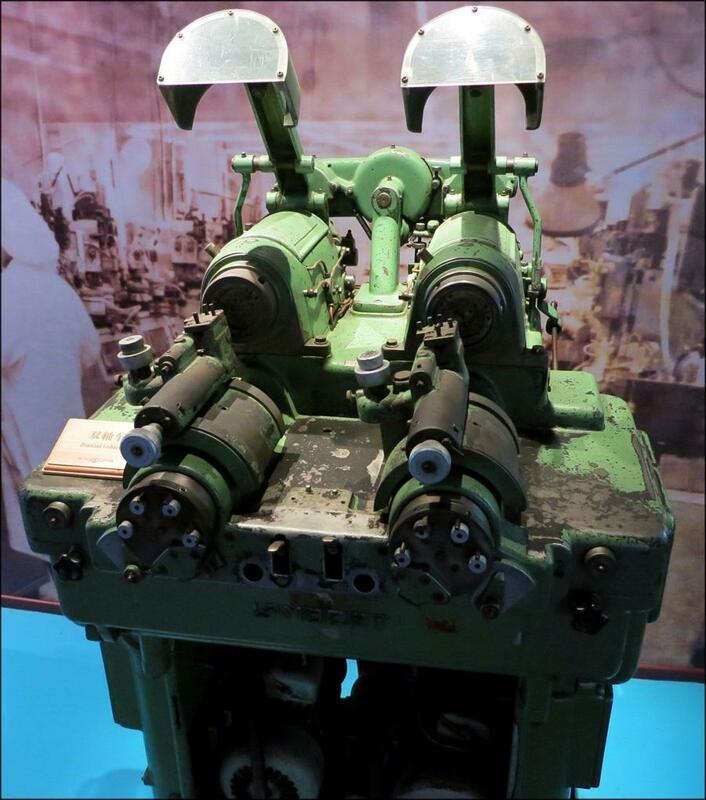 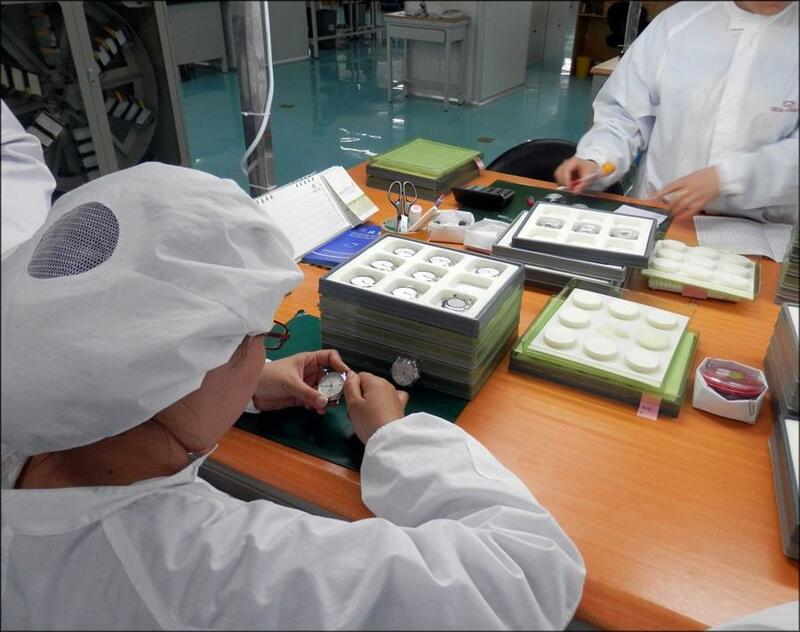 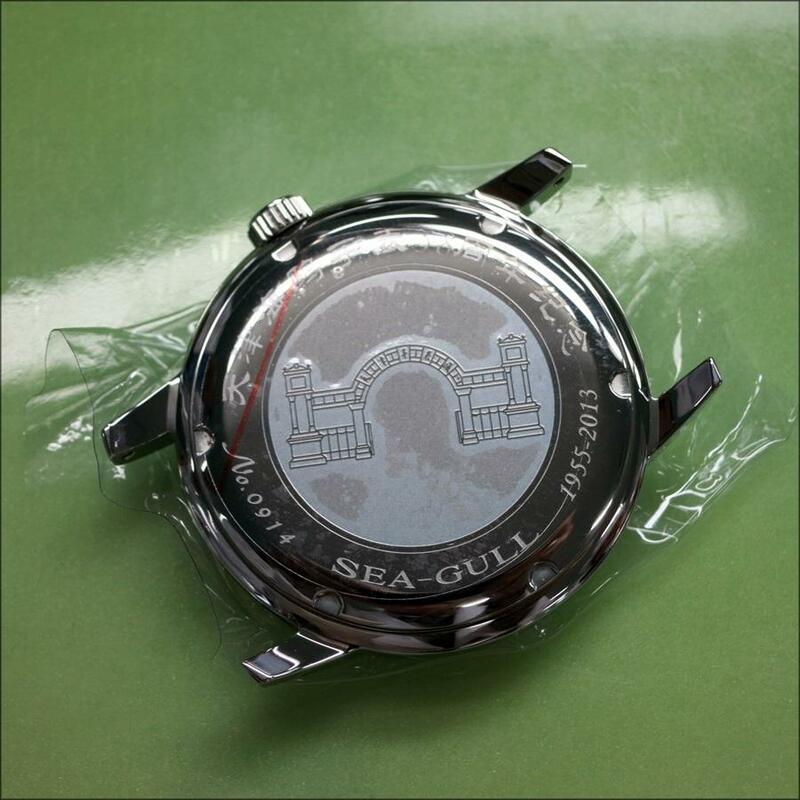 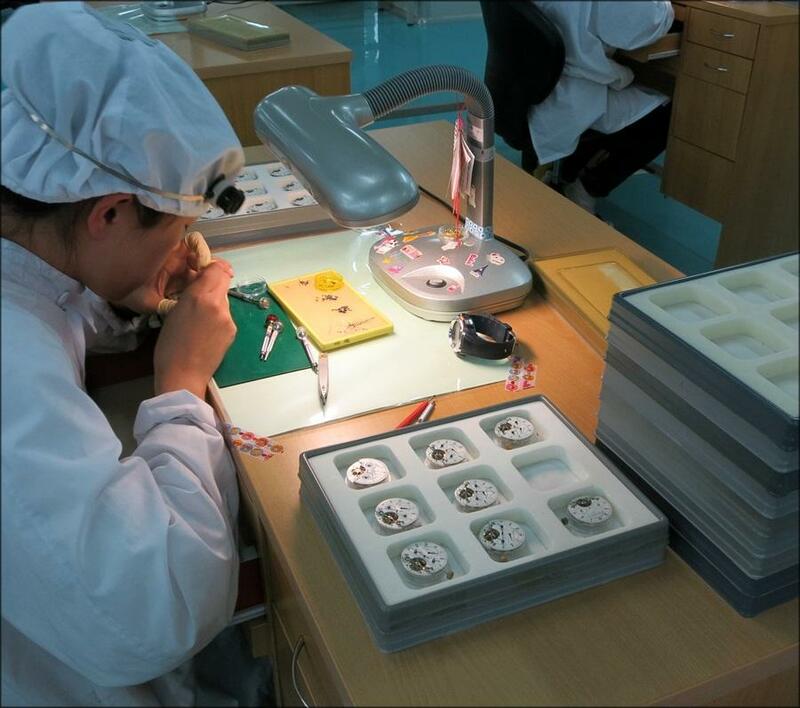 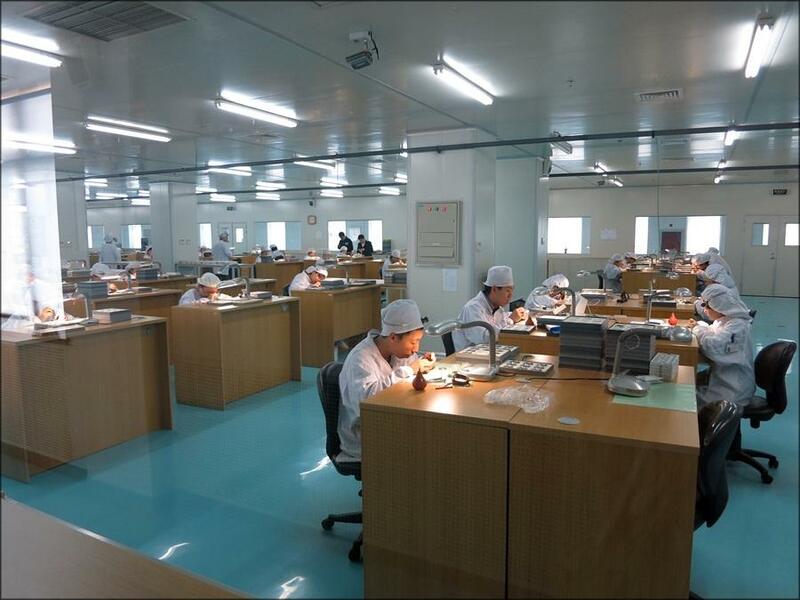 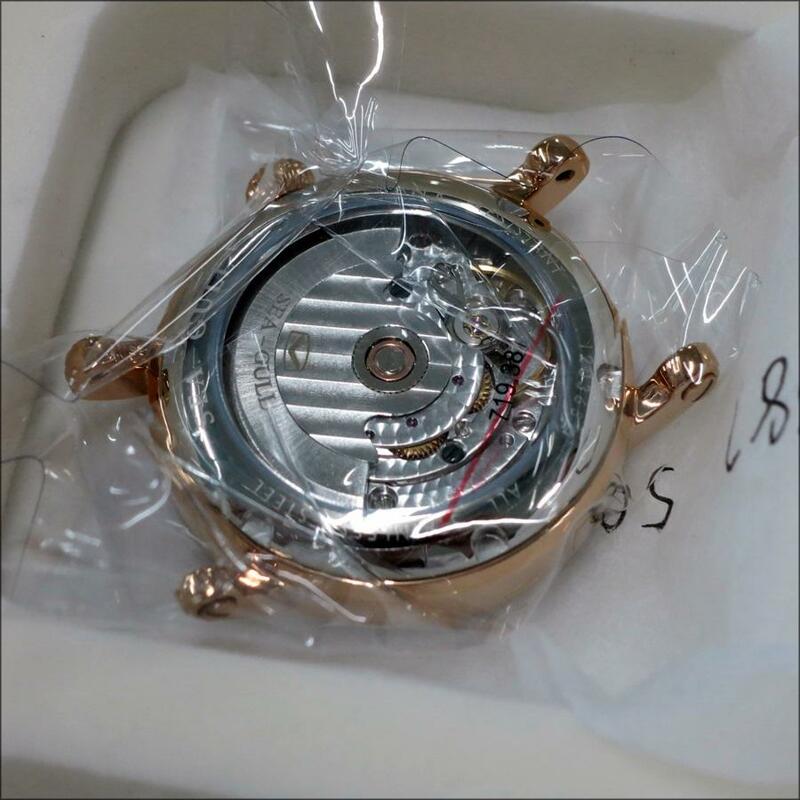 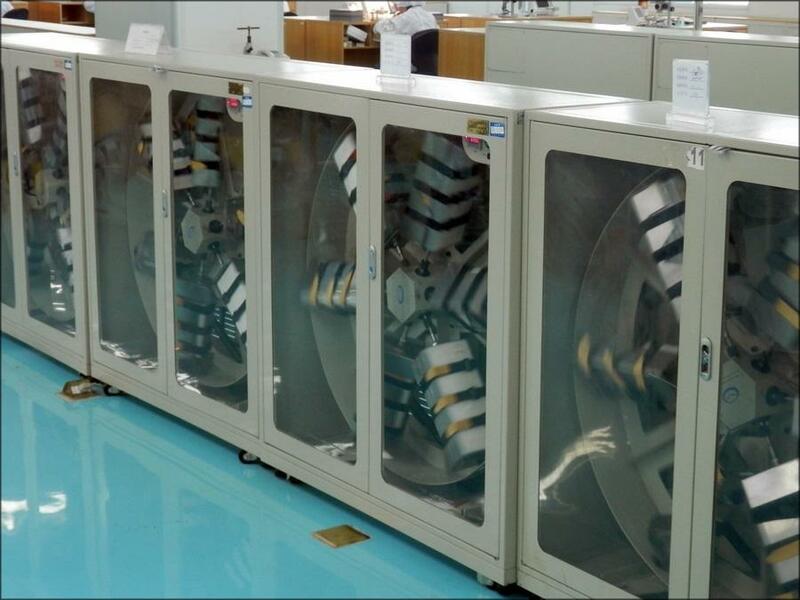 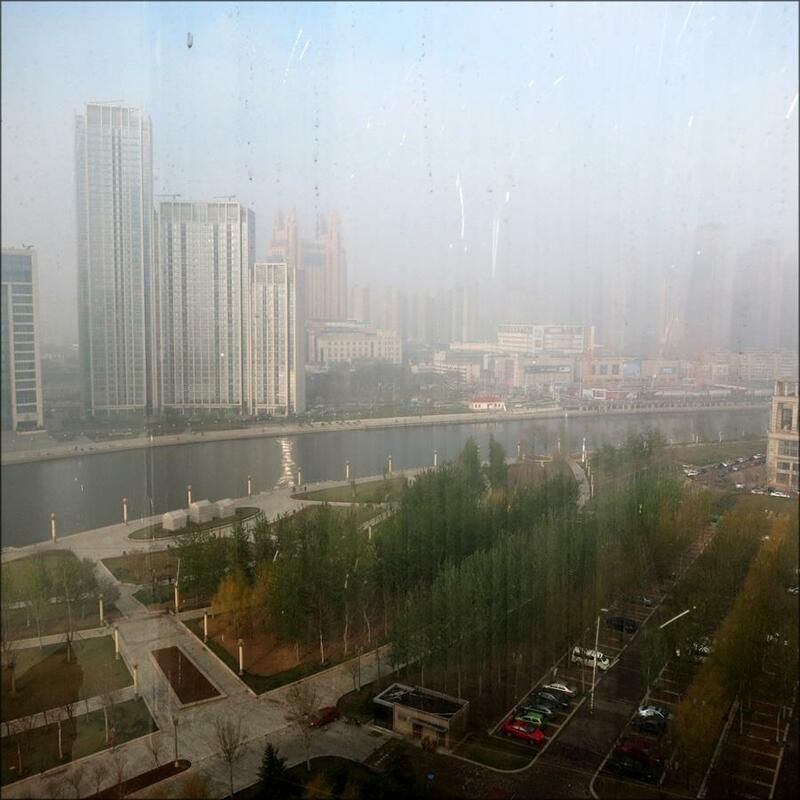 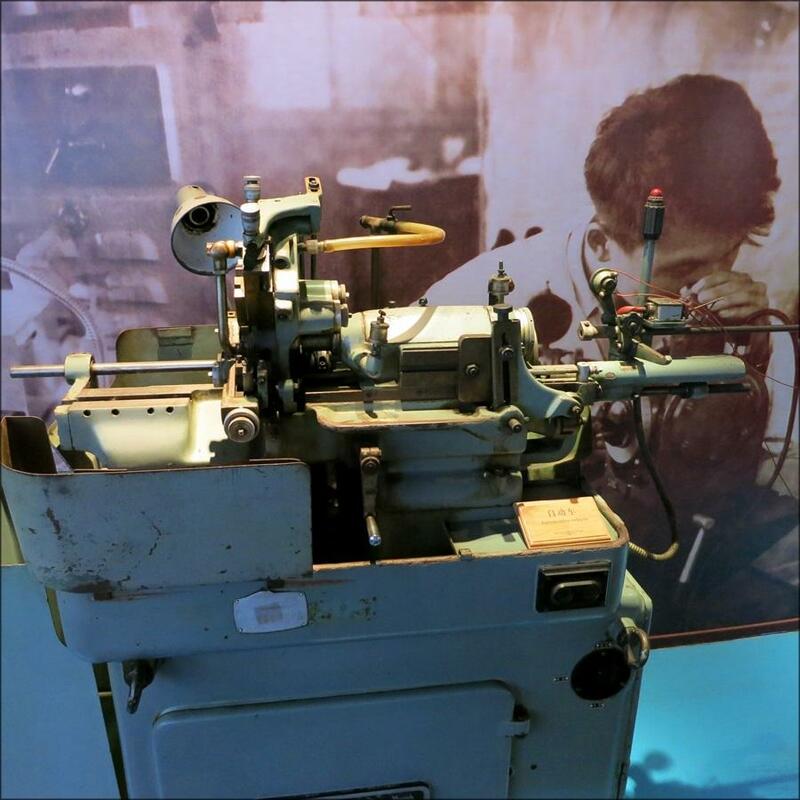 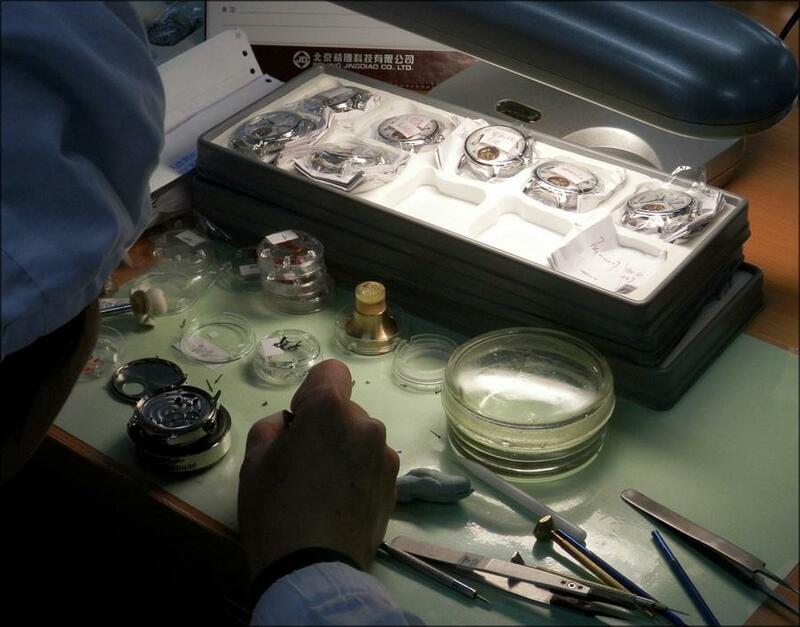 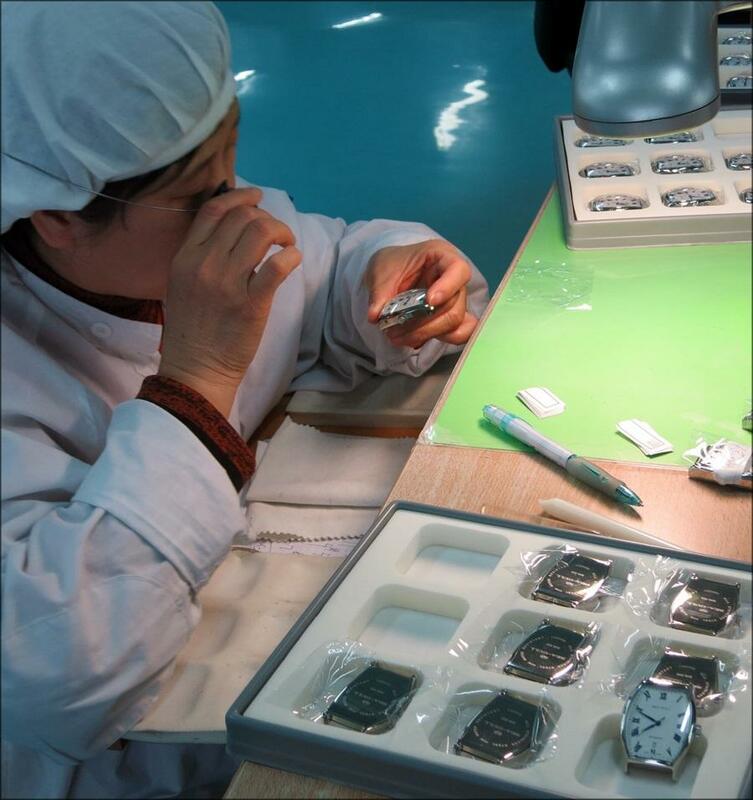 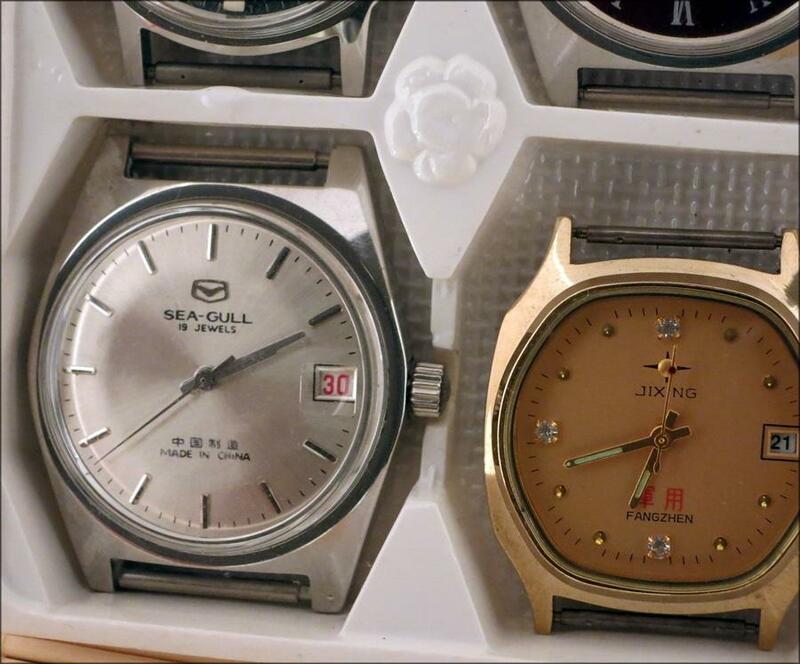 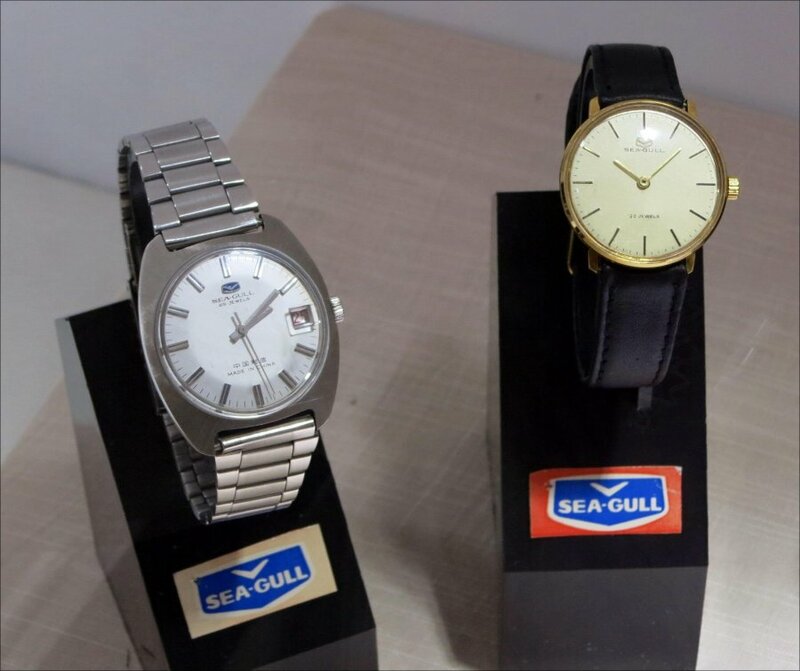 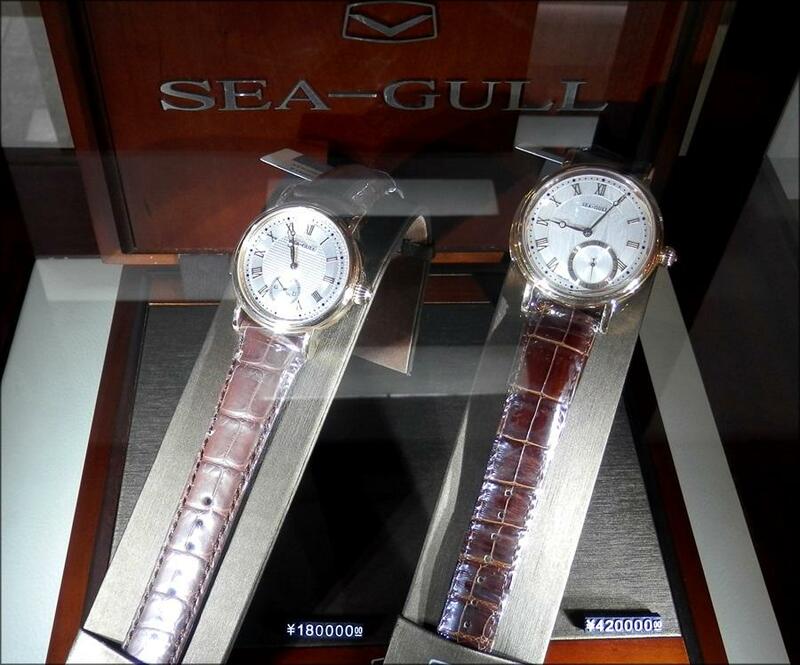 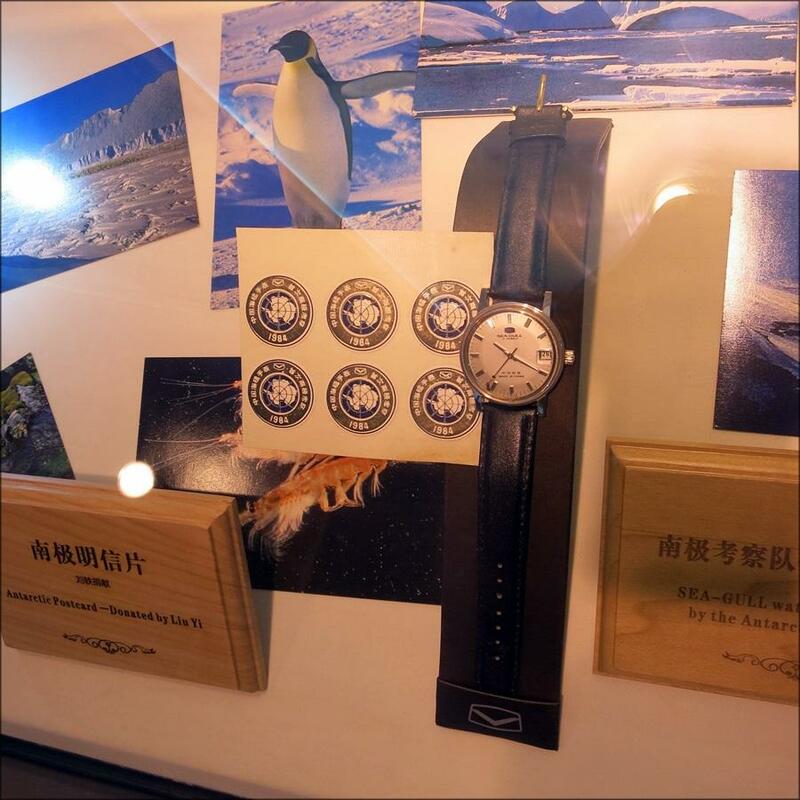 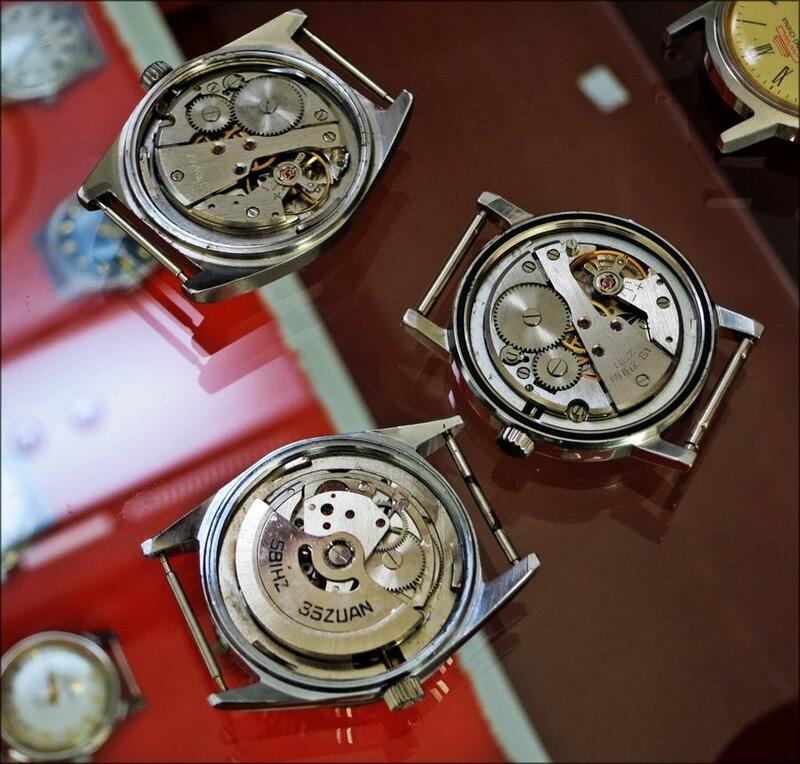 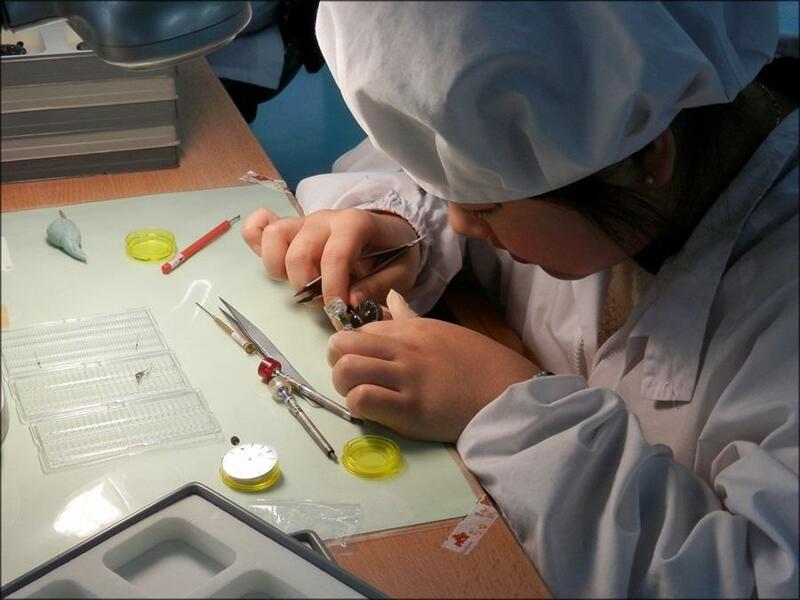 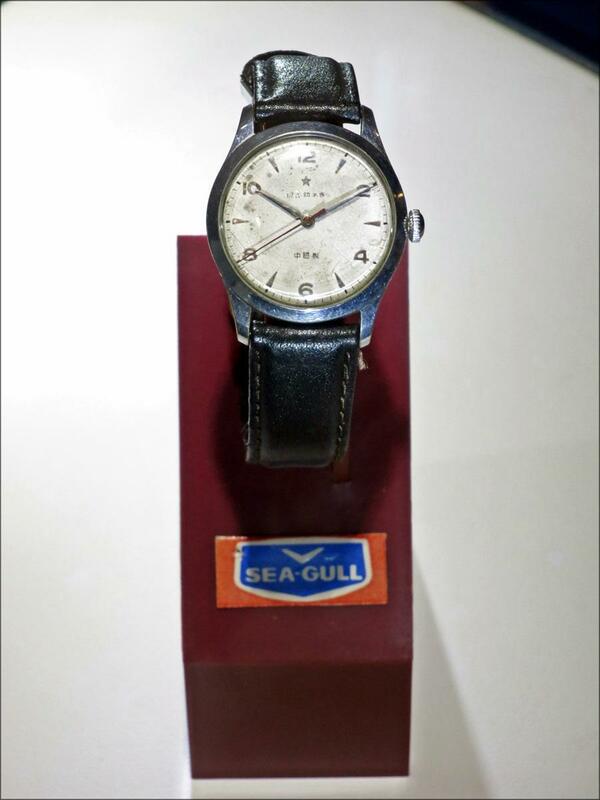 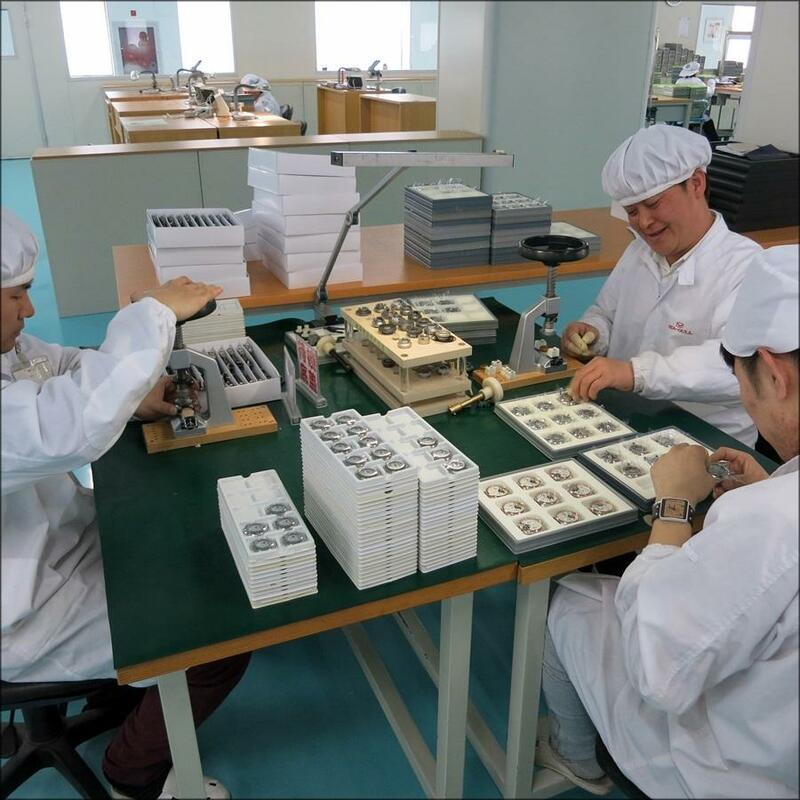 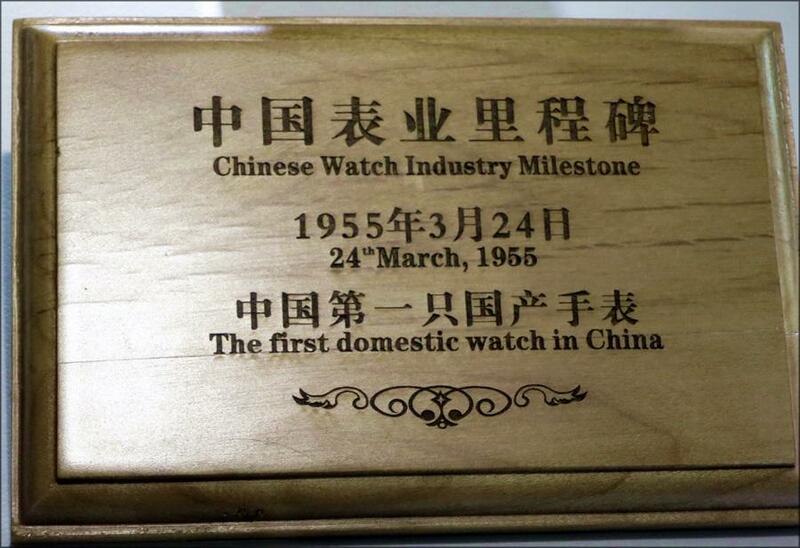 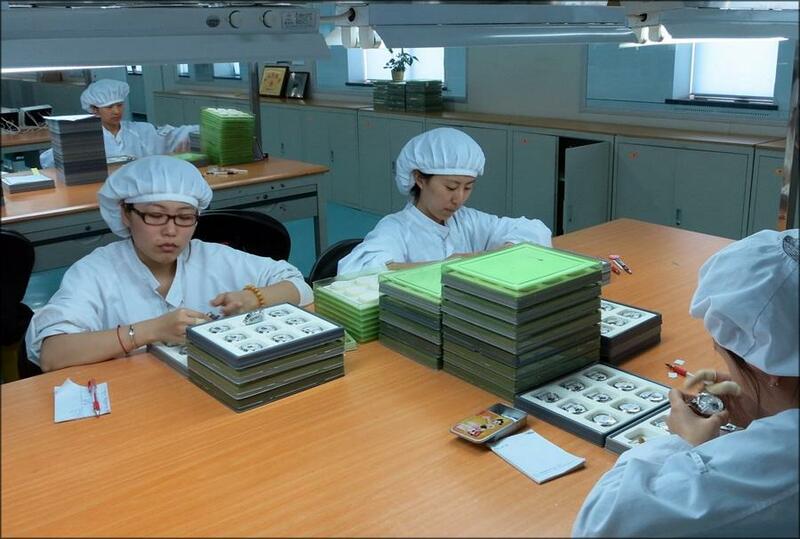 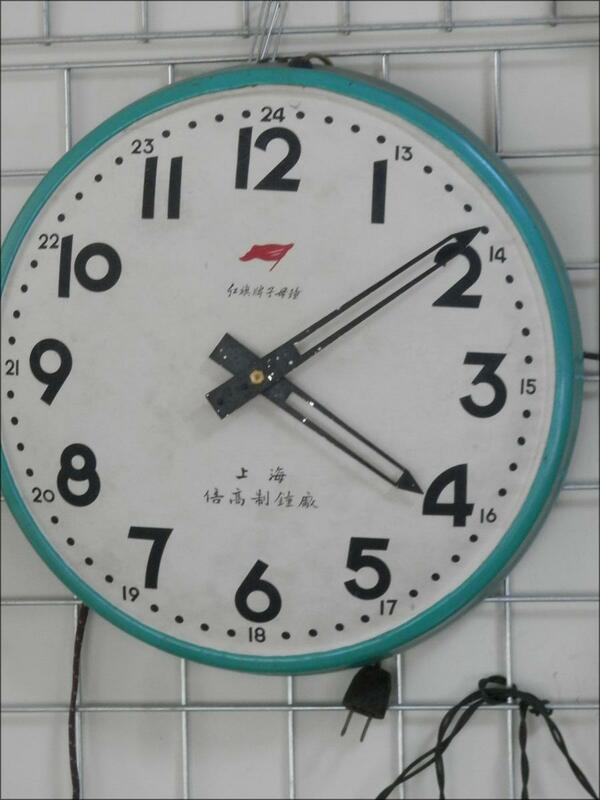 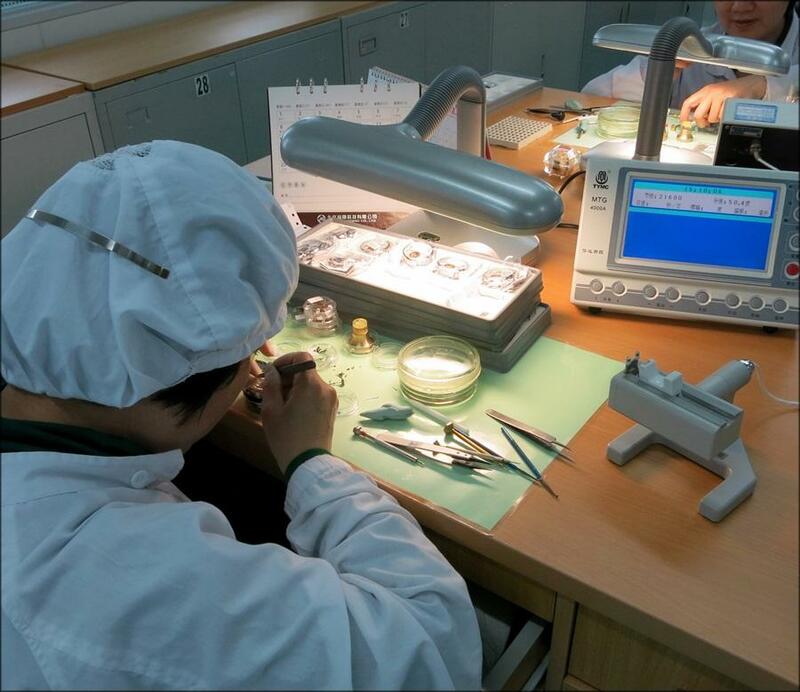 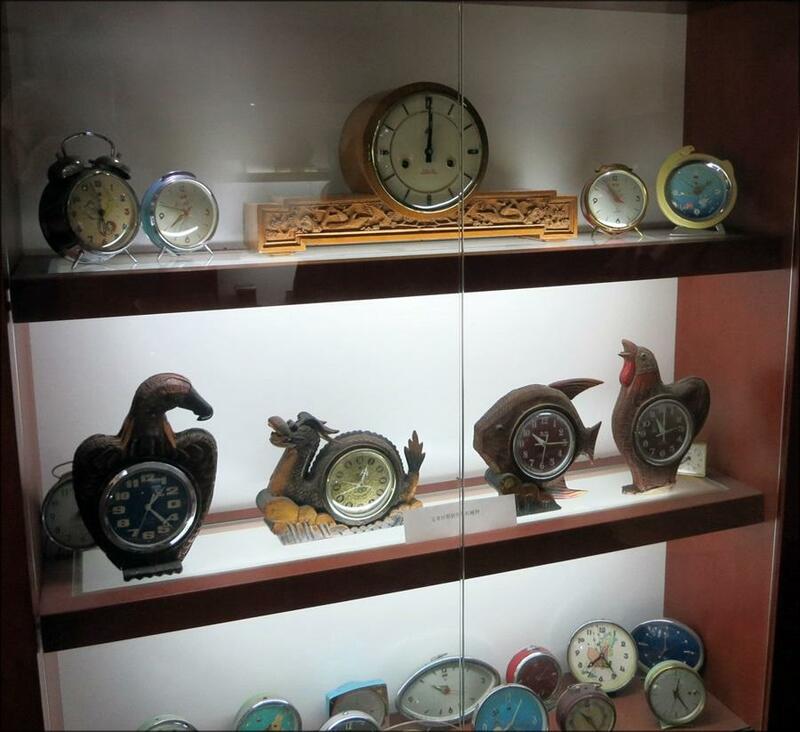 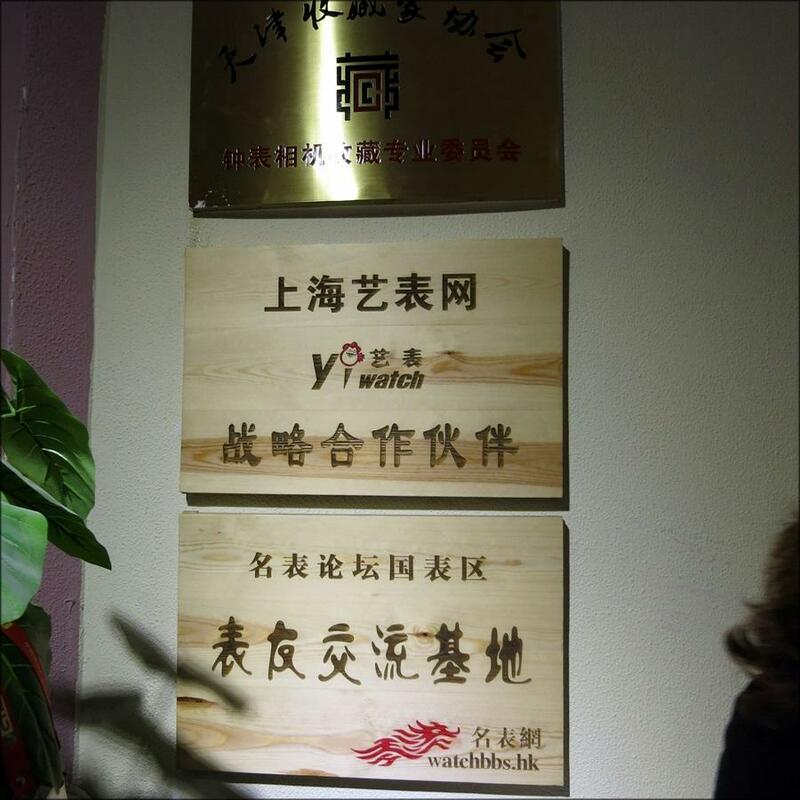 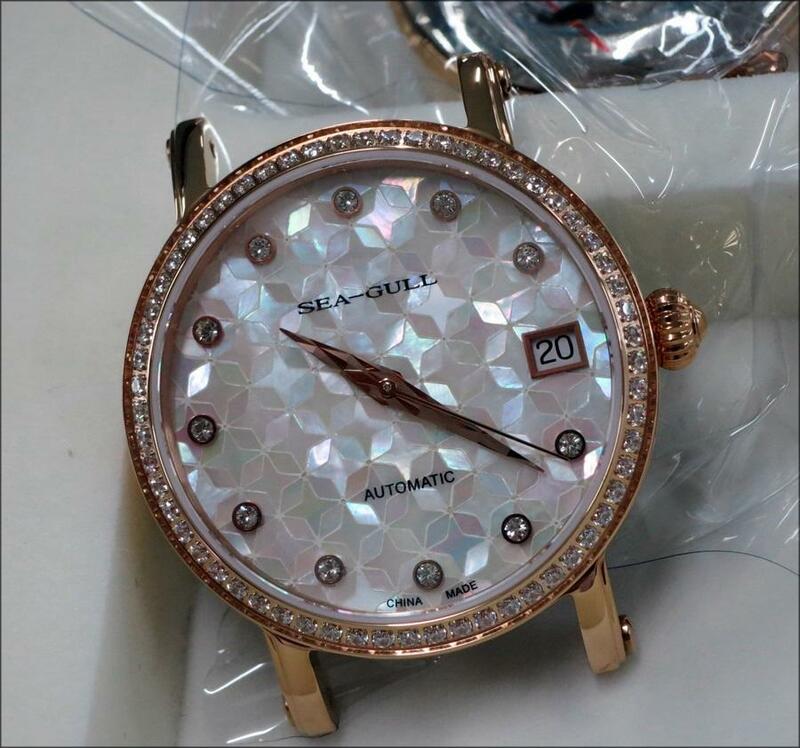 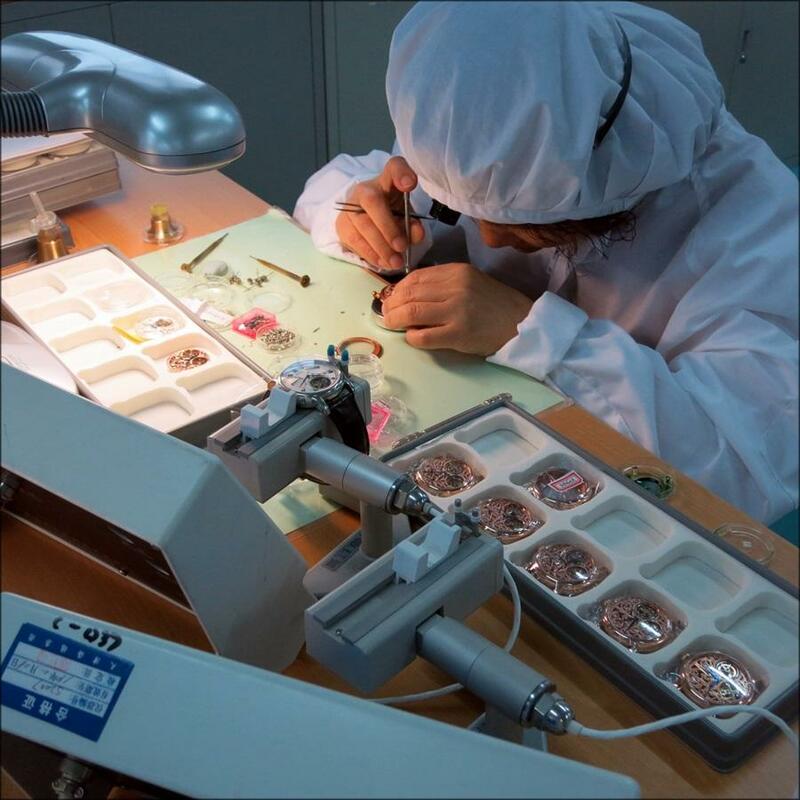 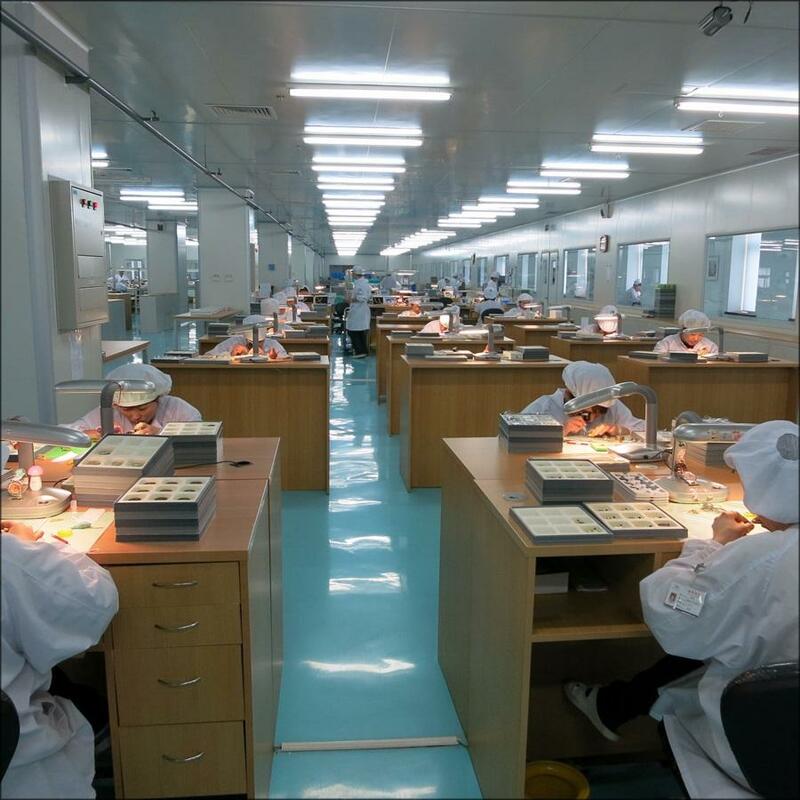 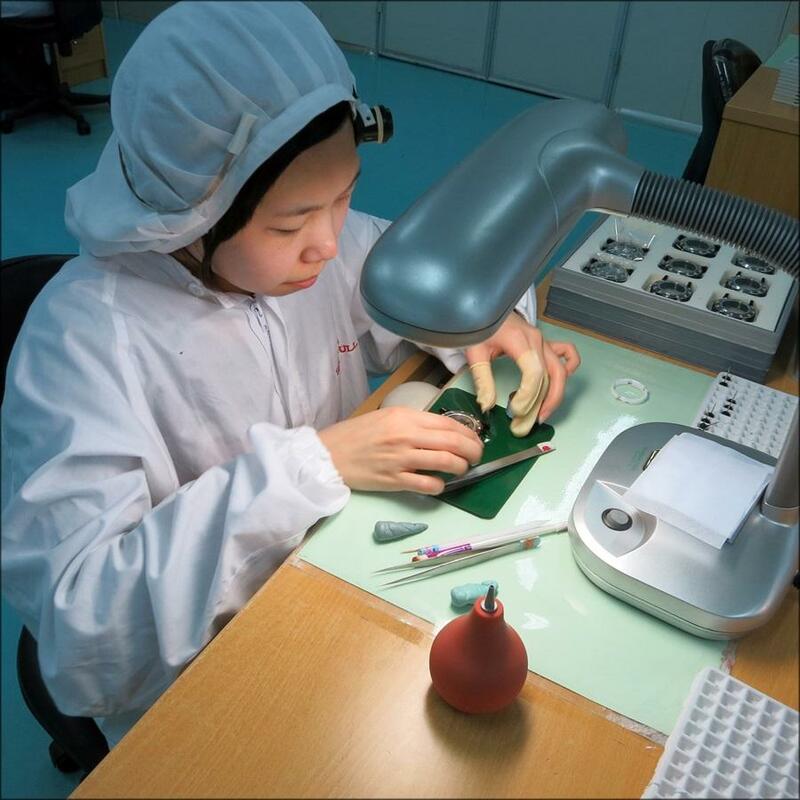 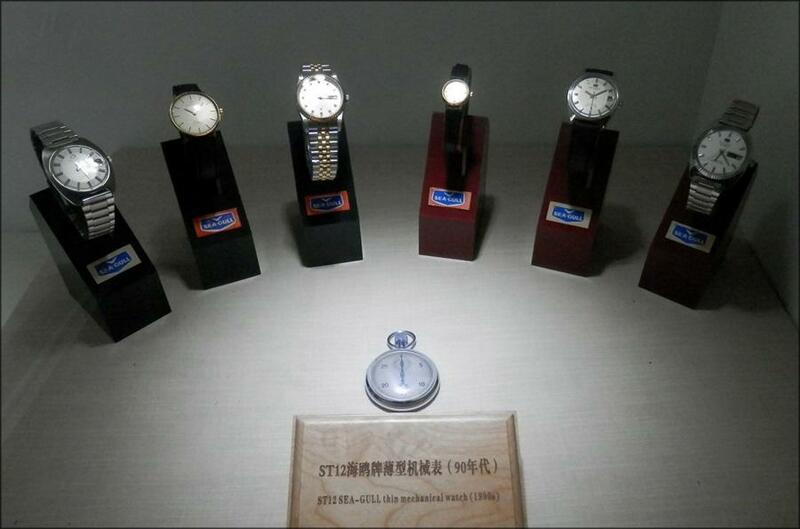 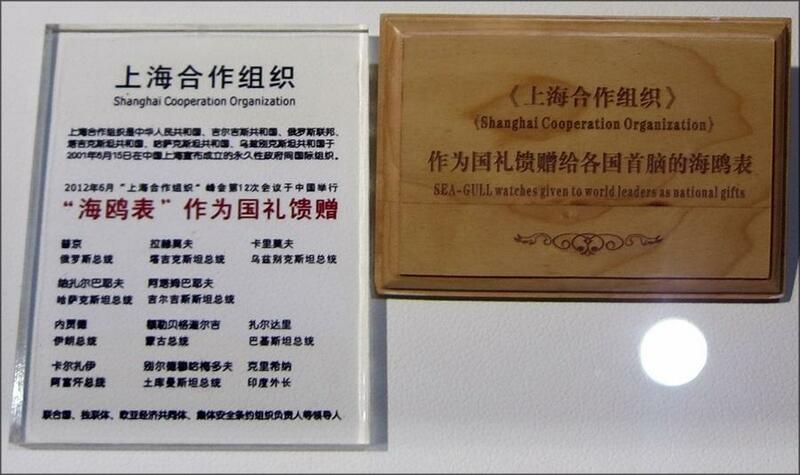 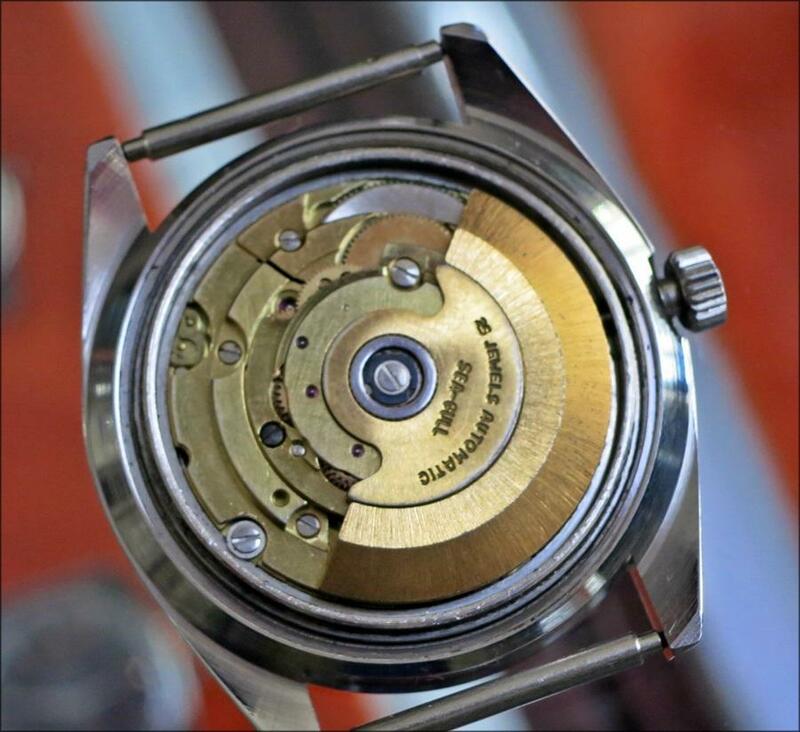 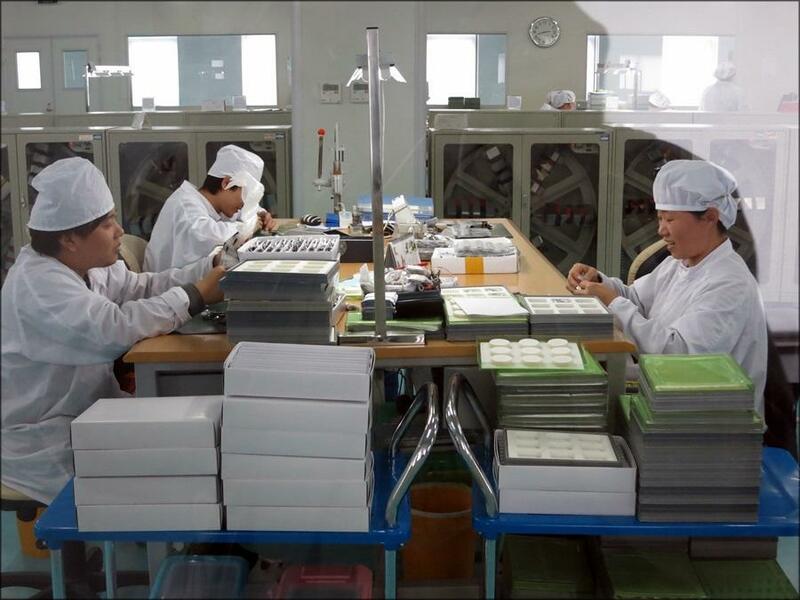 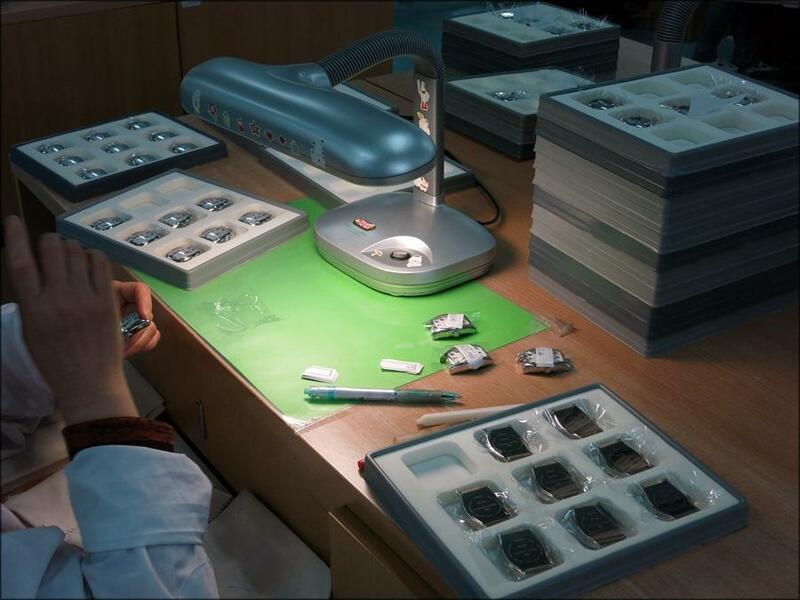 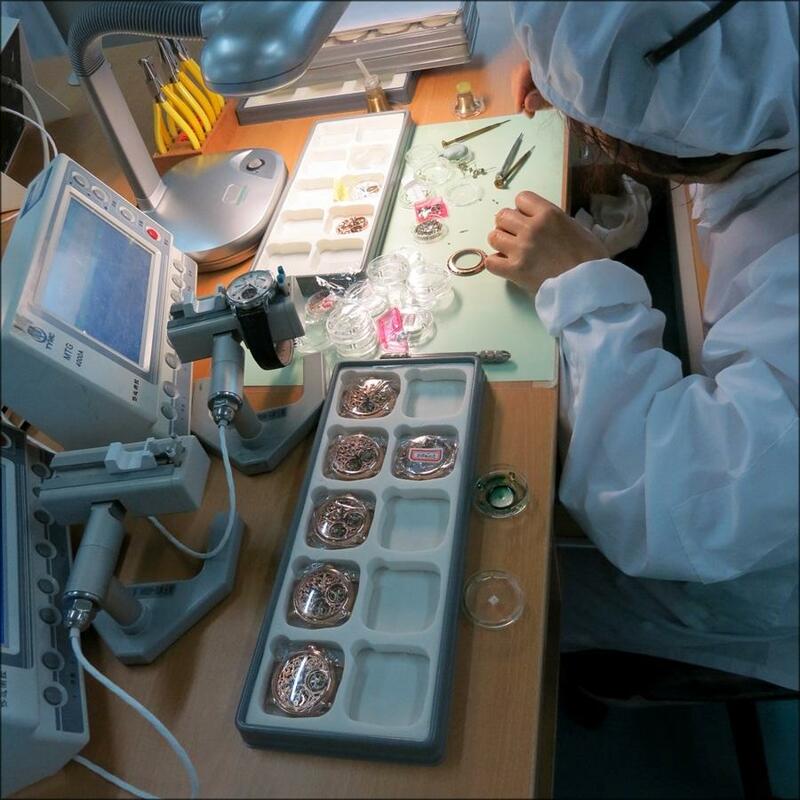 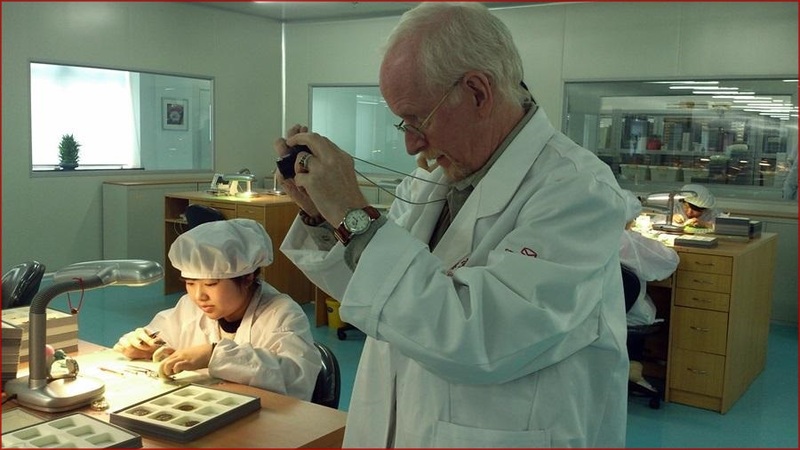 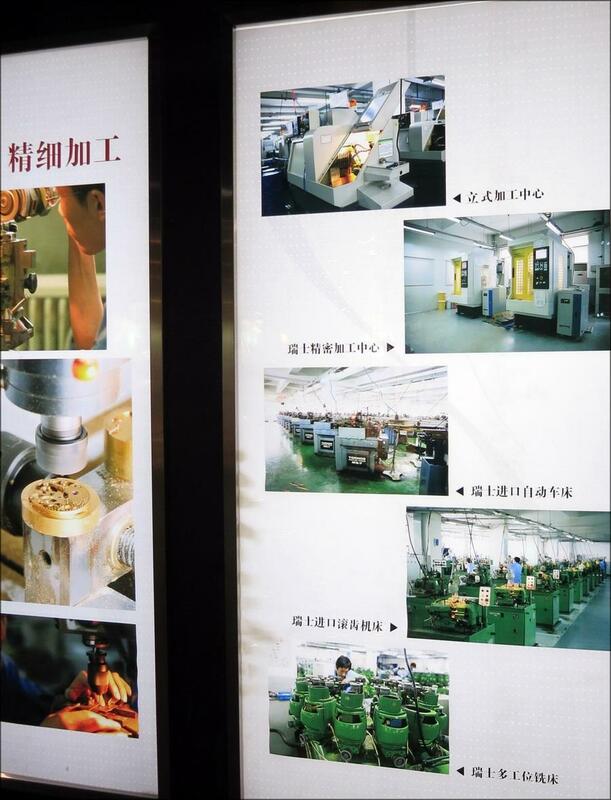 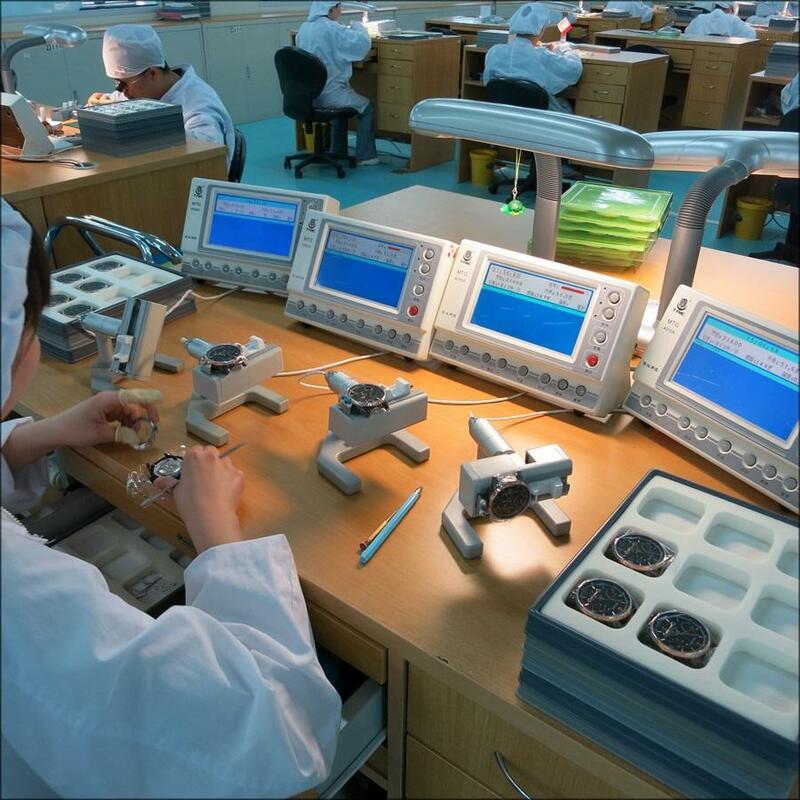 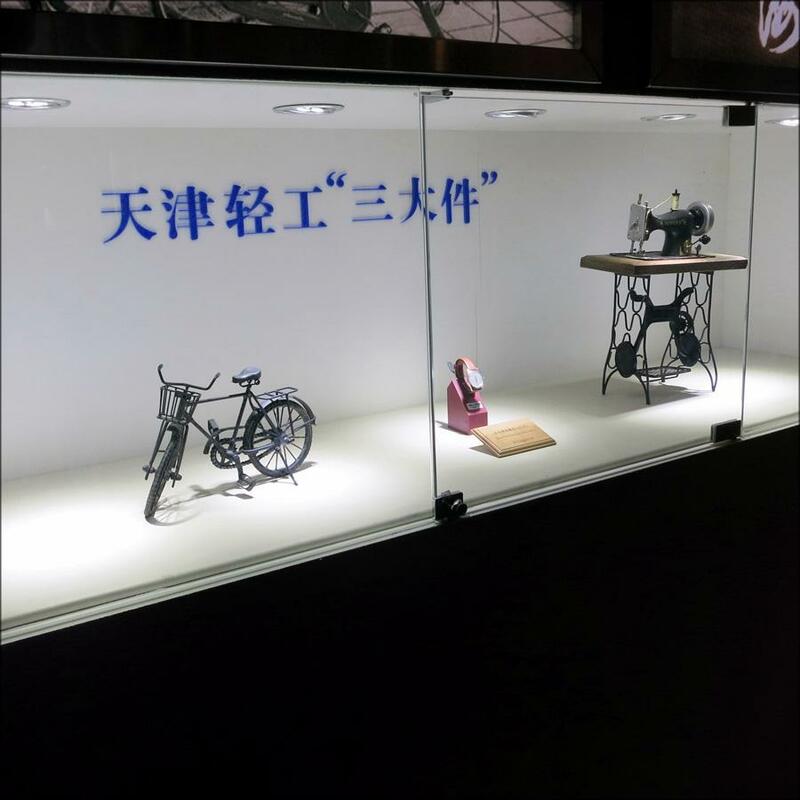 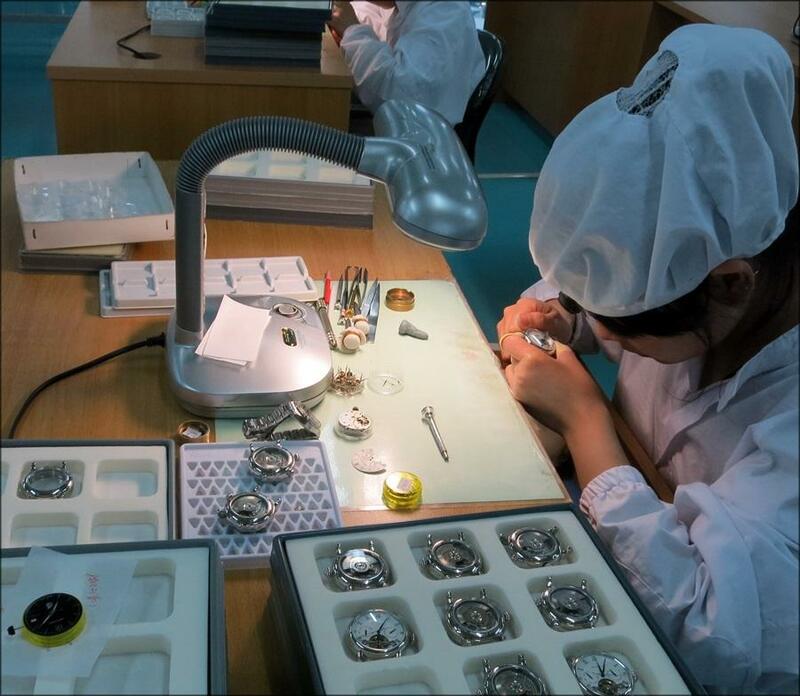 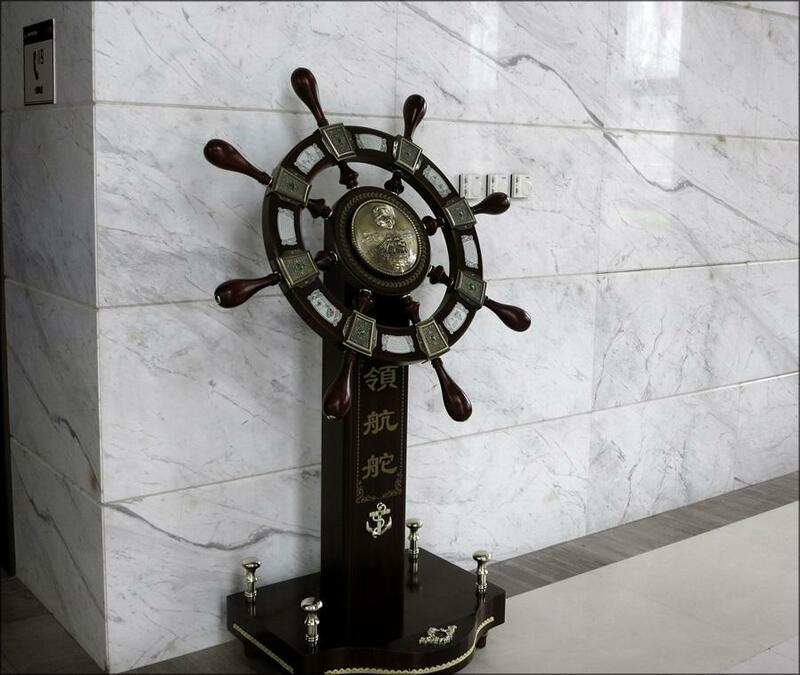 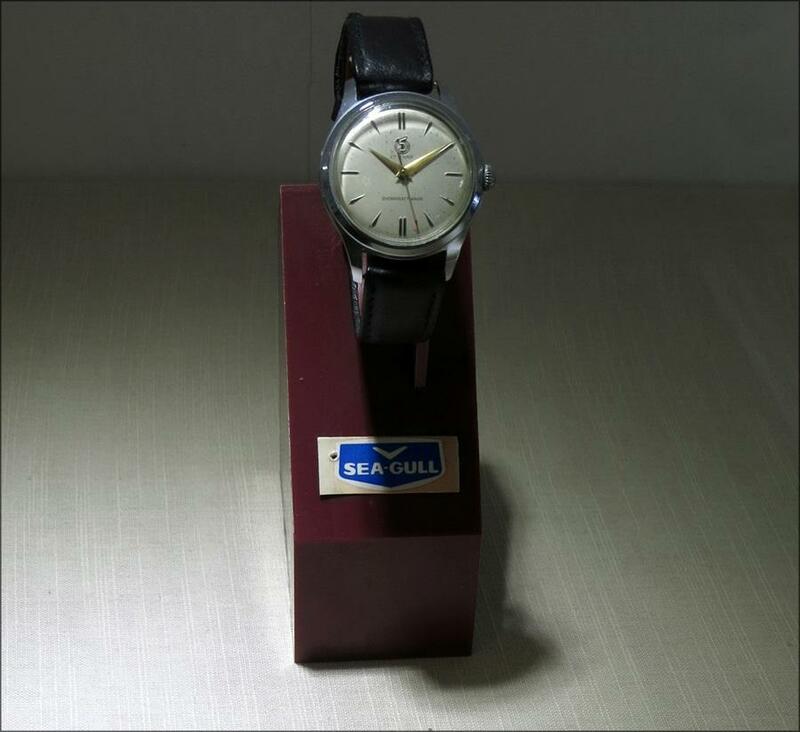 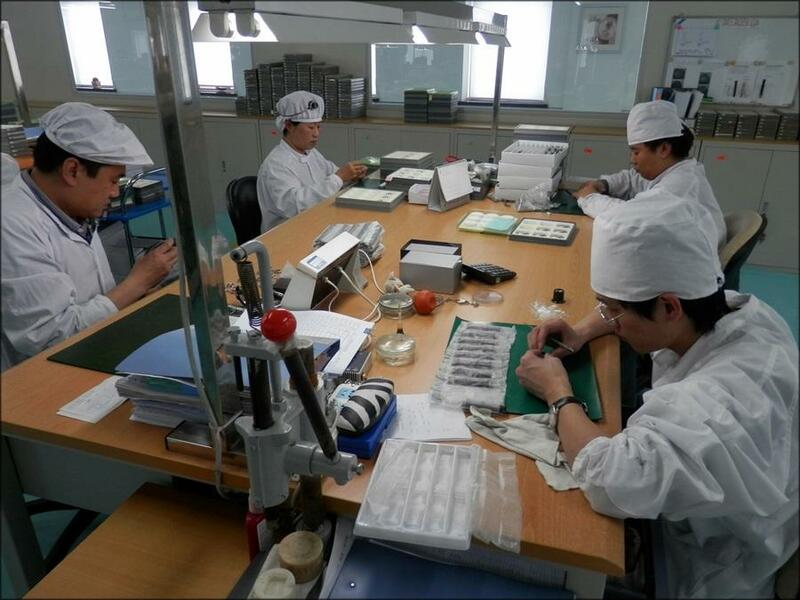 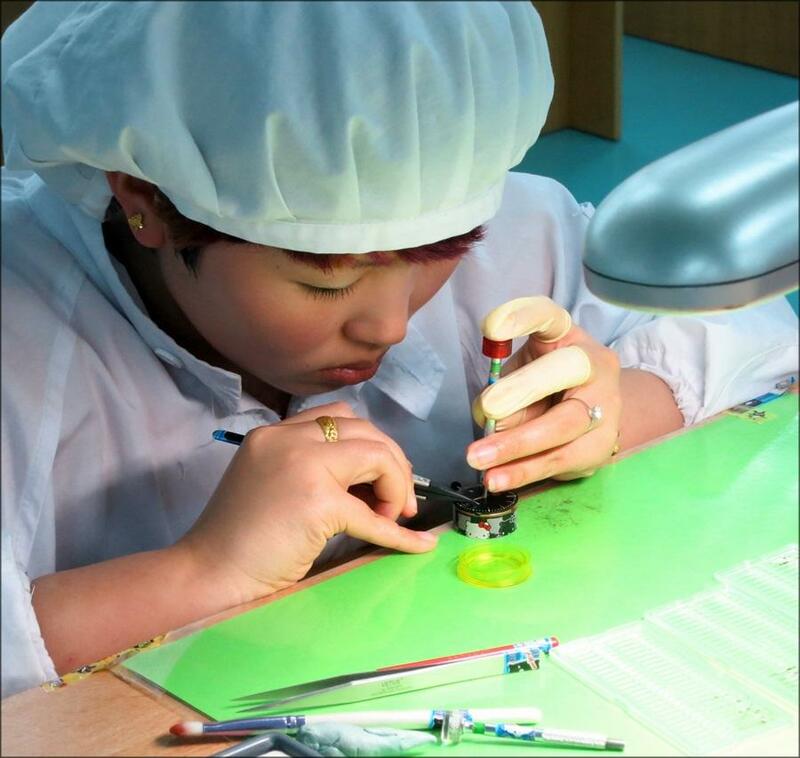 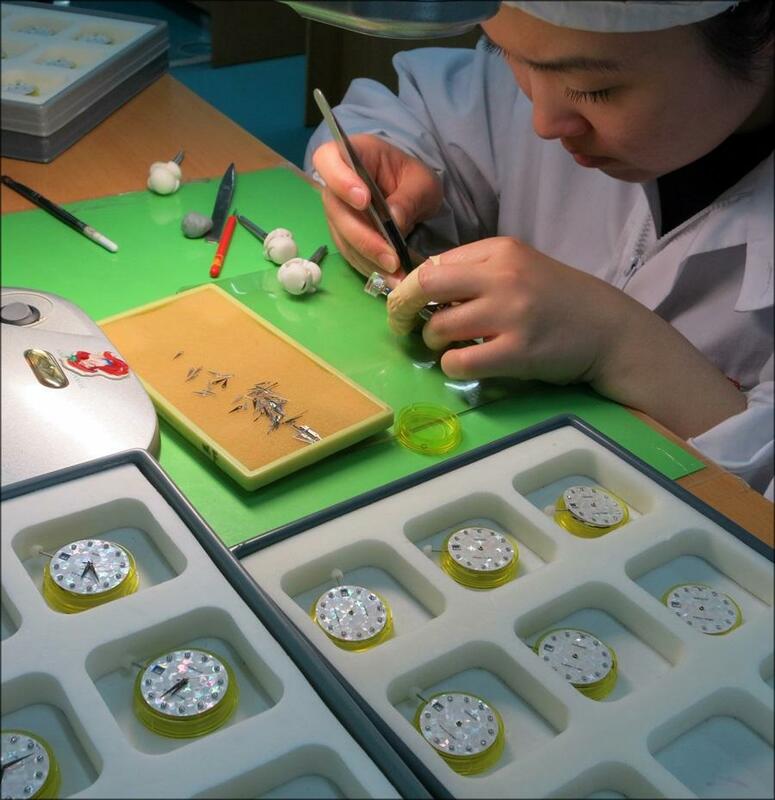 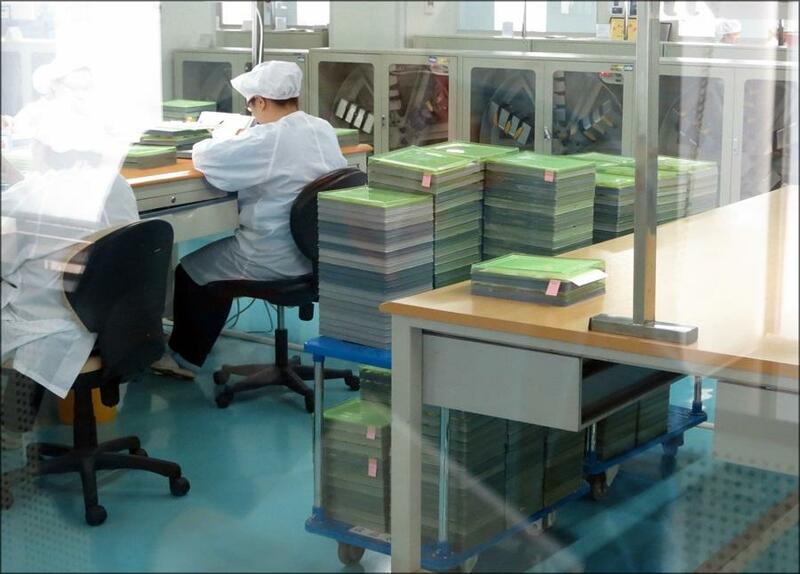 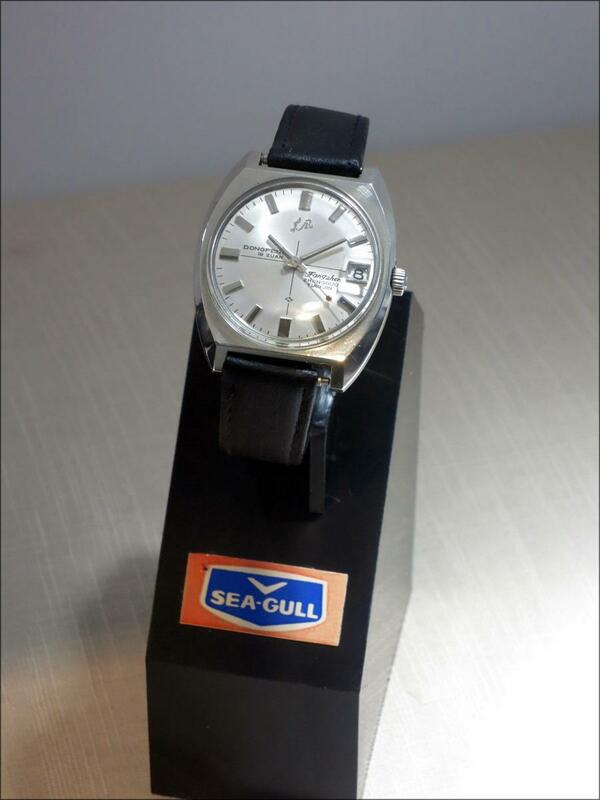 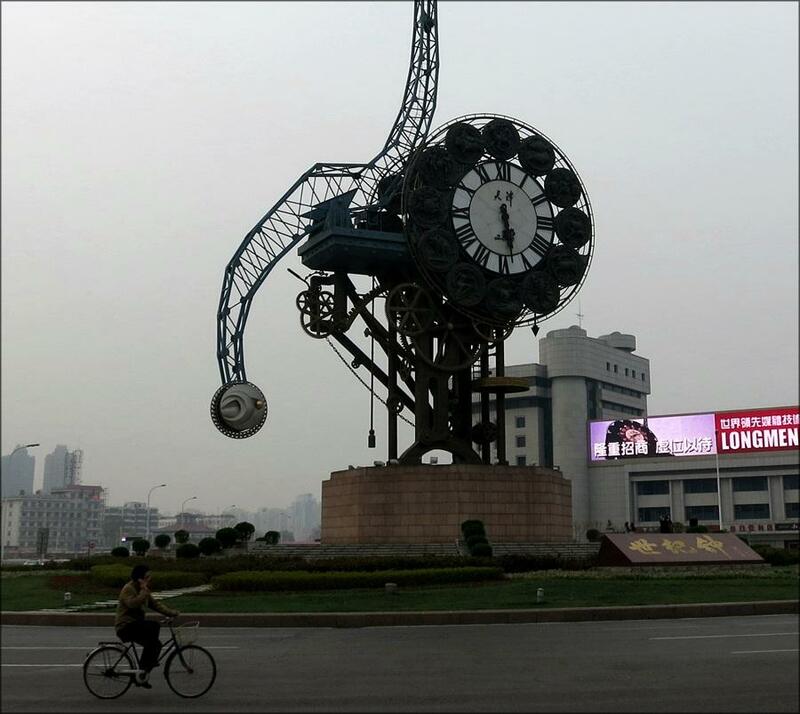 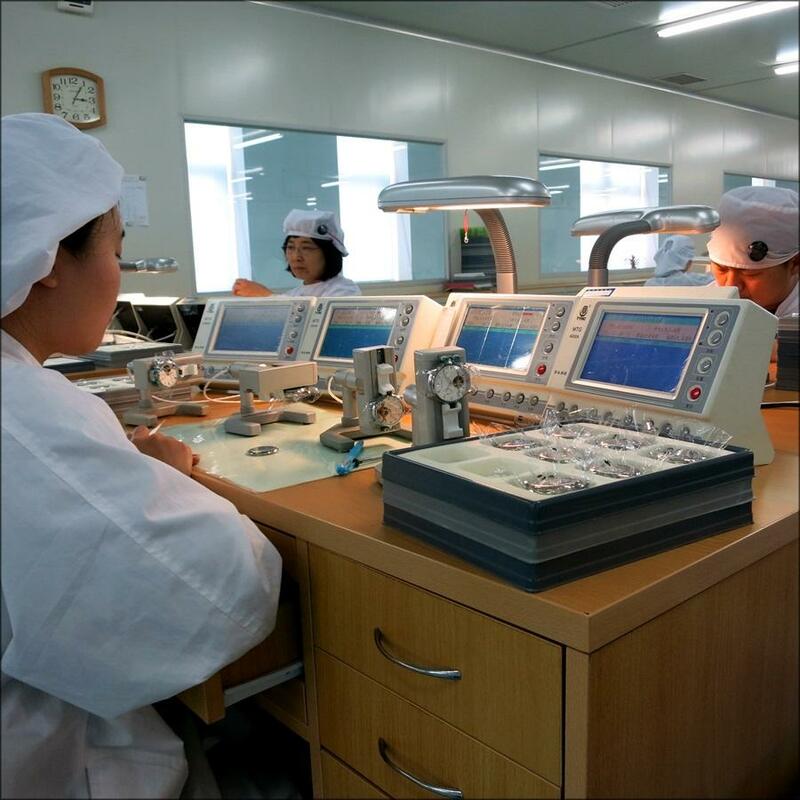 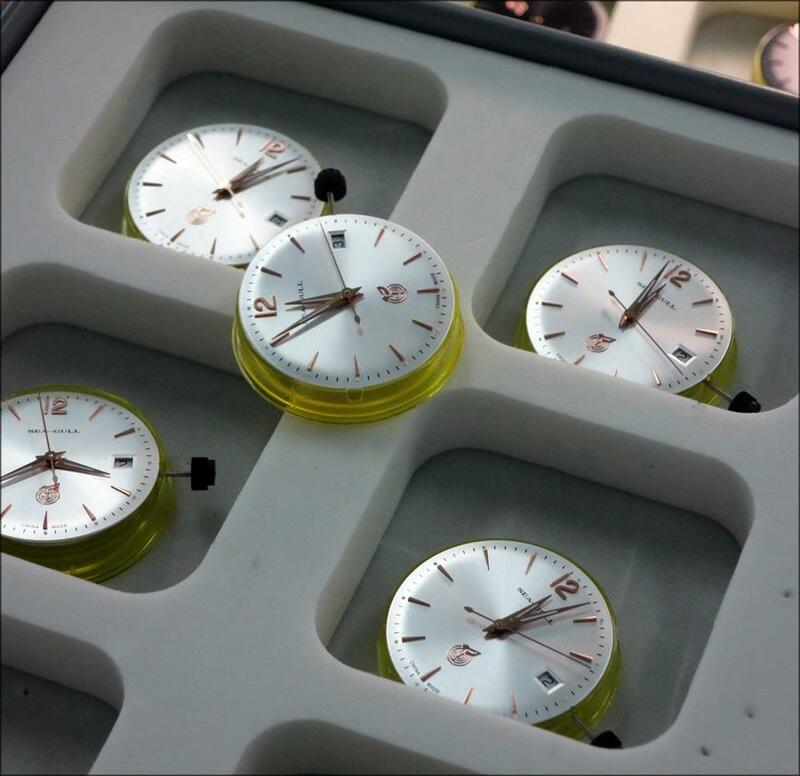 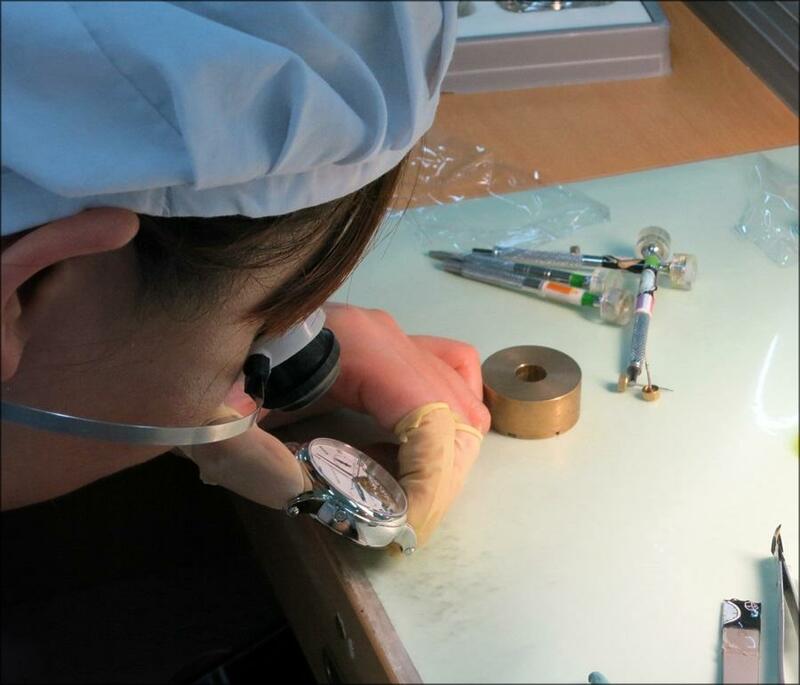 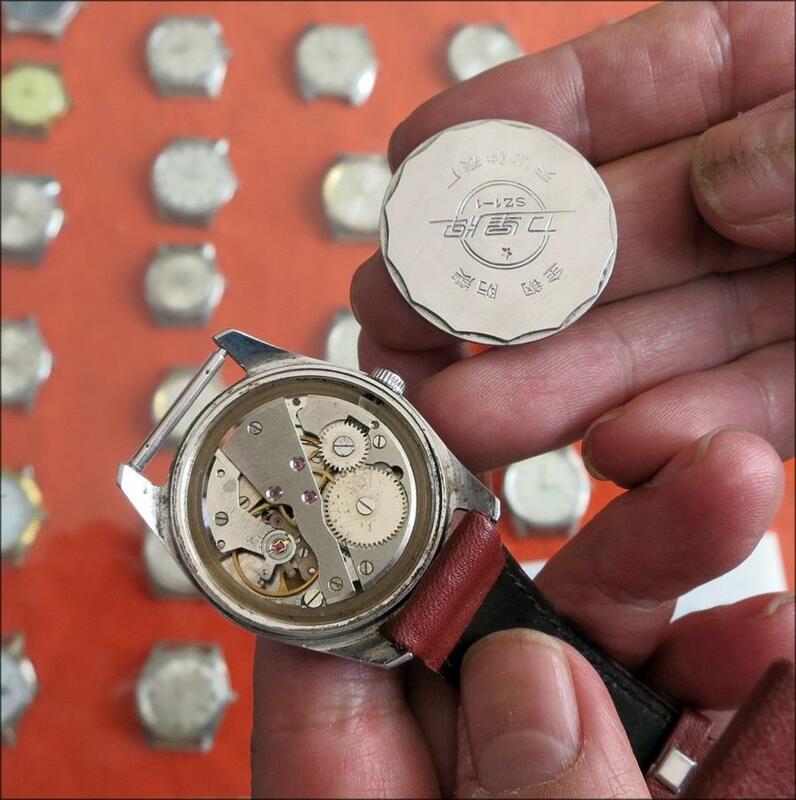 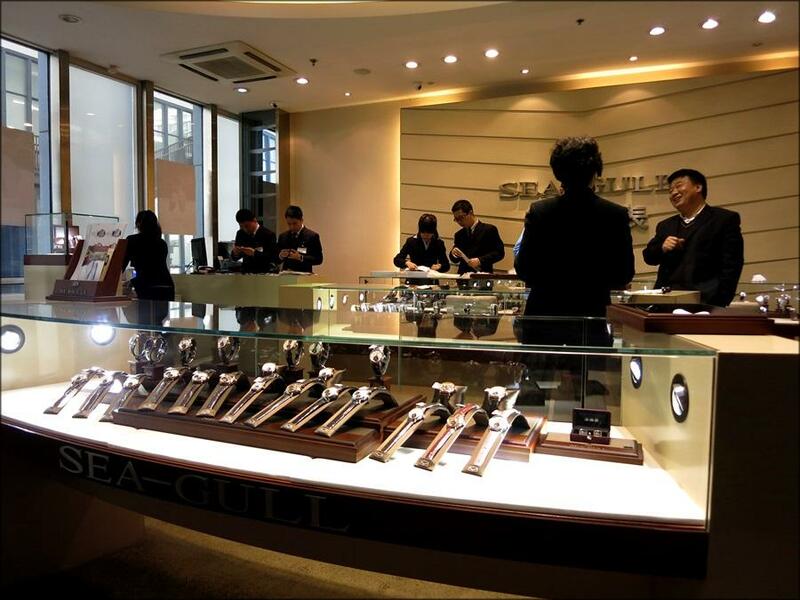 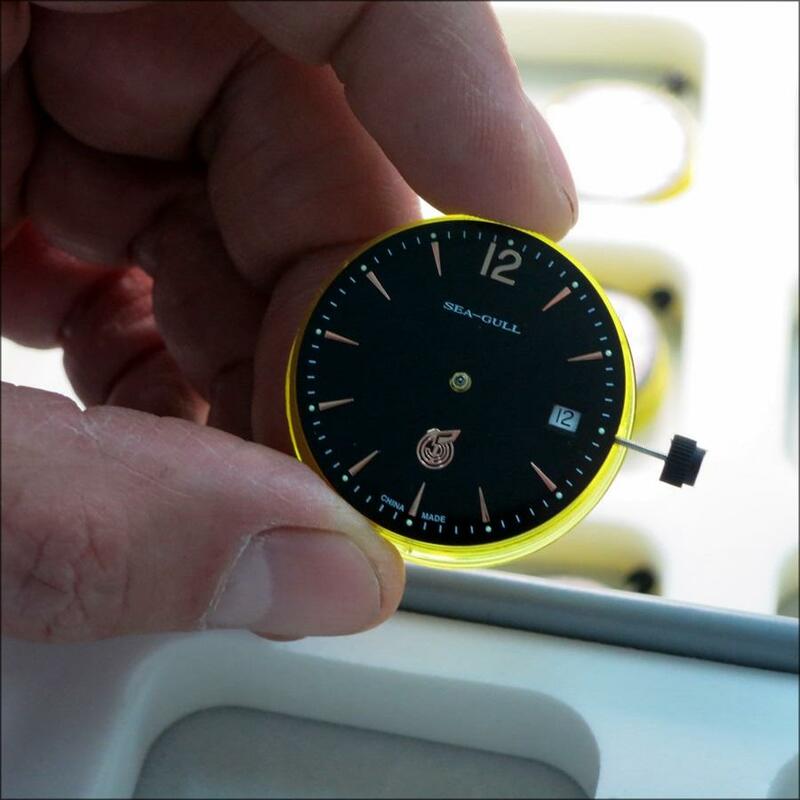 These first photos are taken in the Tianjin Sea-Gull Watch and Clock Museum and then, as with last visit, taken from the outside hallway that surrounds the positive-pressured and sterile employees-only assembly and quality control areas. 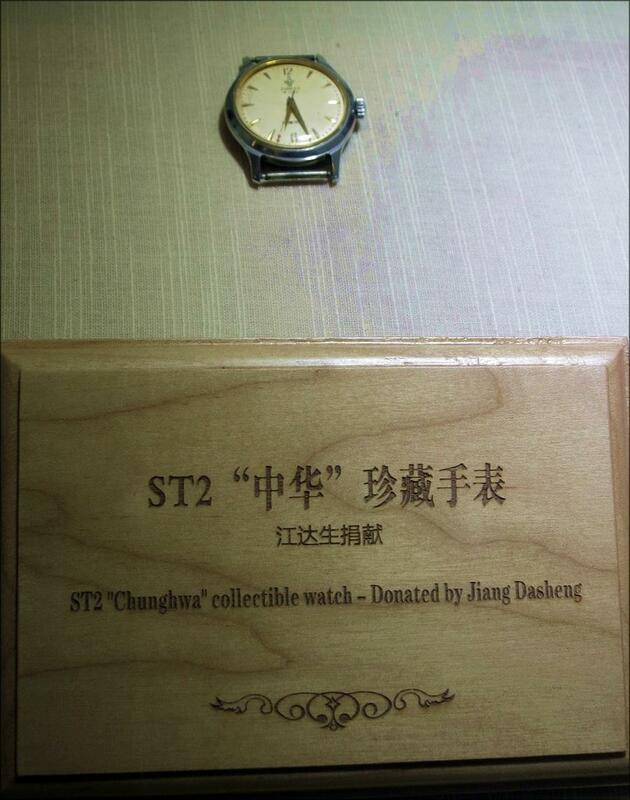 The next photos, especially, are only possible due to the remarkable generosity of Mr. Du Jianhe, who I noted is the Deputy General Manager of Tianjin Sea-Gull Watch Technologies, Co., Ltd. (aka "Boss Du" as he was very affectionately and respectfully described to me by his friend -- and my friend -- Marockong that I noted in my previous Tianjin Watch Museum post). 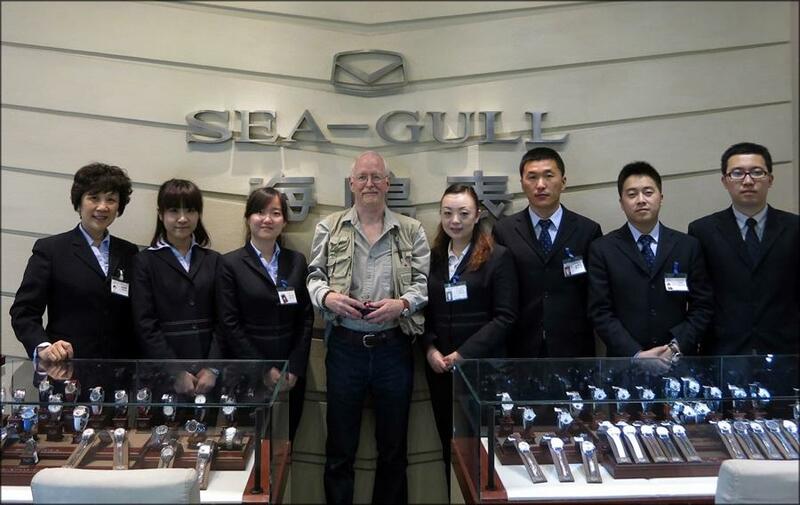 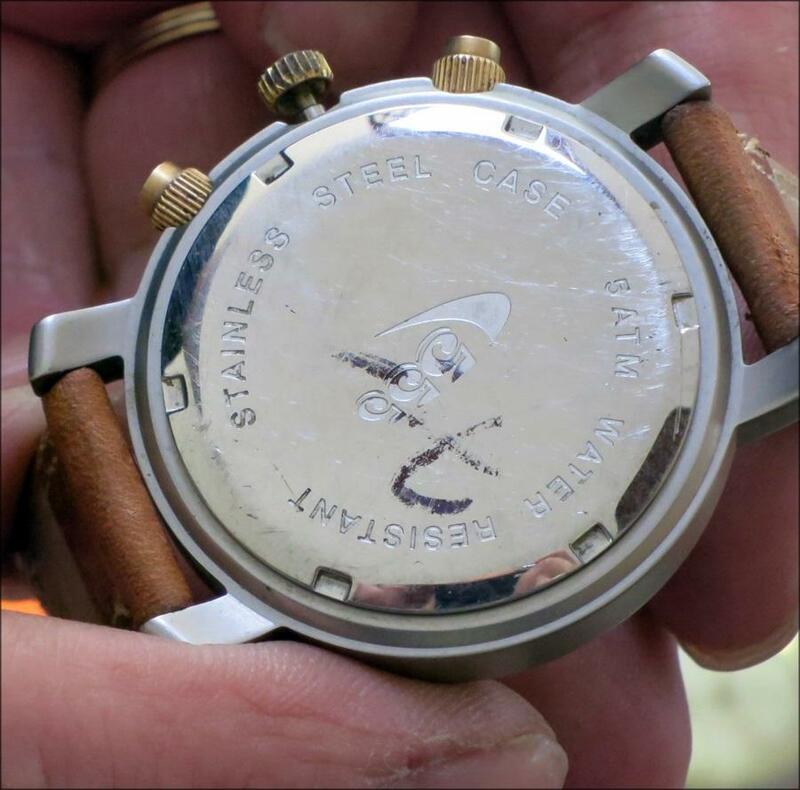 Mr. Du was described to me as having held executive level assembly and quality control positions at Sea-Gull since the 1970s. 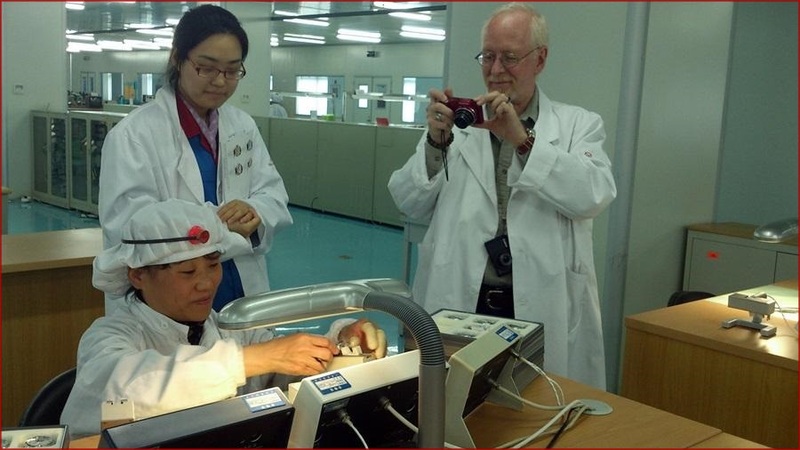 I had been taking photos from outside the sterile area when Mr. Du approached me and my guide, introducing himself to me with the help of my guide's interpreting. 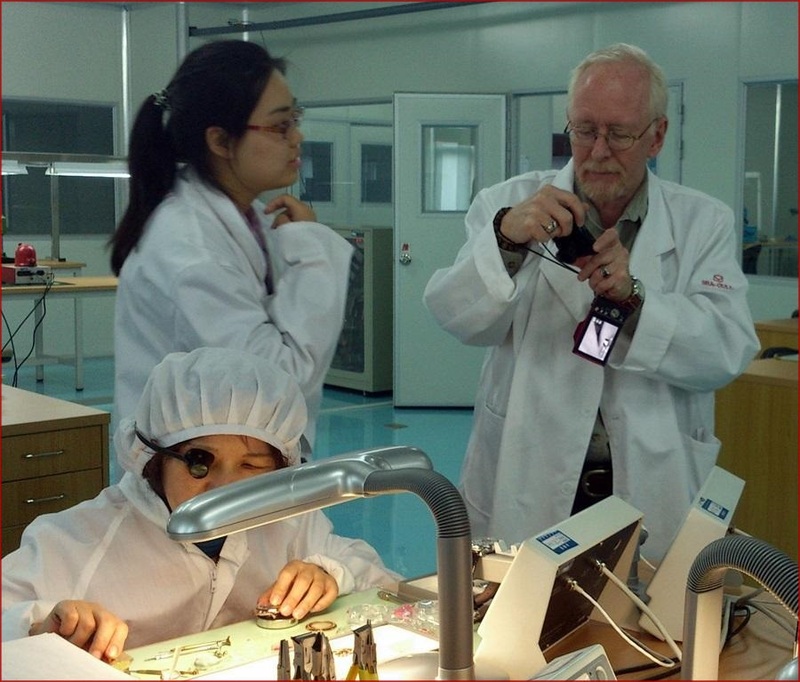 Mr. Du then explained the work that was done in the area and when I motioned as to take another photo through the separator window, Mr. Du requested we wait a moment. 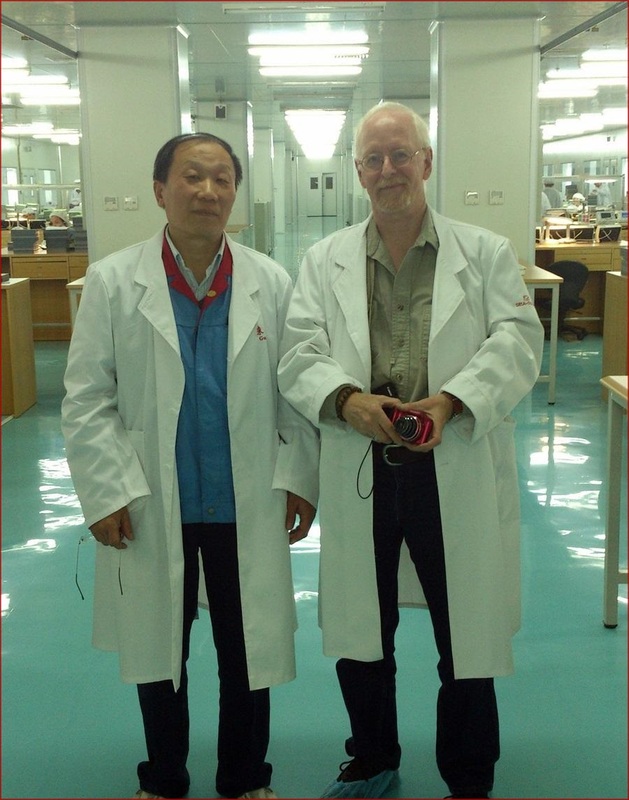 My guide on this factory tour, who among other duties had been guiding executive and guest tours of various types for two years, was evidently as surprised as I was when Mr. Du returned -- bringing us both lab coats and foot covers -- and offered me the very rare opportunity to take photographs from inside the employees-only area. 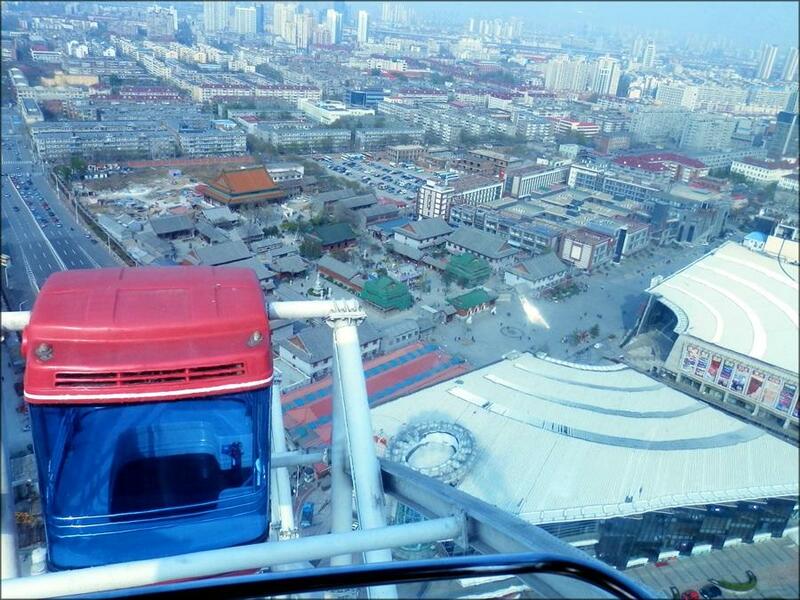 My guide stated that she had never been inside before either. 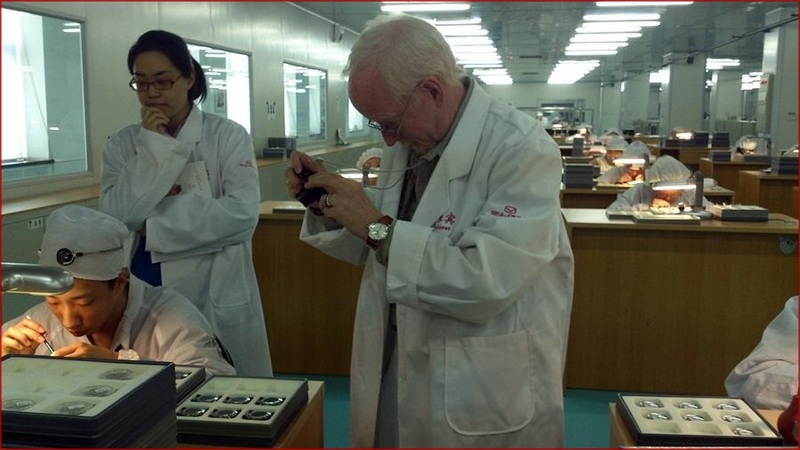 These shots with the red border were taken by Mr. Du and/or with Mr. Du's camera, and were provided to me by Mr. Du for use in this post. 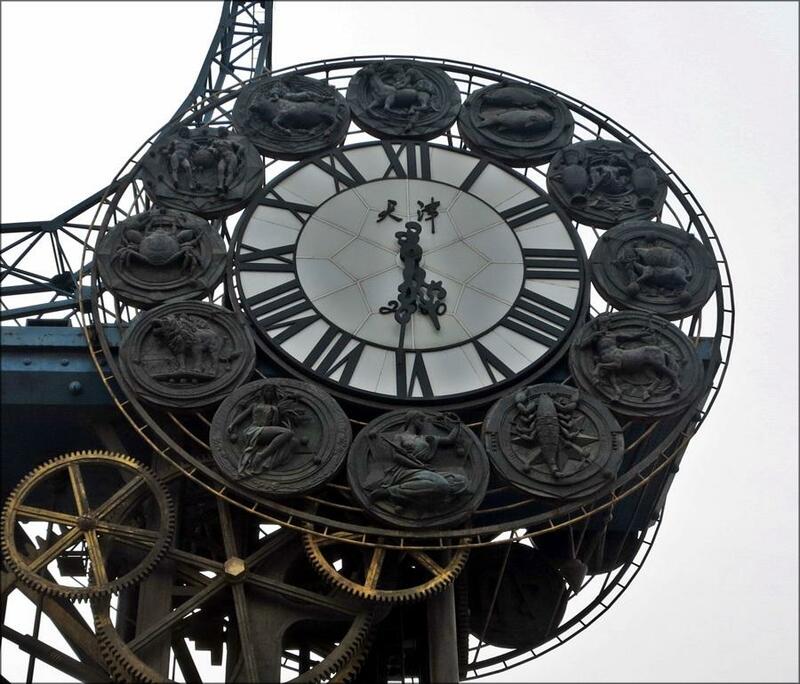 So...I'm utterly astonished, quite humbled, and very grateful that I've been made able to provide these photos. 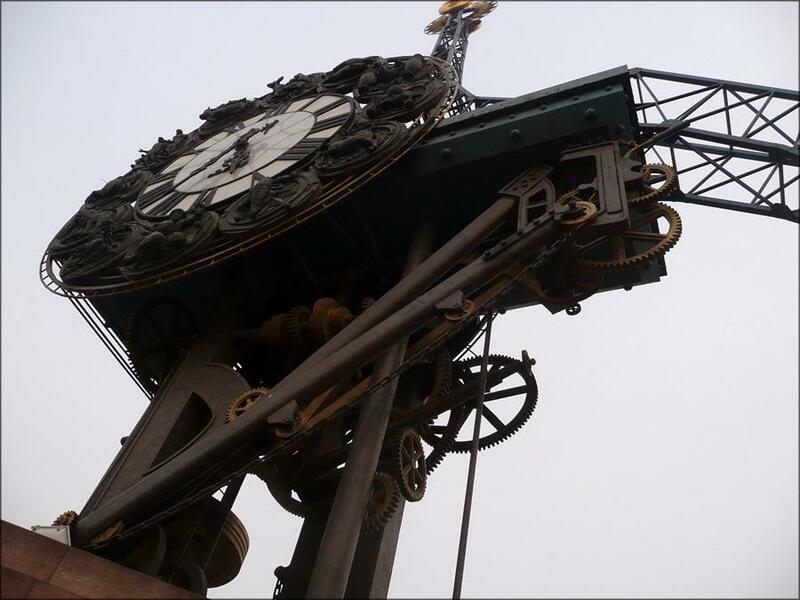 After I returned to my hotel from the tour (which ended sometime around 5 in the evening, and I got there about 10:30 or so) I grabbed a bite to eat and wandered around to 1) make sure I got a few shots of a very cool steampunk clock (actually called the "Century Clock") that I knew was about two blocks from my hotel, and that I also knew was about a half a block from the train station where I'd be catching the fast train to Beijing the next day, and 2) settle down from the day's activities...and the day's surprisingly kind welcome.